Yeah. It’s all too much. 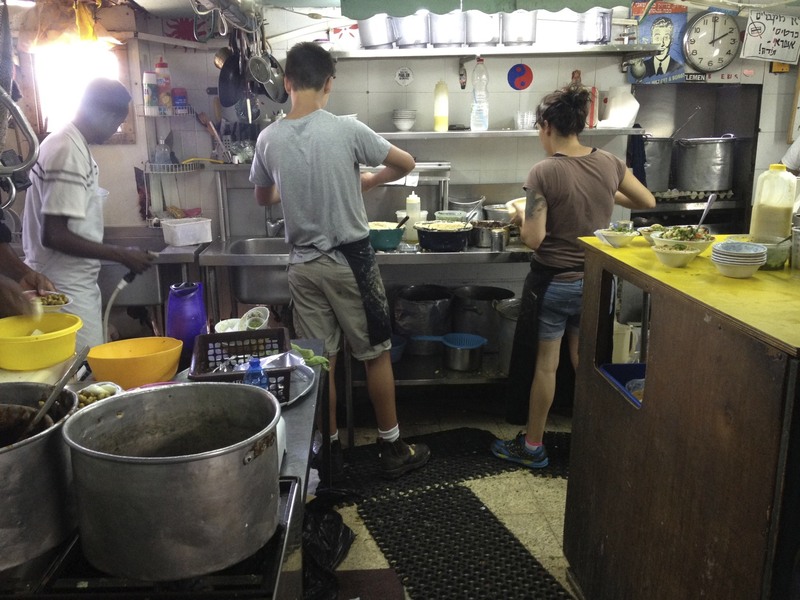 I came to Israel for the summer to work on one story. Now I have four. I have hours and hours and hours – maybe days – of tape that I will have to trim down to max 15 minutes. And in my last week here, I’m running around like a madwoman collecting more. What am I thinking? As usual, my eyes are too big for my stomach (and for my brain and hard drive). Too much is overwhelming, but usually I don’t regret going for it. Sure it was stressful for you to shuck all that corn the night before a big trip, but look at all those kernels you have in the freezer! The possibilities are endless. What a privilege! Privilege. I move across walls and worlds; I ask questions that many wouldn’t dare ask; I’m learning how to trust myself. My government and my family do not control what I choose to do or say. I was not born a refugee and I was not born into a climate in which my life was threatened daily. I am allowed and encouraged (!) to think critically. Feeling safe and free are the keys with which I access this world of too-muchness. I am grateful for these privileges. I try not to take them lightly and wow, the heaviness gets to me. 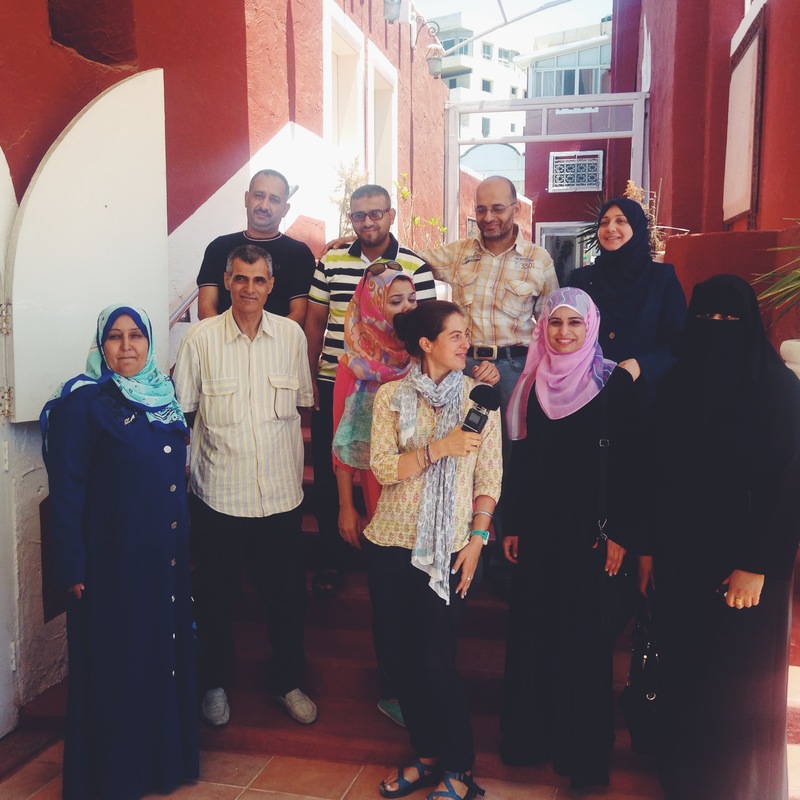 I went to Gaza last week for interviews and came away with a positive impression of the people I spoke with. 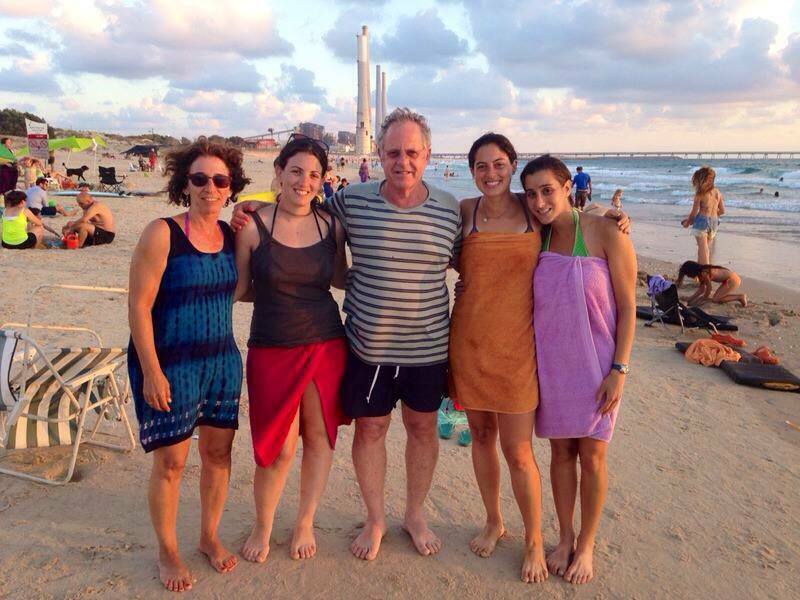 Afterwards, I spent the weekend with cousins in Israel. One of them, my age, said that she will always love me, but that she does not appreciate the way I see the circumstances. I told her that my empathy for people on the “other side” does not mean that I am critical of her or anything that she has done in the past. Still to her, my actions are a slap to her face. We talked it out and our relationship is closer than ever, but I still feel sad that despite my intentions, my actions can hurt the people I love. 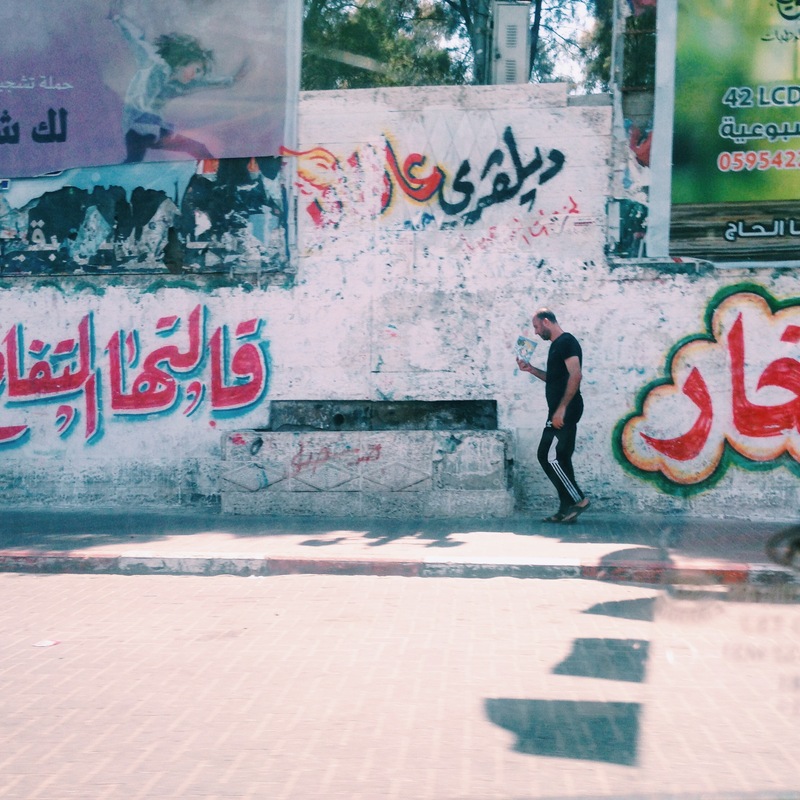 In Gaza City, graffiti messages cover almost every public surface. 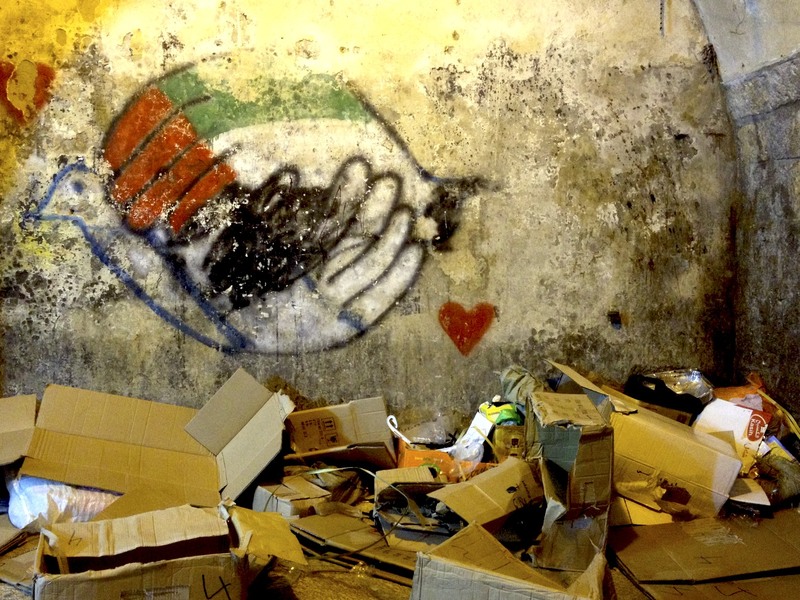 The graffitis include love notes, taxi numbers, reminders of 27 (years of Hamas), wedding announcements, religious verses, memories of catastrophe and war. My privileges allow me to believe that basic human understanding can make the world a safer place. I think I can empathize with the reasons that people are critical of this, with how people can label it as childish, with attitudes of defense and anger towards it. For many, an attempt to understand “the other” can be scary and even life-threatening. My world is cushioned with clouds of security and safety… I know I am naive. But, in this climate of meaningless bloodshed and loss, I do not see a better option than to try to promote understanding. My goal is definitely too much. So it’s only natural that I’m going for it. 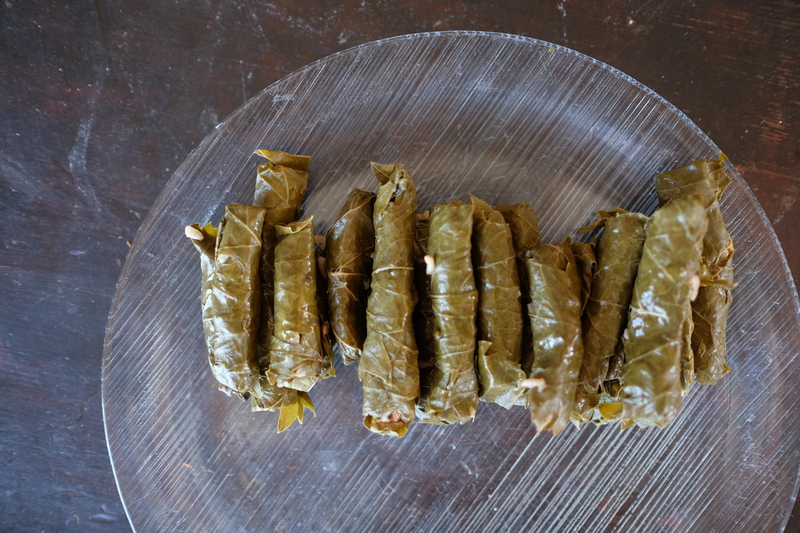 The recipe below is for the Palestinian version of dolmas. 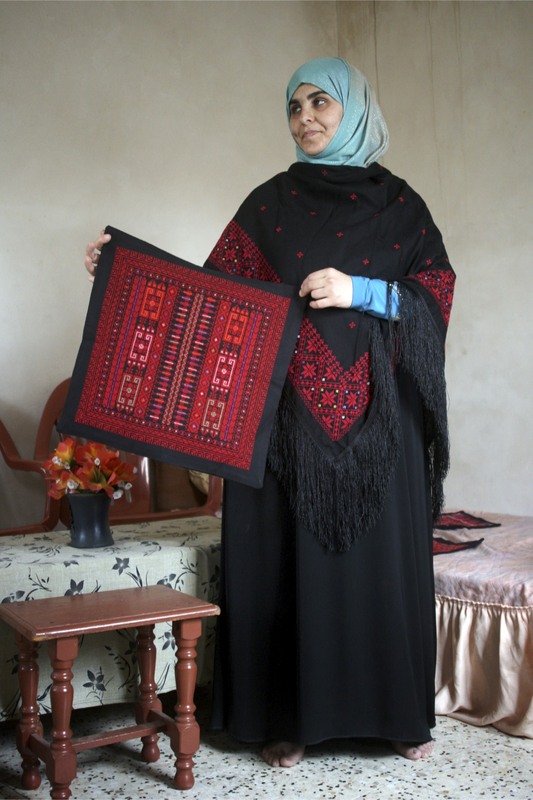 Najla, the star of the piece I wrote last winter, makes hundreds at a time, and (similar to the embroidery) she sells them to Israelis via Yael. Usually, it takes her 3 hours at a time to prepare 350-400 pieces. 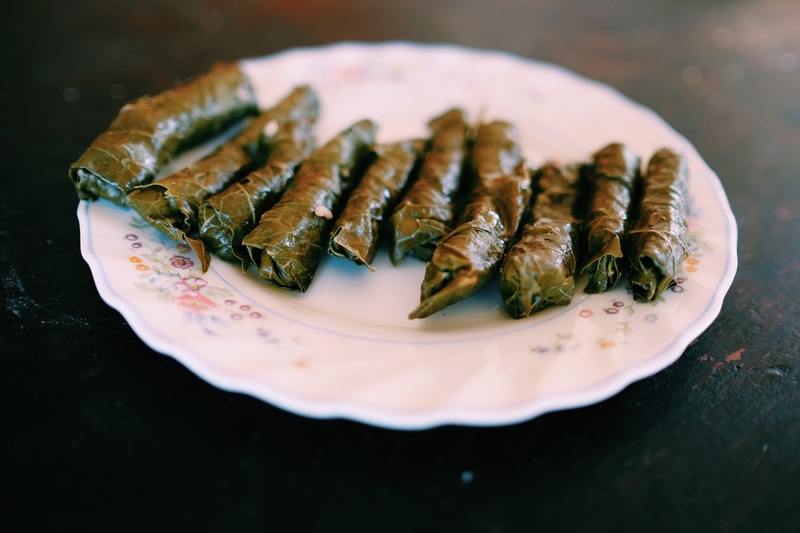 I’m used to eating dolmas that are stuffed thick with one inch or more of rice. 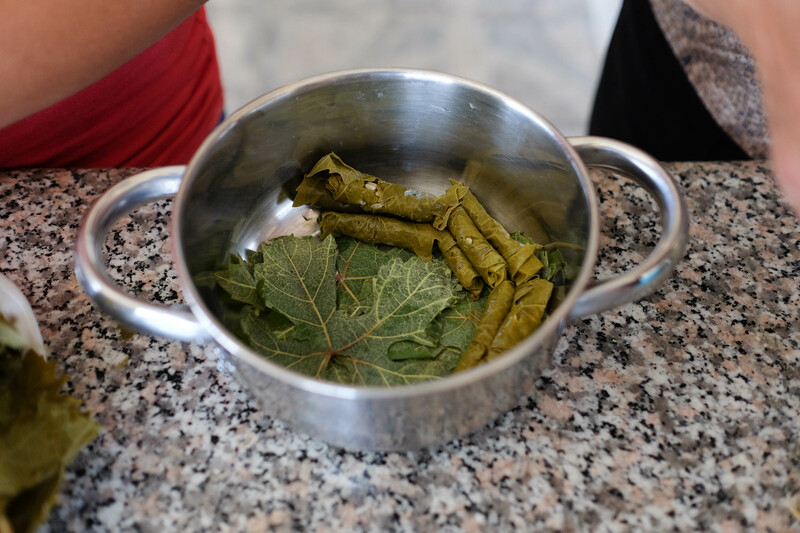 Najla’s leaves are much tastier – she rolls them thin like pencils so that they’re mostly leaf with only a hint of gooey rice in the middle. I asked Najla to line up the spices so I could take a picture for memory. She laughed and said that it doesn’t really matter what spices I use. 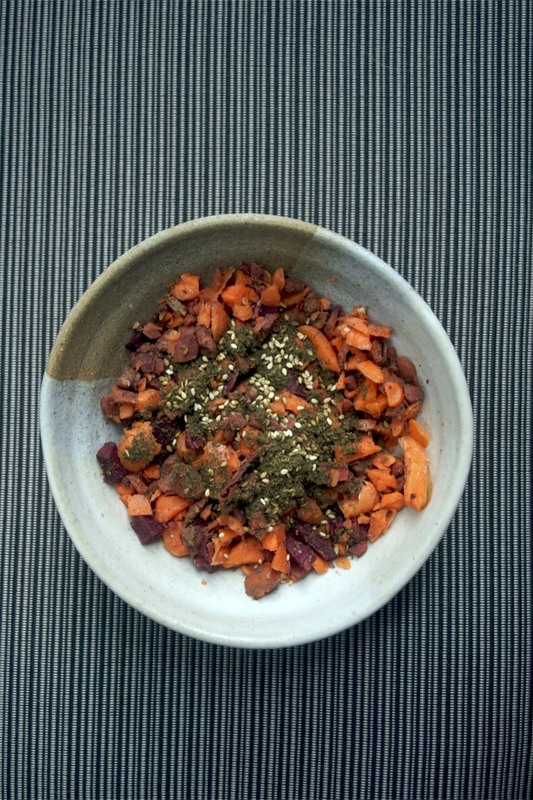 Whatever she has in the house, she said, is what she throws into the bowl (she also threw in a tsp of parve Osem soup powder, a staple in our kitchen). I told her that I cook the exact same way, but that I had to at least pretend to have exact recipes so I could post them to the blog. The crucial spices and herbs include mint, parsley, nutmeg and garlic. GARLIC. 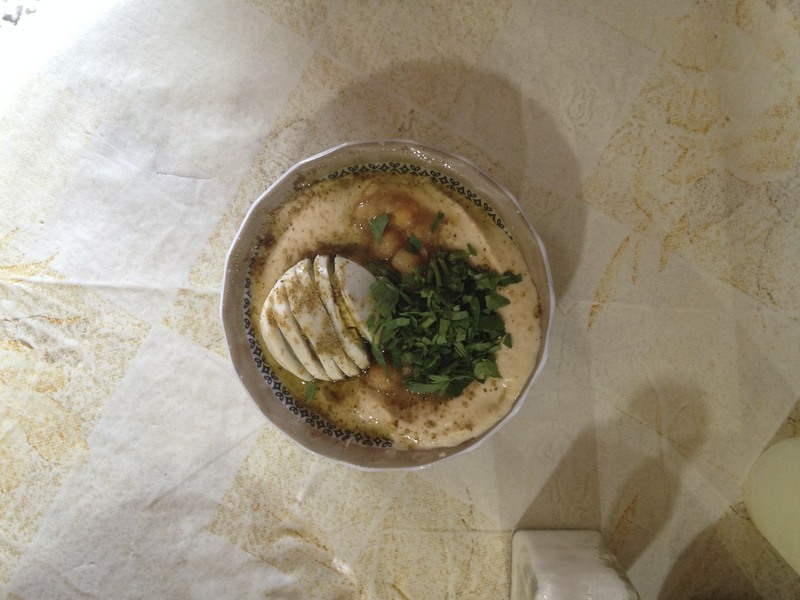 When Najla sent me back to Jerusalem with a small pot of rolled leaves, I smelled so strongly of garlic that the officer at the checkpoint did not wait for me to dig around in my backpack for my passport. He let me go without even seeing it… That was a first! *If you can’t pick em fresh like Najla does, you can buy canned or frozen grape leaves from a Middle Eastern specialty store. Rinse one cup of rice and place in large mixing bowl. Add oil, tomato, onion, garlic, herbs and spices. Mix together. 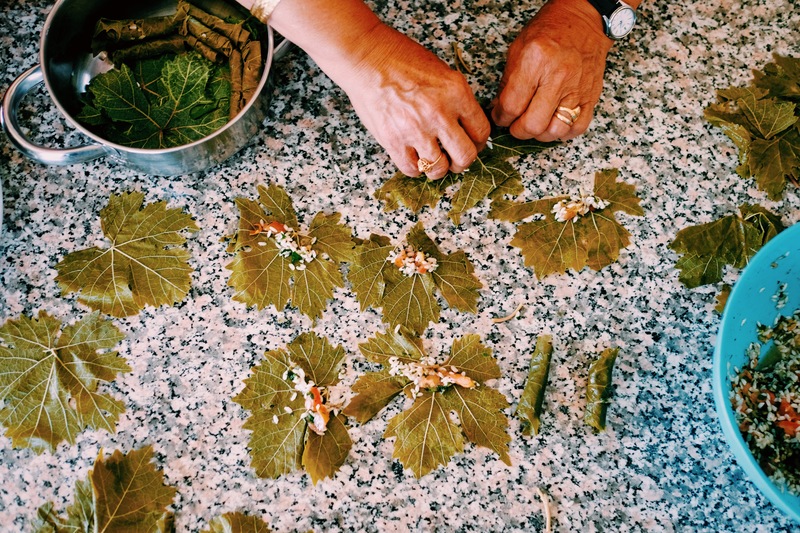 Lay grape leaves smooth side down. Sprinkle a pinch (really, a teeny amount! See picture) of rice in the bottom of each leaf. Roll the leaves from bottom up keeping the edges inside. Imagine you’re rolling a burrito for a Barbie doll. As you roll the leaves, try to keep the edges right. This may take practice. 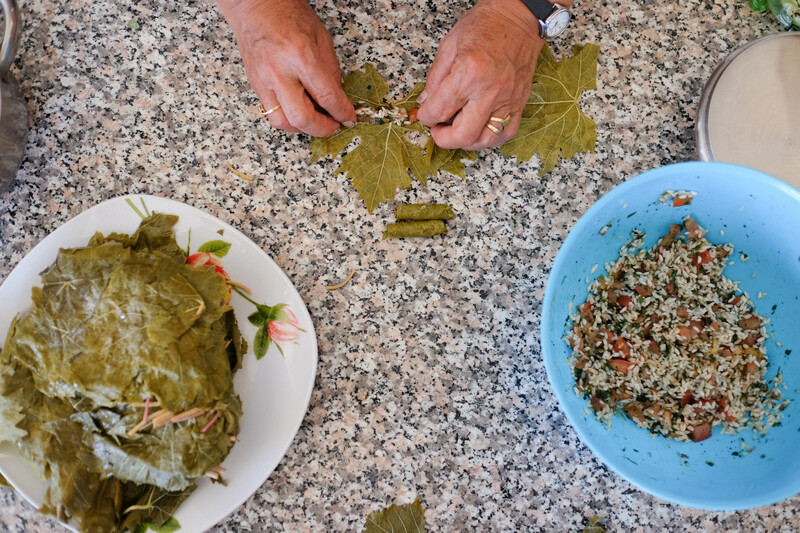 Line the bottom of a small pot with 4 -5 unrolled, flat grape leaves. 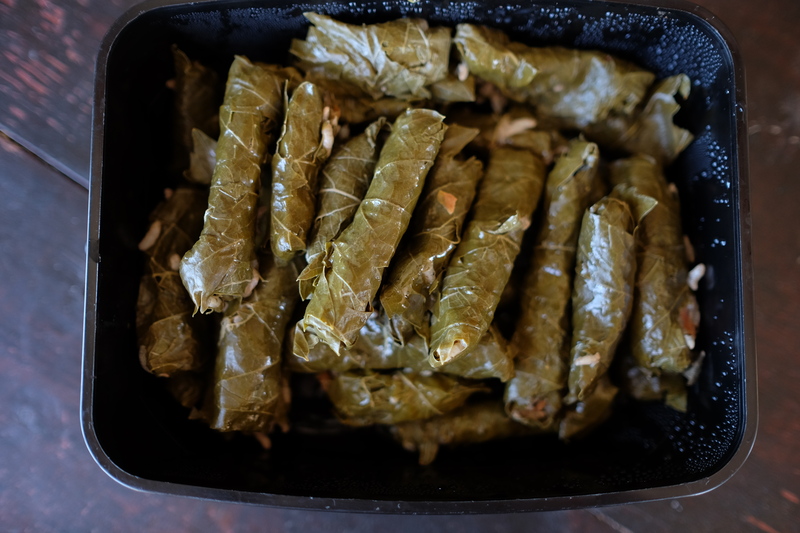 Stack the rolled grape leaves on top of one another in the pot. Add one tsp olive oil. 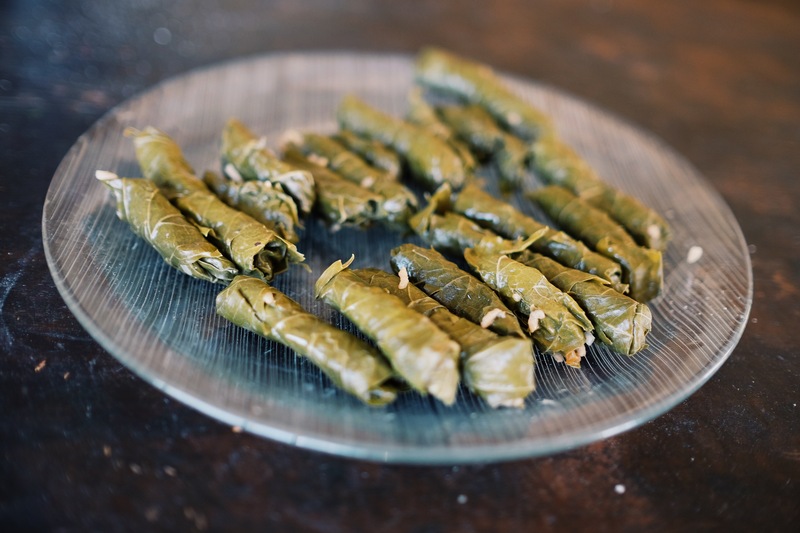 When full, cover the rolled leaves with an additional 4 – 5 flat leaves. Add water until leaves are submerged at least one inch. Cover with lid, bring to boil and reduce to simmer for 45 minutes – 1 hour. 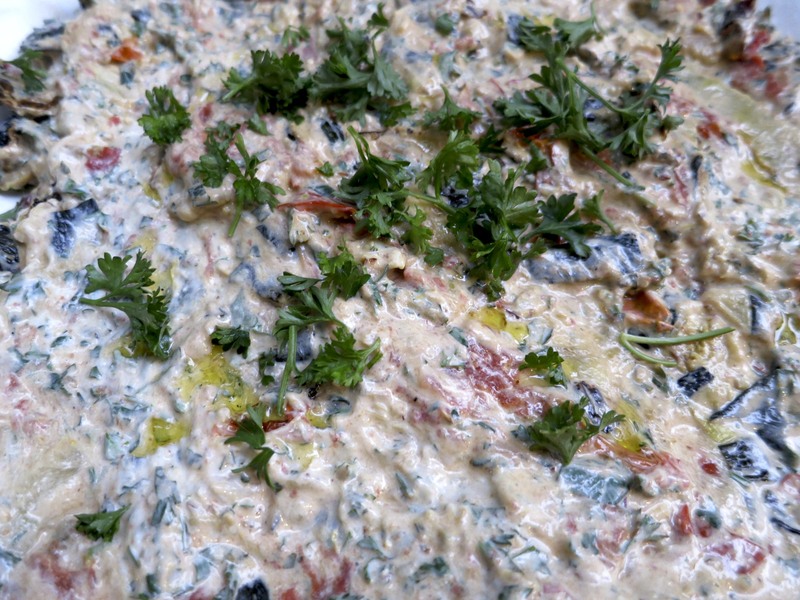 Serve with tahini, labne or greek yogurt! 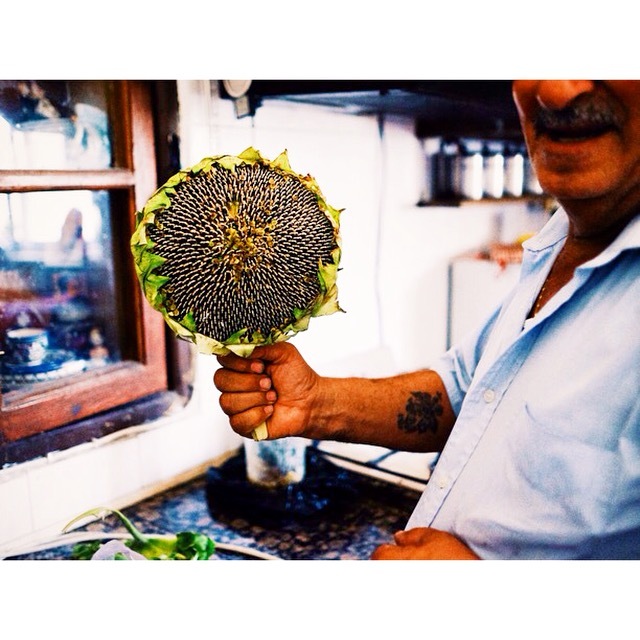 Above: Najla’s husband gave me a sunflower with fresh seeds! She said to wash them with salt and put them in the sun to dry, but I ate most of them raw. 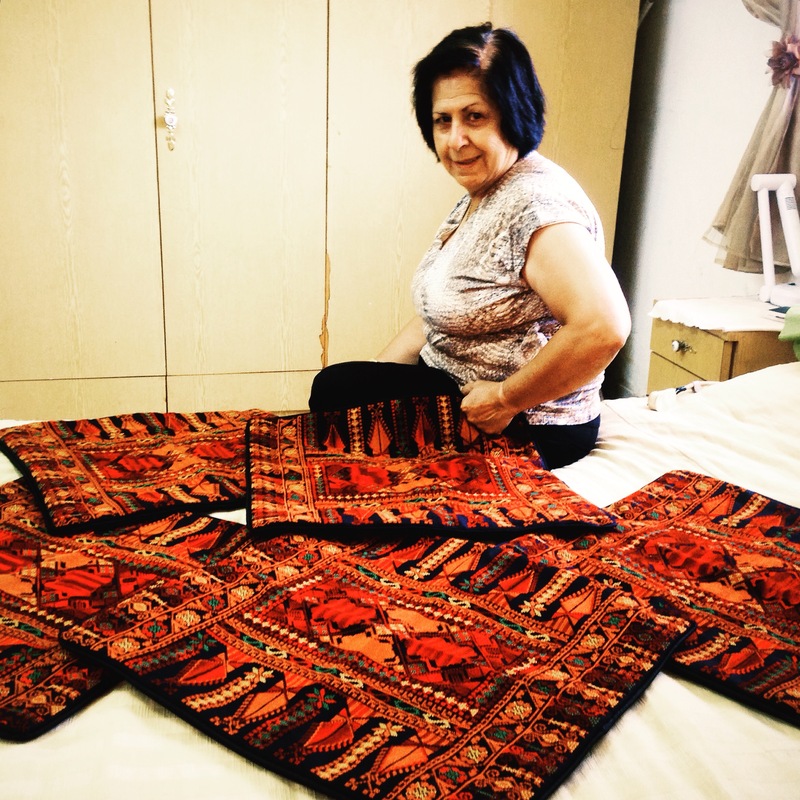 Below: Najla and the newest embroidered cushion covers from the Beit Sahour collective. The pieces are called “Magazine” because the women found the design in a magazine. Get a grip. Seriously. If you’re going through life desperately worrying about the invasion of inexplicable life altering tragedies, then maybe you have… like… a problem. I worry too, but, as I explained in my previous letter, I’m tryna stick with things that are productive. I worried about getting to the airport with enough time to go on a fancy lotion sampling tour at Duty Free after security. It was a productive worry – it made me wake up to my alarm (and every hour for 3 hours before it). Now I’m sitting on the floor, charging my computer and waiting to board my flight out of Israel. My skin is all greased up with an estimated $50 of moisturizer (does anyone actually buy such expensive lotions foreal?). I’m about to board the plane, but it doesn’t feel like I’m leaving. I’m at ease. Maybe it’s because I’m in denial, or maybe it’s because I know I’ll be back. Maybe I’m actually a little ready for a break from constantly untangling my brain from the mess it absorbs from media, friends, family, cab drivers, vegetable-sellers, professors, twitter. I know this mess won’t go away once I’m out of Israel… that it will become more intense as I’m expected to answer questions about rockets, airstrikes, tunnels, Bibi, #IsraelUnderFire, #GazaUnderAttack, Palestinian identity, Jewish identity, Jerusalem clashes, UNRWA, Shujaiyya, Sderot, soldiers, sirens. I’m happy to share my reflections, but please know that I don’t know anything. My opinions are few and my certainty is limited. My certainty is limited to my favorite hummus places (Blue Bus and the place off Agripas with bright colored plastic boxes for seats), where to buy the freshest nuts in the shuk (the guy after halva king and before the cheap herbs on the left if you’re walking towards Yaffo in the covered side), the best jogs (Tel Aviv’s Tayelet, Jerusalem’s Tachanat Rishon and Har Eitan), the tastiest salads (Orna v’ Ella in Tel Aviv, Nodir near Bezalel), most beautiful hikes (haaj from Jerusalem to Jericho), and which professors to avoid at Hebrew U (will remain unnamed). I’m certain that my gratitude for family who allowed me to really be family will be forever; that roommates can be family too; that my classmates provided more education than my professors; that Jerusalem attracts straight-up weirdos (I like them anyways); that friends are important; that feeling Shabbat is a special thing; that Jerusalem, for better or worse, is much more than a city and place. It’s been quite a year. Thanks in advance for preparing for my return with my favorite foods and clean sheets… In that sense, I guess your worrying is productive (or it at least works out in my favor). Can’t wait for a haircut, massage, hot bath and all the things that will help me restore energy to dive into another intense year of unknowns. I’m just four take-offs and landings away! Til then, hold yourself together. 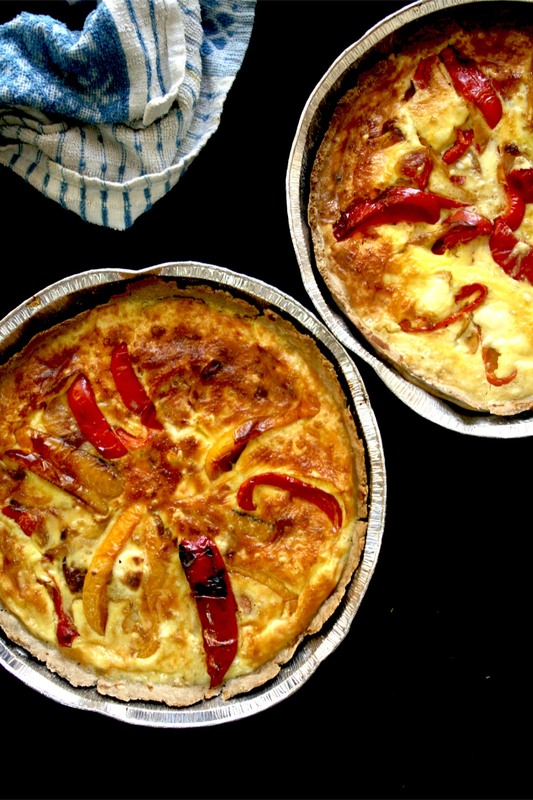 Today I will post two recipes – one dedicated to family: Nurit’s Red Pepper and Goat Cheese Tart, the other dedicated to friends: Zesty Sorrel Pesto. As you know, the last month or so was a bit stressful and weekend getaways to family saved me. 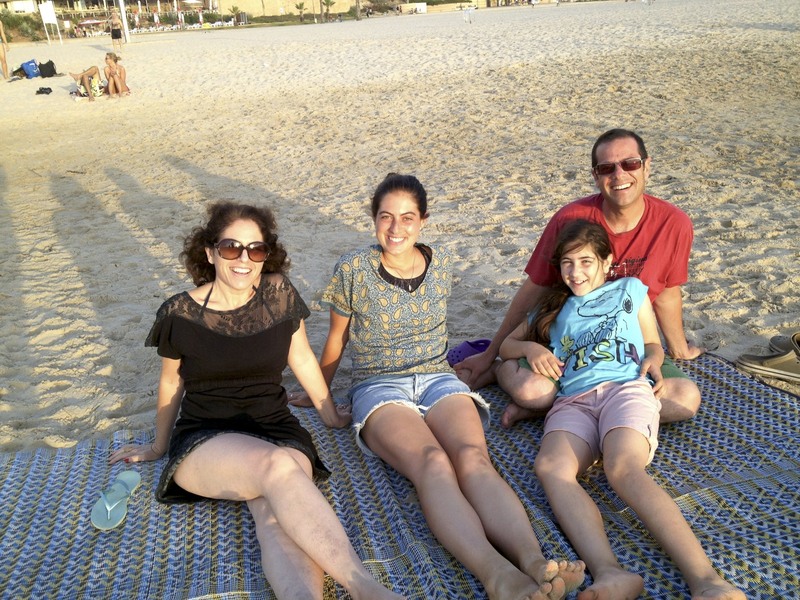 For the past two months, Nurit and the rest of the Pardes Hana family has nourished my soul, beached my body and washed and folded my laundry almost every weekend. 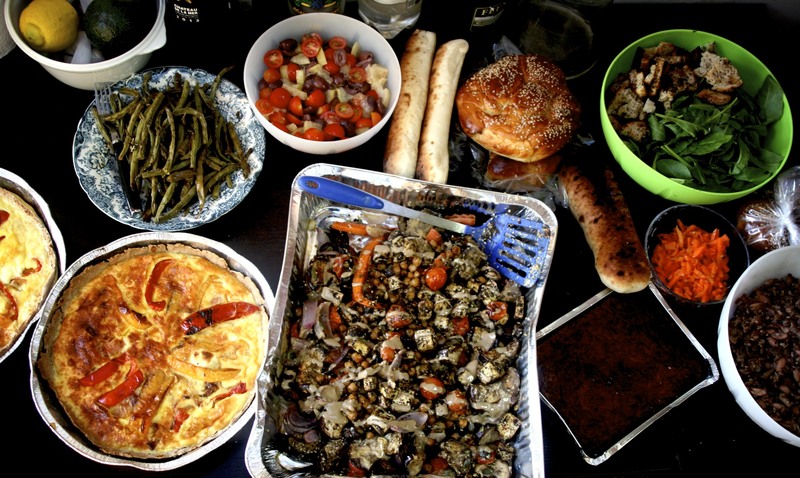 Several Shabbats ago, Nurit made an incredible goat cheese tart. Eggs, cheese and carbs – the perfect comfort food. I re-made it with rye flour for a Shabbat that I hosted before I moved out of my Nachlaot apartment. It was a much needed indulgence. Mix the flours and salt in a large bowl. Add the butter and rub in with your fingertips until it crumblies to teeny balls. Add 4-5 tablespoons cold water and use your hands to mix it into a dough. Wrap and chill for at least 20 minutes. Preheat the oven to 350 degrees. Roll out the dough on a floured surface. With the dough, line a standard pie dish. Press the pastry into the corners of the dish. Leave the excess overhanging the edge. Poke holes in the base with a fork, line with baking paper and fill with rice or beans to weigh down. Bake for 15 minutes, remove from oven and set aside. Meanwhile, heat olive oil in a pan. Sauté onions on low heat until fragrant. Add peppers and garlic and sauté until tender, about 10 minutes. Set aside to cool. Whisk eggs, cream, salt and basil in a separate bowl. 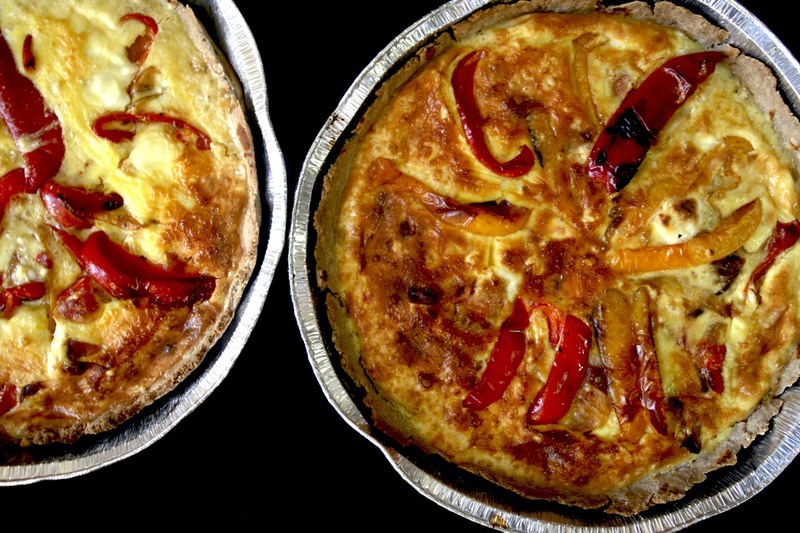 Spread cheese along bottom of pastry crust and layer with onions and peppers. Pour egg and cream mixture on top. Scatter with remaining peppers and onions, and bake for thirty minutes until top is golden. Allow to cool before serving. 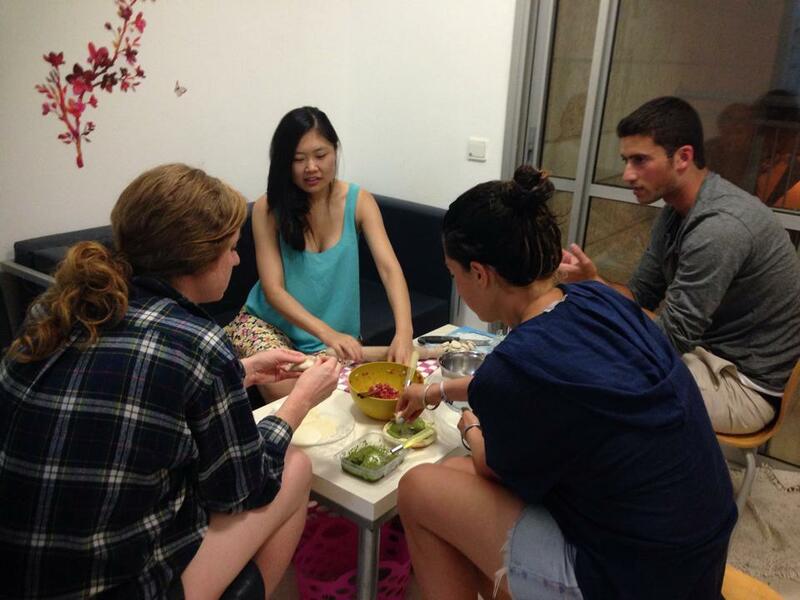 Last week, some of my friends and I organized a food party to learn how to make Chinese dumplings. 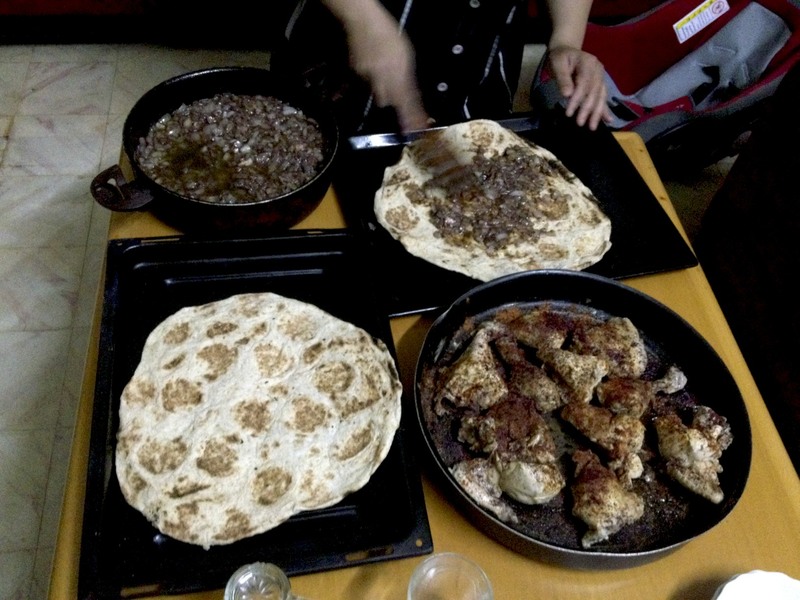 I learned how to prepare them, but didn’t want to eat the meat… It was one of the few times I’ve hated my vegetarianism. The other time involved Bubbe’s kreplach, which is basically the same food as Chinese dumplings minus the added ginger. I guess I have a thing for dumplings. My lame contribution to our cross-cultural food exchange was toasted pita with sorrel pesto, parmesean and almond/cashew pieces. My original idea was to do buckwheat blinis with sorrel pesto, ricotta and crushed hazelnuts but I didn’t get it together in time. I still can’t stop thinking about it though, so it will definitely happen in the future. I made a big batch of sorrel pesto about two months ago and kept it in the freezer (removing small lbatches into jars that lved in the fridge about twice a week or so). I found a huge (HUGE!) box of what I thought was spinach for just ten shekels at Machane Yehuda, so I took it home. Turns out it was sorrel! Instead of hitting my books, I went straight to the kitchen to prepare a big tub of pesto. In additoin to my master blini plan, this pesto is the perfect quick fix to add zest and rich flavor to simple salad of chopped veggies. Really, it’s a game-changer… especially when in a time and resource crunch (story of my life). Wash sorrel and chop or tear into small pieces. Chop garlic roughly. 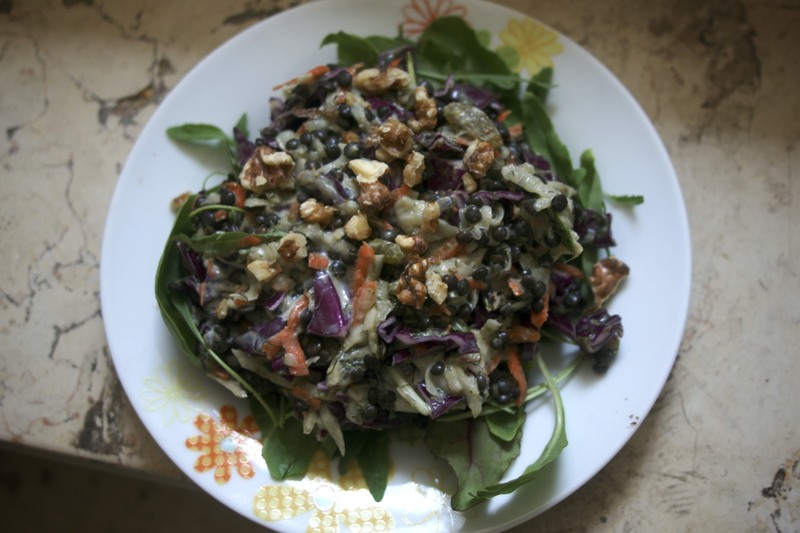 Add spinach, garlic and remaining ingredients (except for walnuts) to food processor. Pulse until a thick, green puree forms. Once you have a paste, add walnuts and pulse until desired consistency. I like to leave the walnuts a little crunchy for added texture. I’m sure what you are experiencing on the news must be very scary for you, but the worrying is annoying and needs to stop. My day-to-day reality is not scary … it’s just exhausting. I have lived on five continents. I have been exposed to a variety of worldviews, political clusterfucks and human rights tragedies. I became used to being an outsider looking in, which made it fairly easy for me to swing across conflicting realities. I adjusted quickly from Mumbai to New York to Mountain Brook. Here, I am not an outsider. I do not have the privilege of casual opinions, quiet observations or weightless sympathy. 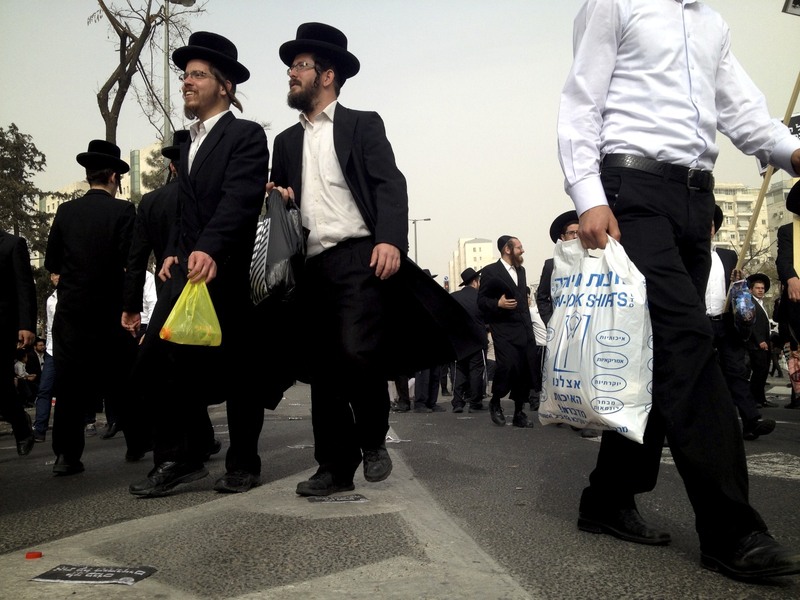 I am a Jew living in Israel. My actions and words are part of the stage. Several times a day, I am tossed across worlds that host separate realities and contradicting narratives. As the truths shift, so does my heart. Listening to everyone is exhausting; cross-checking my reactions to it all before I open my mouth drains me empty. Sometimes it hurts. I want the violence to stop. I turn inward. I ask myself what I can do to ease the chaos around me. 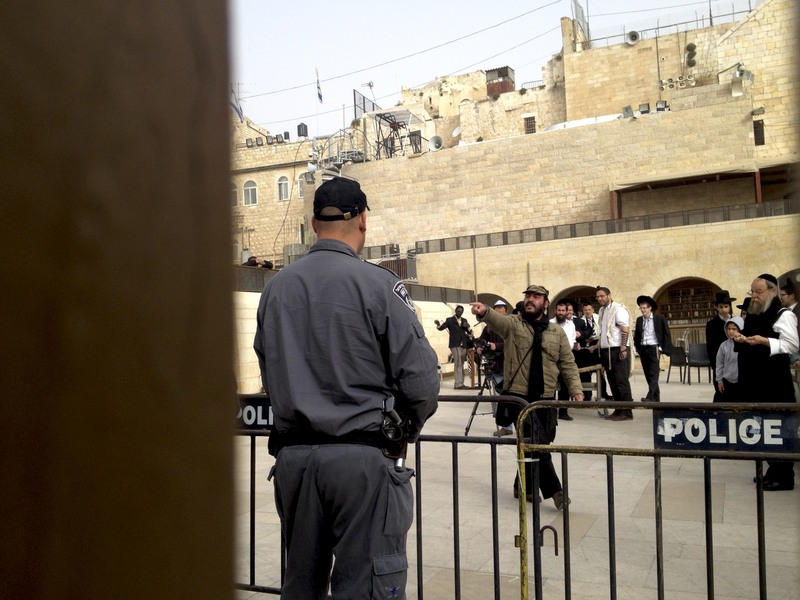 Right now, living in Jerusalem feels like living in a pressure cooker and, from what I see, the heat is not fueled by extremists or political leaders. It is fueled by people like me — laypeople who neglect personal responsibility by refusing or forgetting to build unity into their agendas of day-to-day tasks. 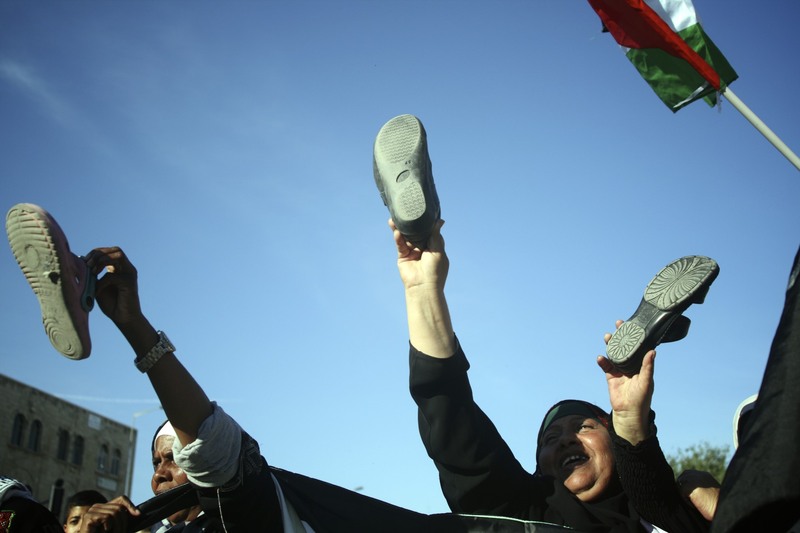 The heat is fueled by people who are set on defining and defending rights and wrongs. I know what you’re thinking and yes, there very well may be universal rights and wrongs … but the fact that they exist has no bearing on the situation here. Anyone can argue a black and a white. I want the violence to stop and I don’t see a purpose in sustaining this argument. I want the violence to stop, so I will focus my energy on efforts that are productive. I will take time to listen, engage, acknowledge the suffering and pain of others, tell stories, smile and humanize. I will speak as an individual, avoid blame and propaganda and veer from divisiveness. It is all that I can do. 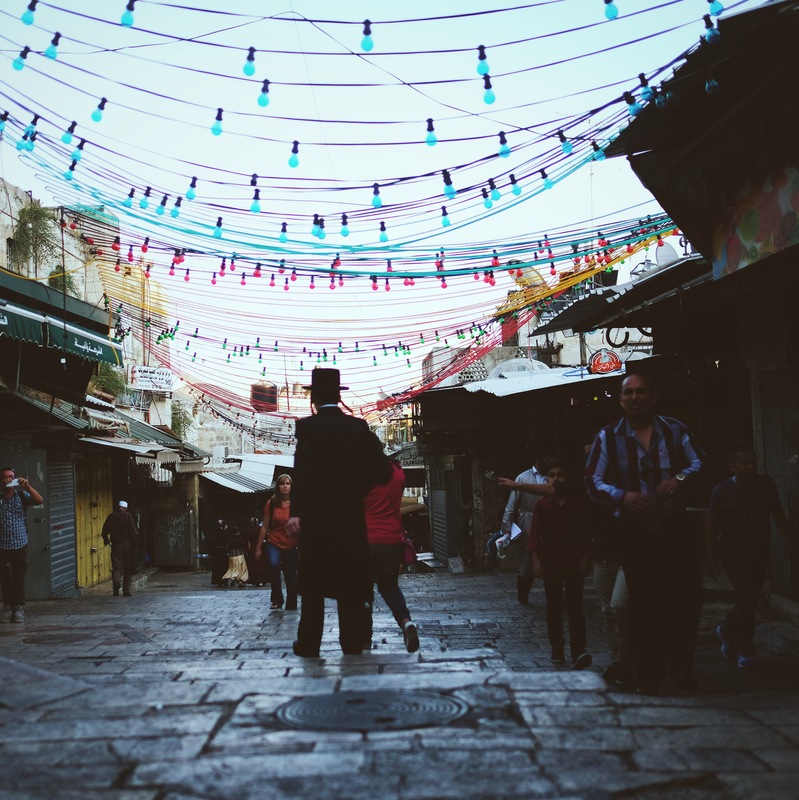 I am a Jew living in Israel … and — deep breath –I refuse to be enemies with my neighbors … and — another deep breath — I refuse to mitigate my empathy for human-life (regardless of my political views). I am not naive to think that my efforts are always (or often) mutual, nor do I think they can create peace at-large. But I do believe that I can lower the heat on the pressure cooker in which I live. I can say hello and listen to, tell and re-tell stories. Peace can come from the bottom. From the streets. From people like me. 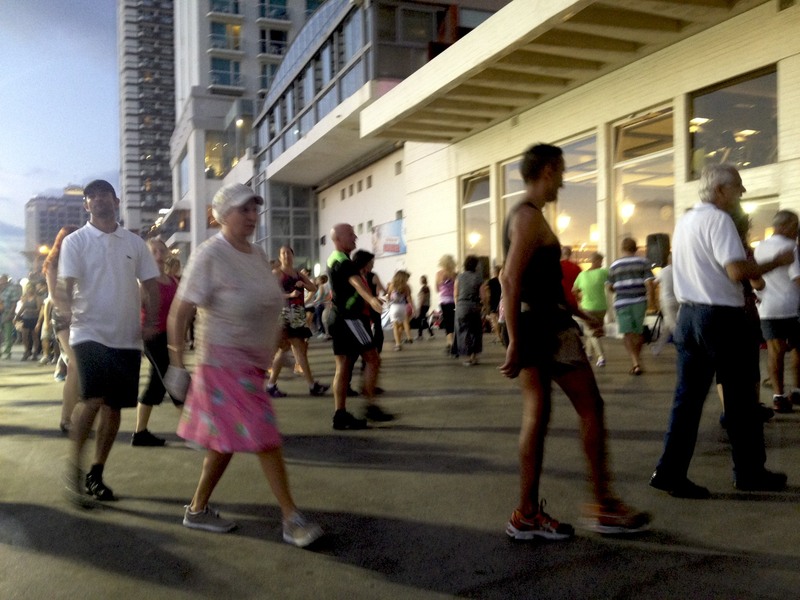 See… people are still dancing in the street. They aren’t scared- there’s no reason for you to be. Ps. I know you’re not happy with my decisions right now, but I hope my letter sheds some light unto my reasoning. And really, stop worrying. 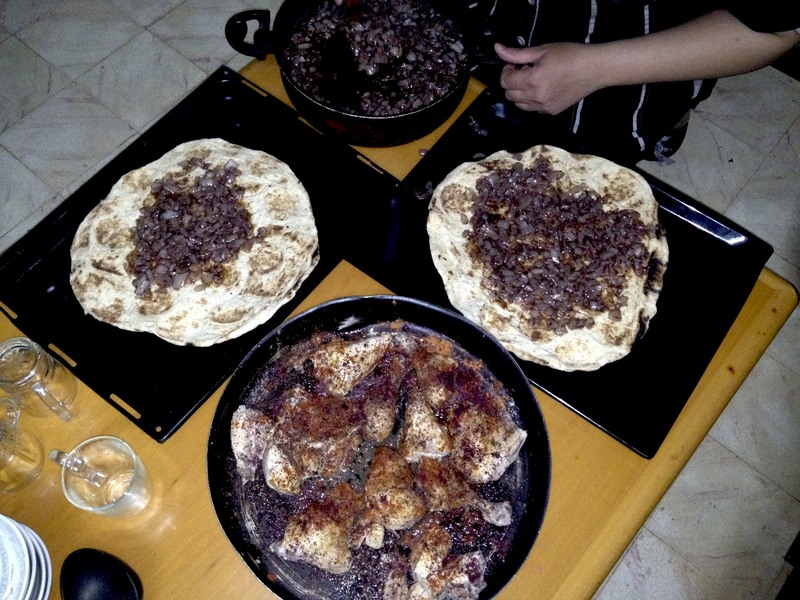 Last week, I helped the family downstairs prepare the Iftar meal with which they break their Ramadan fast. 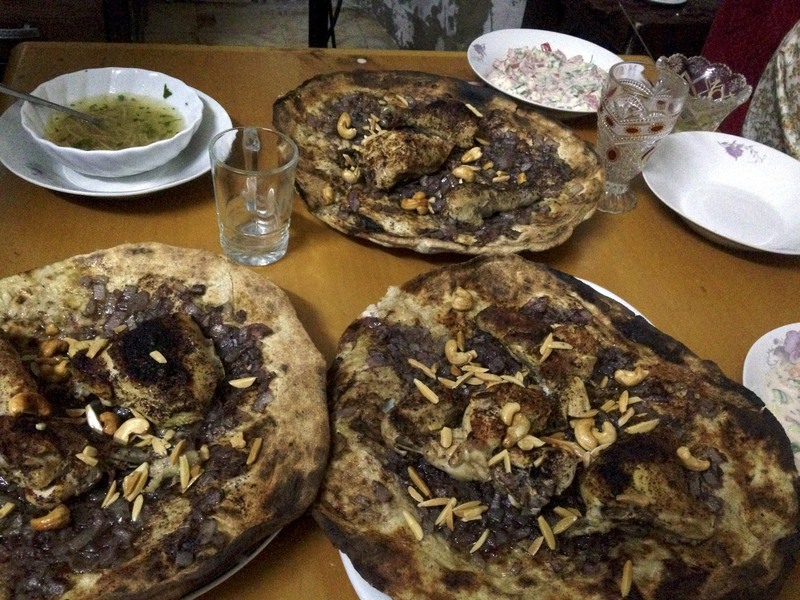 They showed me how to make Musakhan, which, I was told, is the Palestinian dish to know. 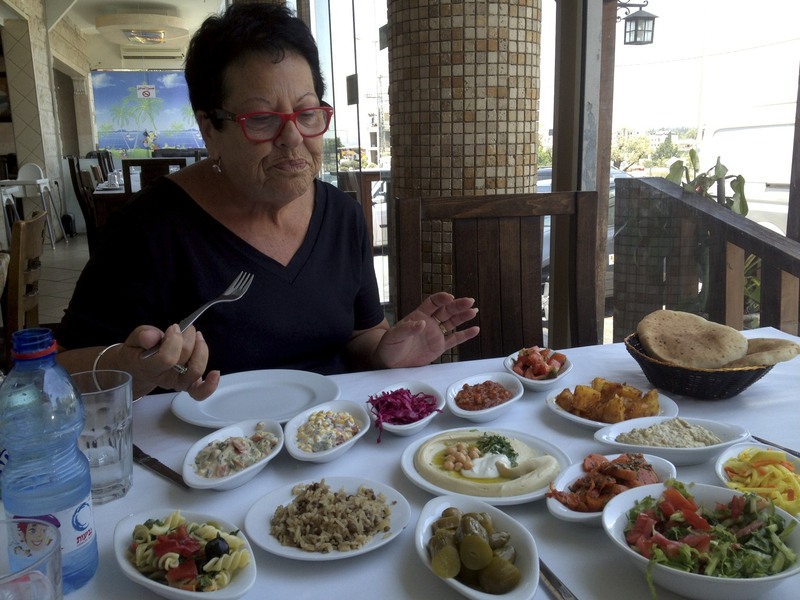 I’ve tried a lot of foods from this region so I was shocked (and upset) that I wasn’t familiar with most famous Palestinian dish! But now I know. Even though I ate around the chicken, it was an incredible meal. 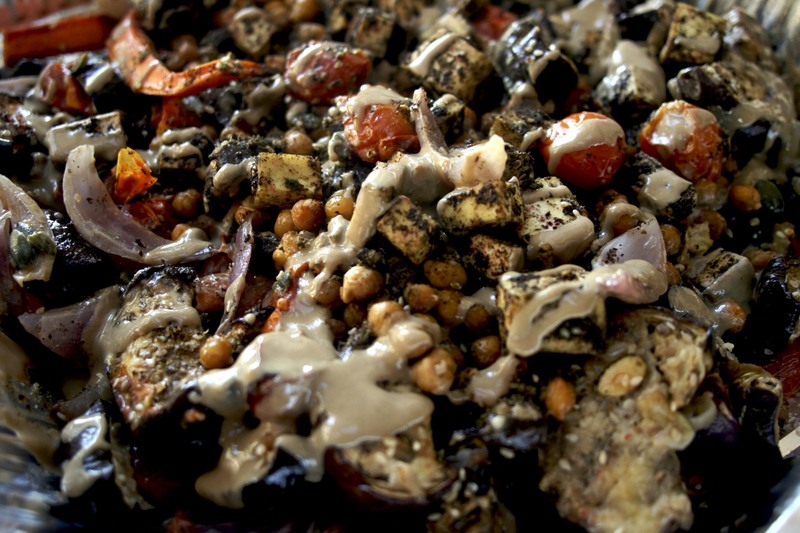 Along with Musakhan, we made “Arab Salad,” which is the salad that I (and many Israelis) eat almost every day – finely chopped vegetables mixed with tahini, lemon juice and parsley. 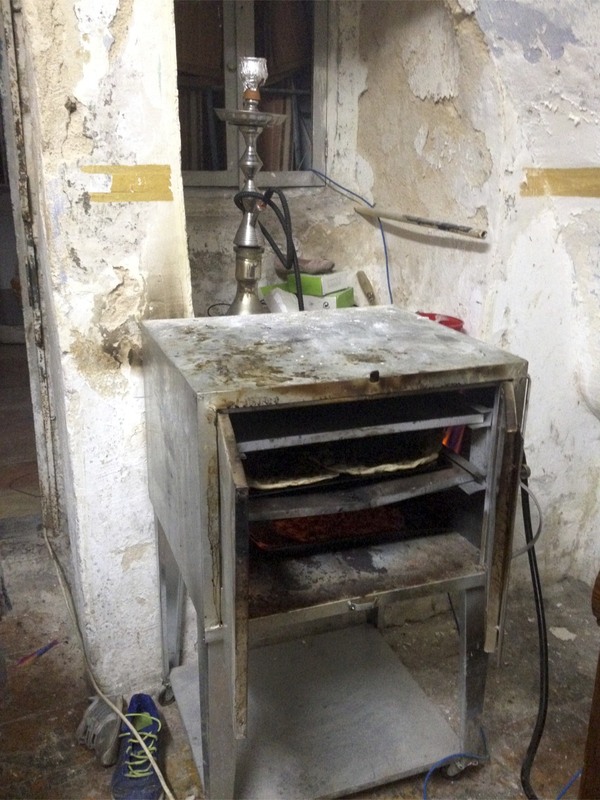 Also, look at this amazing oven that works like a taboon – can we get one? Combine garlic, cloves cardamom seeds , salt and black pepper. set aside one tablespoon of mixture and rub remainder into chicken. Let marinate. Meanwhile, chop onions into small pieces. Place in large skillet with olive oil and half of your chicken stock and salt. Cover and cook over very low heat for 10 minutes or until onions are translucent. Then, add remaining spices and continue cooking over low heat for another 20 minutes. Roast chicken in oven on 400 degrees on a baking sheet. Mix reserved tablespoon of spices with lemon juice and 4 tbs sumac. Once chicken is roasted, cover chicken with remaining spices. 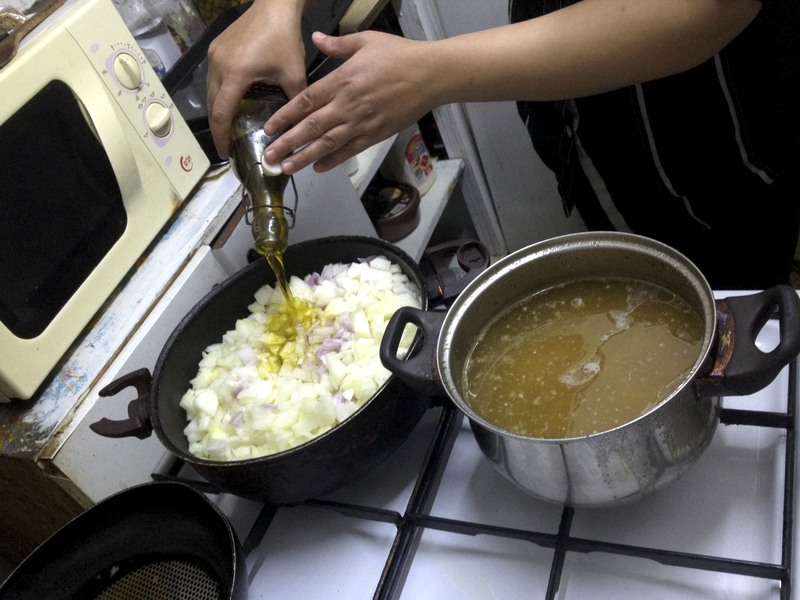 Once onions are cooked and fragrant, brush pan with olive oil. Place bread on pan and sprinkle with 3 – 4 tbs of chicken (or veg) stock. Then, cover with onions and place in oven. Bake for 15 – 20 minutes until onions are browned and bread is crispy. Place chicken on top of bread and garnish with parsley and cashews, almonds or pine nuts. To eat, rip pieces of bread and chicken with your hands, or cut it up like a pizza. 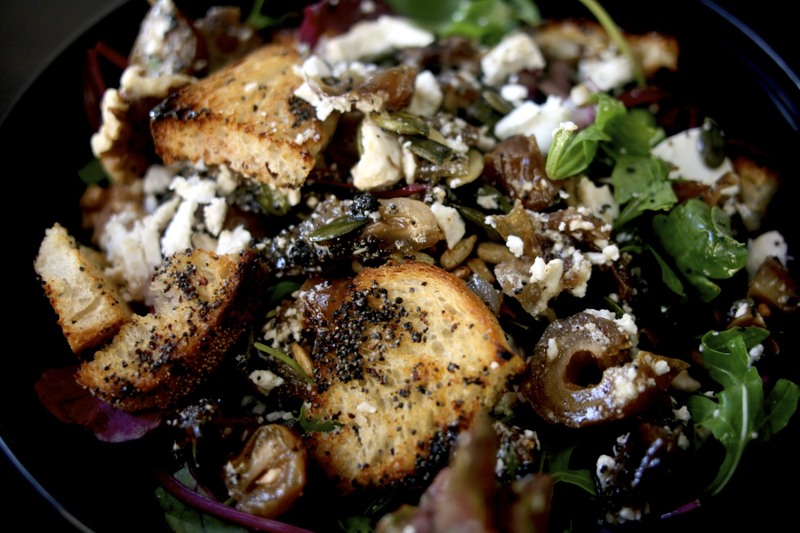 For a vegetarian version, replace chicken with baked zatar tofu, or top with labneh or greek yogurt. Indeed, the life force goes on. Throughout stress, transition and mayhem, we chop vegetables. We get on buses. We pretend we’re taking notes in class when we’re chatting with friends online. We finish homework on time for class (ha). Tragedy and fear persist, and so does life. Many people from home have been asking how I’m handling it all. 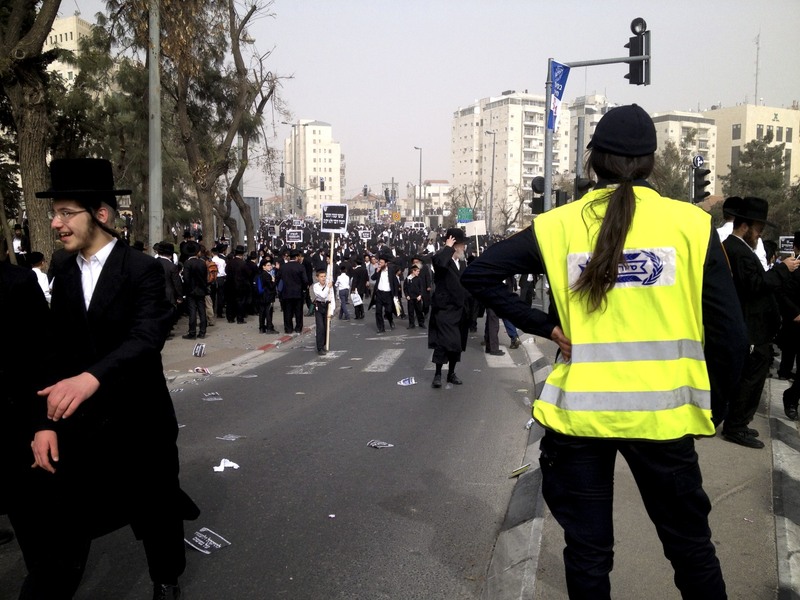 People ask about what it’s like when sirens go off indicating that rockets from Gaza are on the way. They ask for my thoughts on “the conflict.” I’m unable to vocalize anything… My anger, sadness and sensitivity surprise me each time in engage with someone about life here. The whole situation has tremendously affected me. Several days ago, I released some of the mess in my brain with a pen-and-paper purge. I didn’t write my thoughts with the intention of posting them here, but I want to share them with you. 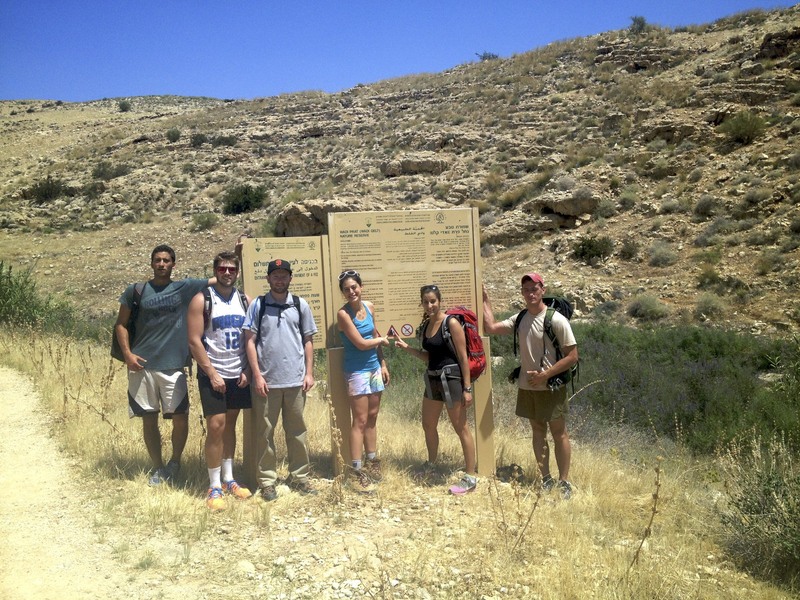 One week ago, four days after the bodies of Eyal, Gilad and Naftali were found outside of Jerusalem, I went to my first course of the summer semester, which covers inter-communal relations in Jerusalem, a topic that puzzles and fascinates me regularly. In the first twenty minutes of class, my classmates and I introduced ourselves with our names and a comparison between our hometowns and Jerusalem. 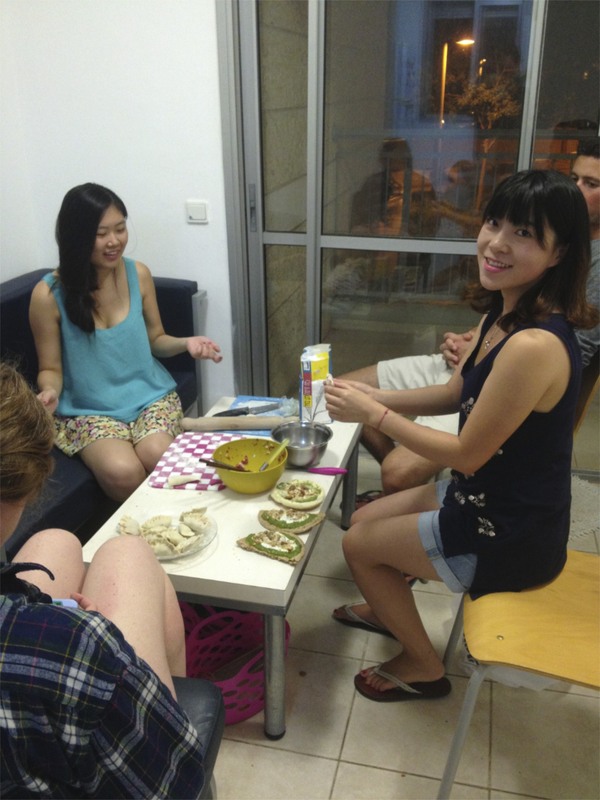 My name is Jia-li, and I come from the Szechwan province, where it hot in the summers like it is now in Jerusalem. 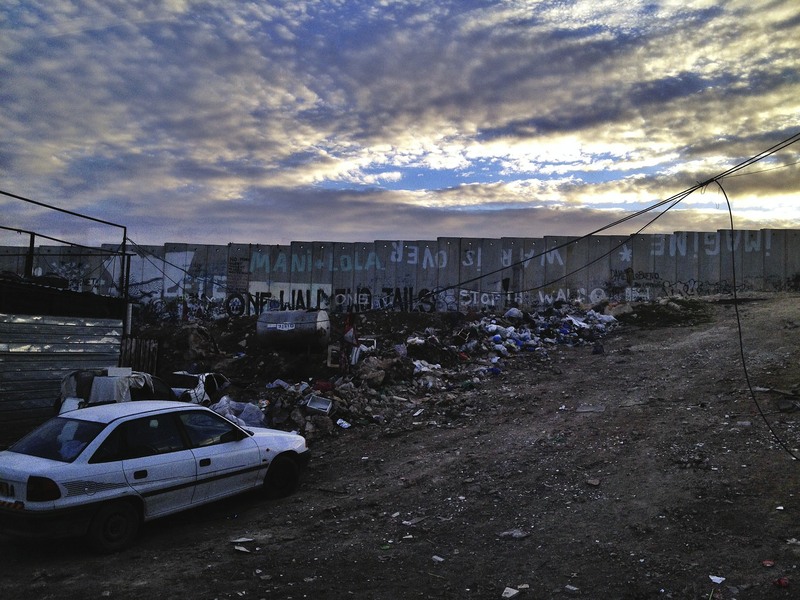 My name is Amir, and I come from San Juan, which is a walled city resembling Jerusalem. 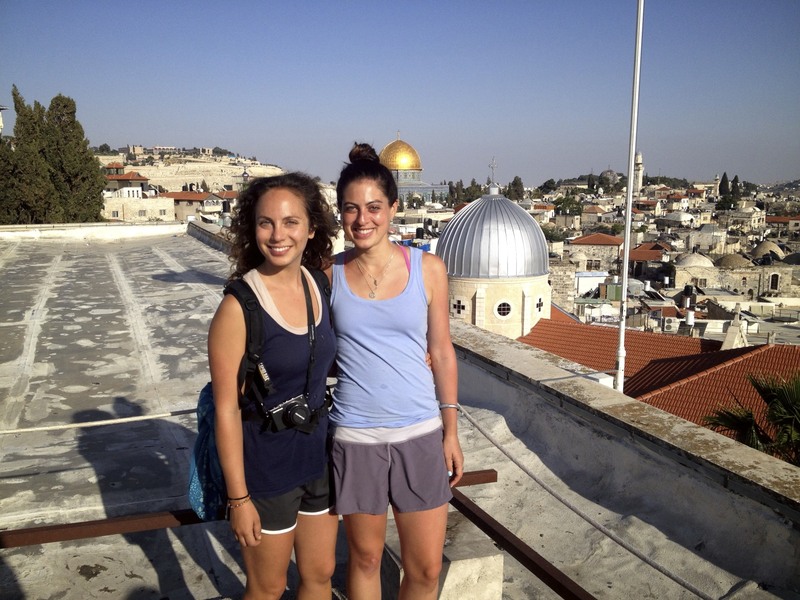 My name is Jackie, and I come from Boston, where historic architecture is all around like it is in Jerusalem. I was the last person in the room to share. My voice was unexpectedly shaky. I grew up in Birmingham, AL, a city known for its history of racism and hate crimes. 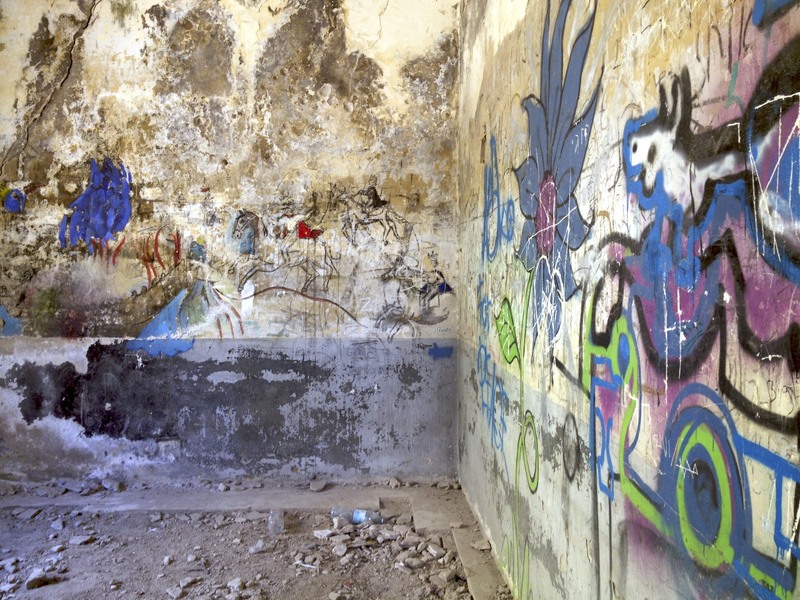 Today, systemic racism and segregation in the public sphere exist. I did not interact with African Americans other than grocery-store clerks, maintenance workers, house cleaners and ‘nannies’ until I was in high school. I joined dialogue groups and workshops to talk about race, and made black friends who were afraid to come to parties at my house because they did not want to be stopped by the police in an almost all-white neighborhood. I ventured to neighborhoods that I was told not to go to. I became comfortable with the discomfort of being in a place where I am different and comfortable with the discomfort of being in a place where everyone is just like me. 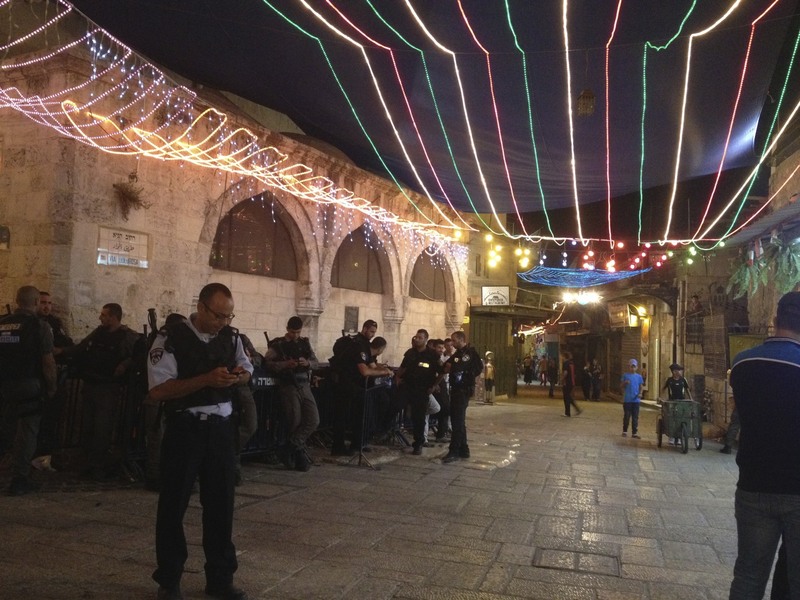 I did not have to explain how my hometown was similar to Jerusalem. 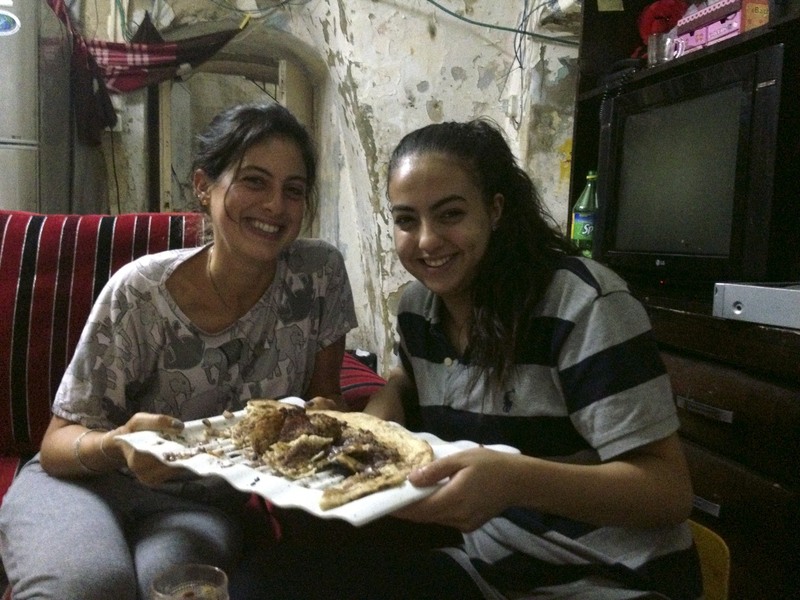 Two weeks ago, I moved from an apartment in Nachlaot to a Palestinian neighborhood. 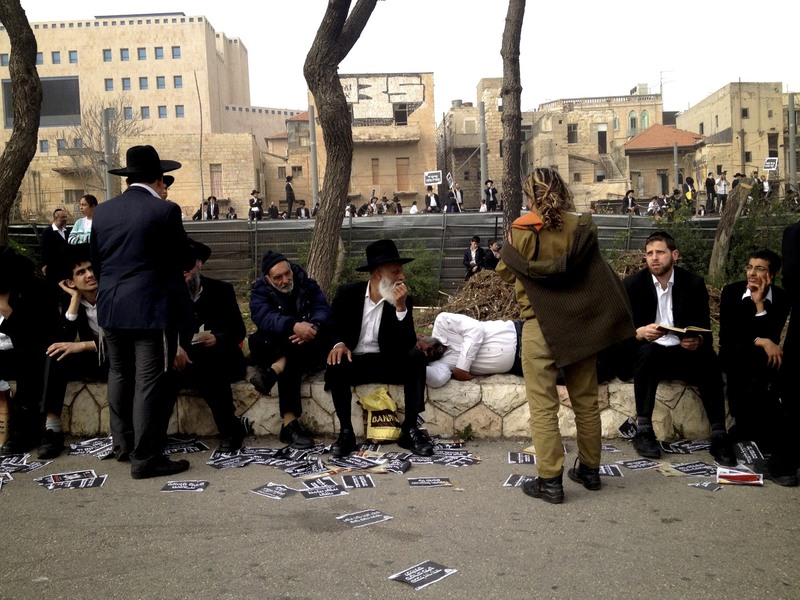 Nachlaot is in West Jerusalem. 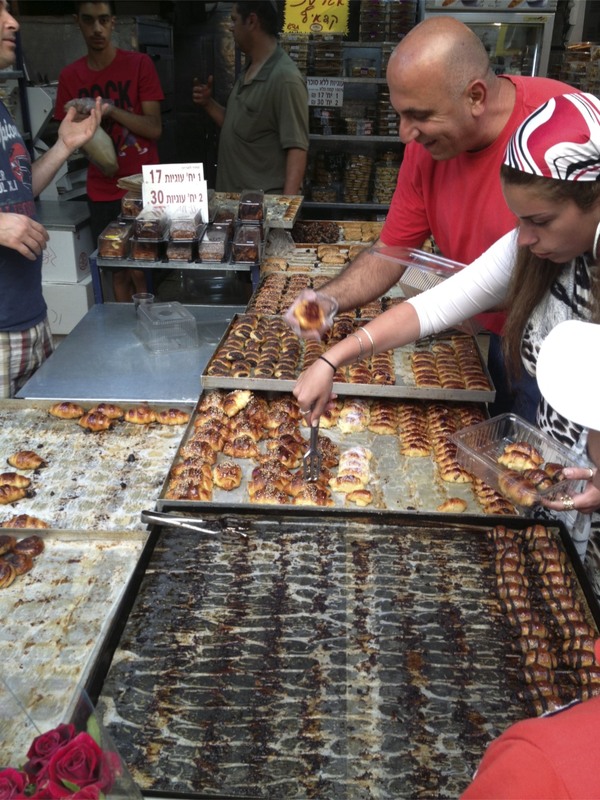 Its residents wear high-waisted jeans picked from the racks of trendy vintage stores, American Apparel leggings (the kind of thing to stock up on when moving to Israel from the US) and old leather backpacks. 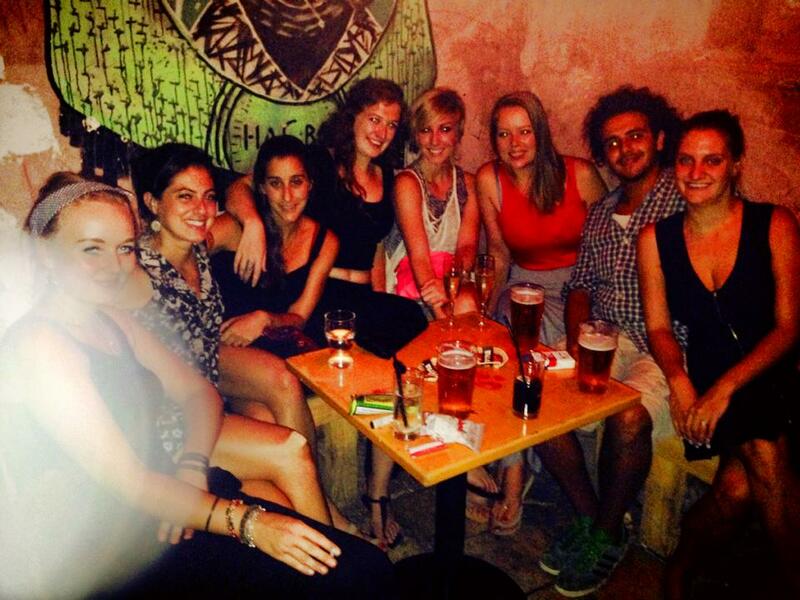 They are hip Jewish-Israeli artists, students and young professionals. 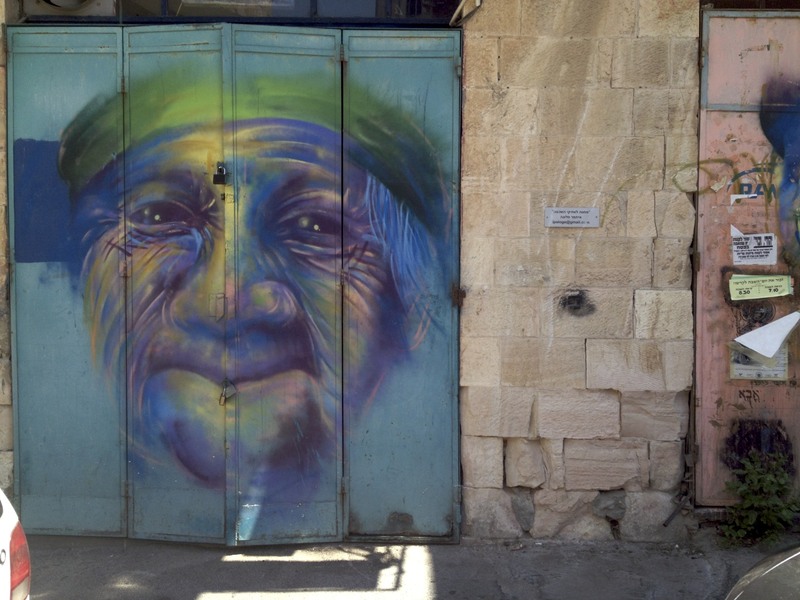 I moved to a Palestinian neighborhood to practice my Arabic and experience a different space of the city. My new apartment is a fifteen minute walk from my old one and it feels like it’s in a separate country. Even the pavement on the streets is different. Last Wednesday, the day that the boys’ bodies were found in Hebron, I was in the library until evening, multitasking between writing final papers and reading the news. When I got to my apartment, I squeezed through barricades of soldiers to reach my front door. I found my roommates packing overnight bags. 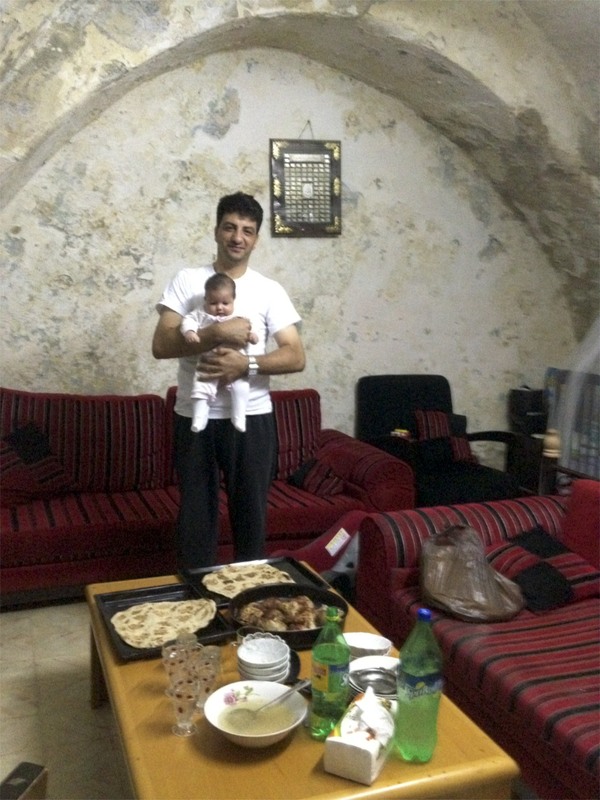 Neither of them – a Palestinian-American and a Dane – felt safe staying in the apartment. We shared updates from our Facebook newsfeeds and the op-eds we had read. 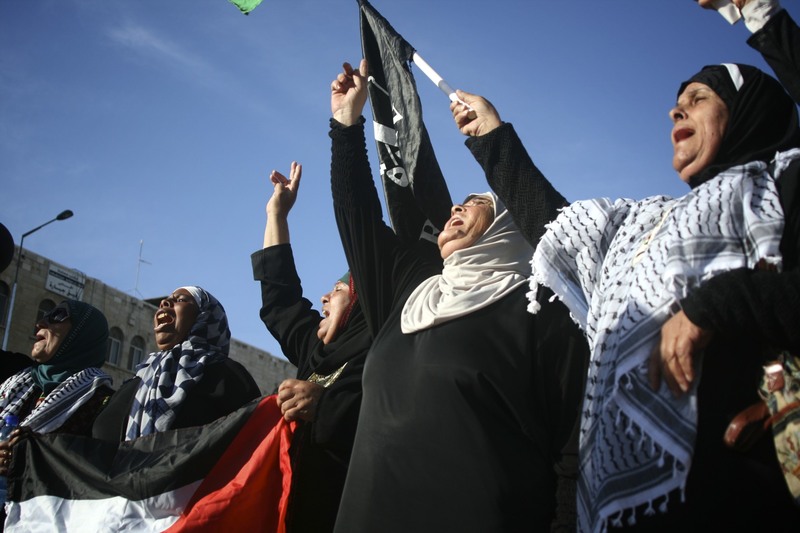 I listened to the Palestinian-American’s accounts of the situation in Gaza and Hebron. 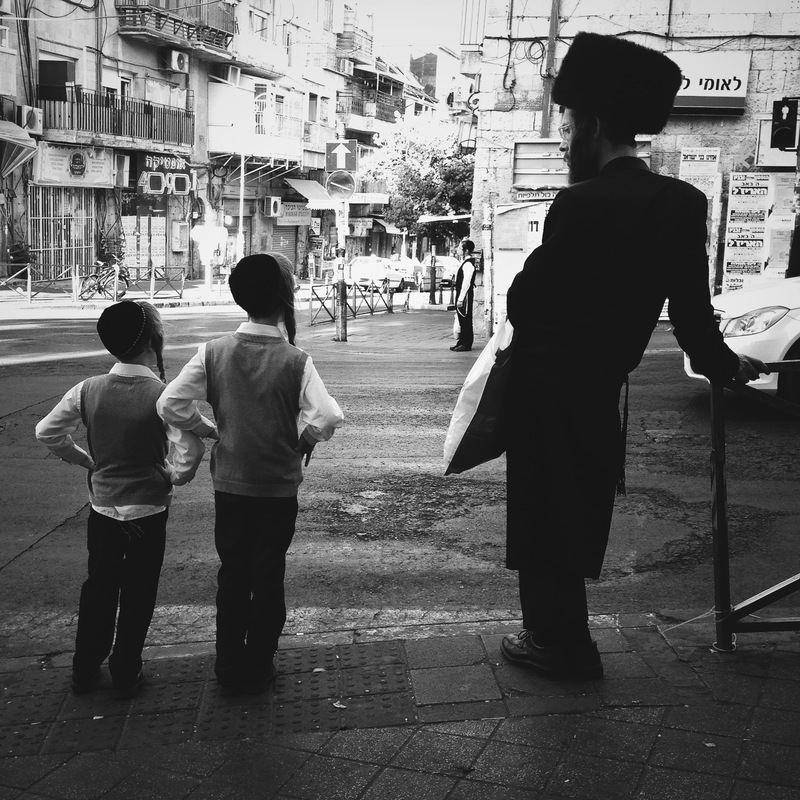 We left the apartment and headed in different directions – I walked back to Nachlaot, my old neighborhood. Ten minutes later, I was on Jaffo Street in the city-center. 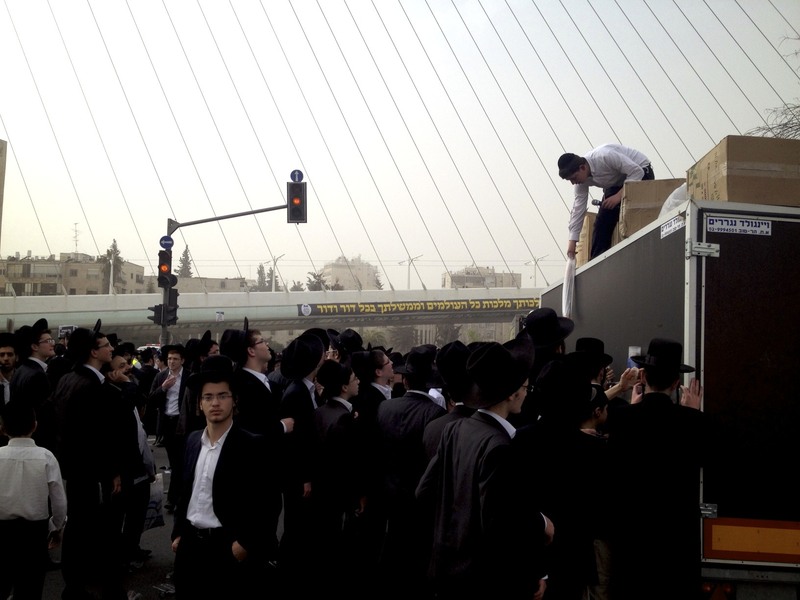 A mob of pre-teens emerged from an alley screaming, in Hebrew, “death to Arabs,” followed by police on horses. Young girls wearing Israeli flags laid down in front of the horses while the teens ran in the streets with sticks in their hands, cheering and shouting like they were at a football game. I started crying. 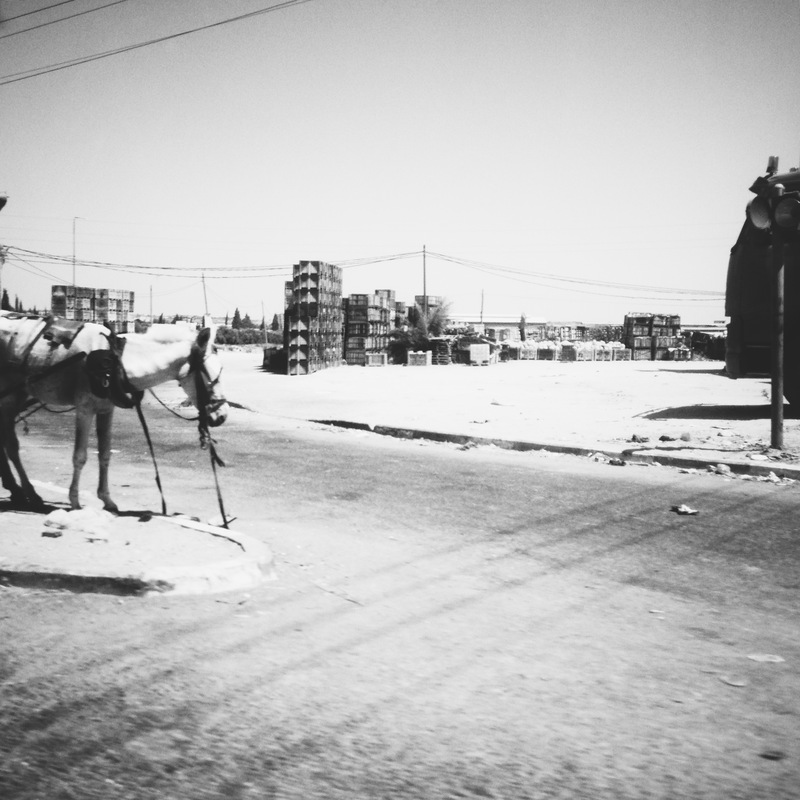 I followed the mob, and watched them surround two small Arab boys against the wall of a shop. The police were gone. The boys sprinted away as fast as they could. The mob cheered. I arrived at my friend’s house in Nachlaot and plopped down on his leather couch next to others just like me. They had gathered to comfort one another in face of the day’s painful news. The conversation vacillated between things like the health benefits of sprouted grains and how only a society of animals could celebrate something so brutal as the murder of children. I was too shaken to say anything. 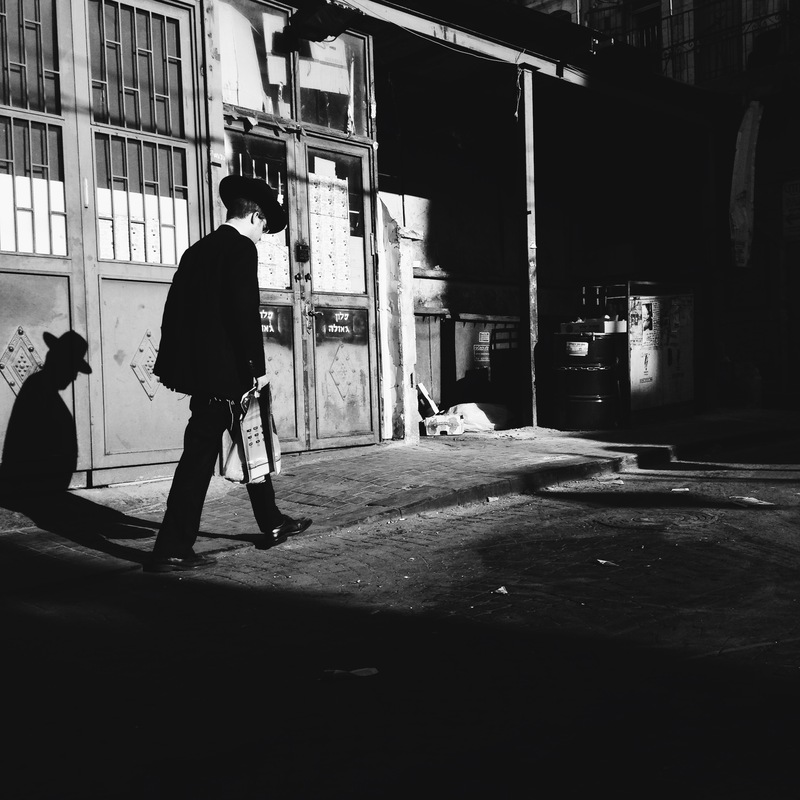 My fifteen minute walk from neighborhood to neighborhood illuminated the separateness of the multiple realities being lived by Jerusalem’s inhabitants. These realities are divided by vast gaps, but have been built right on top of each other. 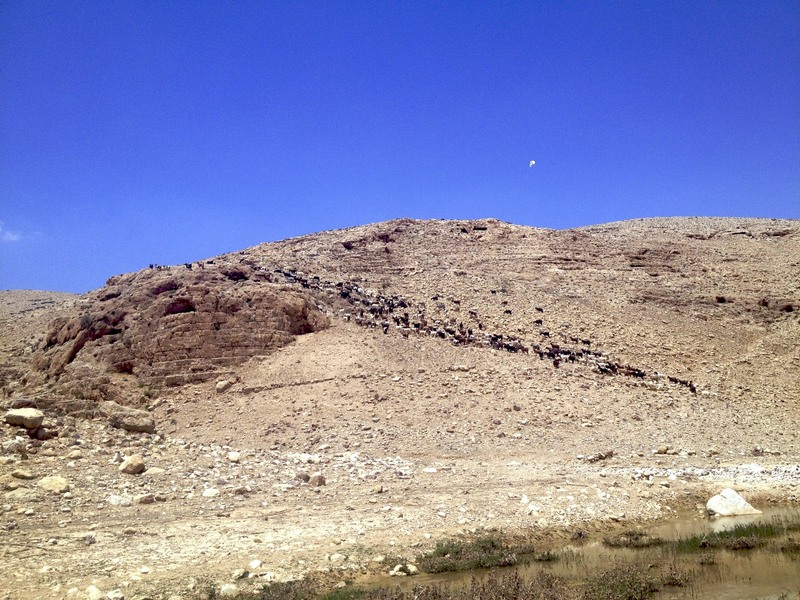 The next day, the body of Muhammed Abu Khadier was found. Another tragedy. In spite of warnings from friends, family and Israeli security, I went to Muhammed Abu Khadier’s mourning tent in Shuafat, a fifteen minute walk from my University’s campus. I thought about the fifteen minutes it took for me to get from Mountain Brook to Ensley – going there was the only way to bridge the gap. 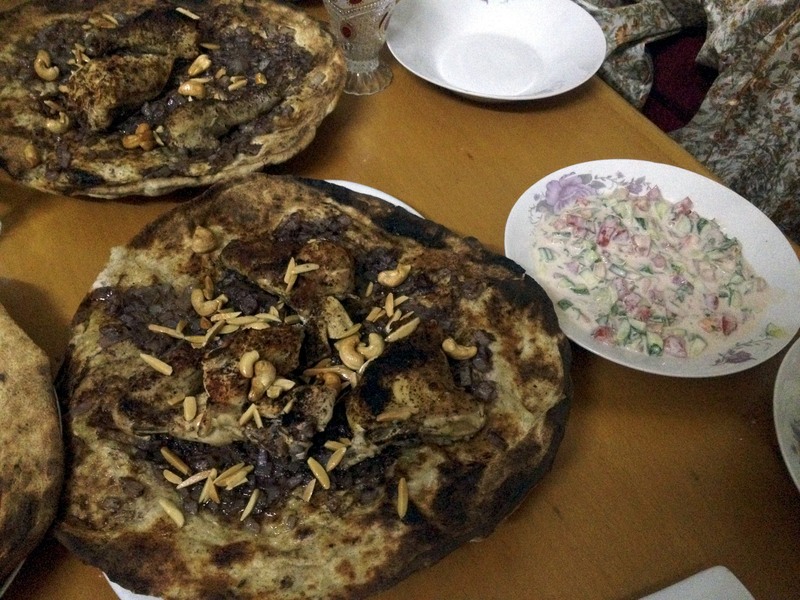 Visiting Muhammed Abu Khadier’s family was sad and uncomfortable and important. The severity of the conflict has escalated. 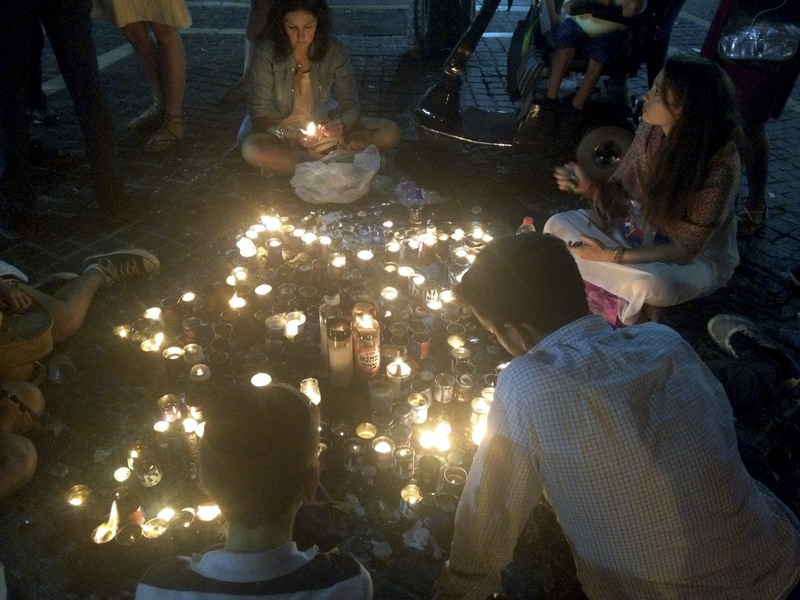 People in Jerusalem are scared; people in Tel Aviv are scared; people in Gaza are scared; I am scared. What does this violence mean for the future of the families around me? 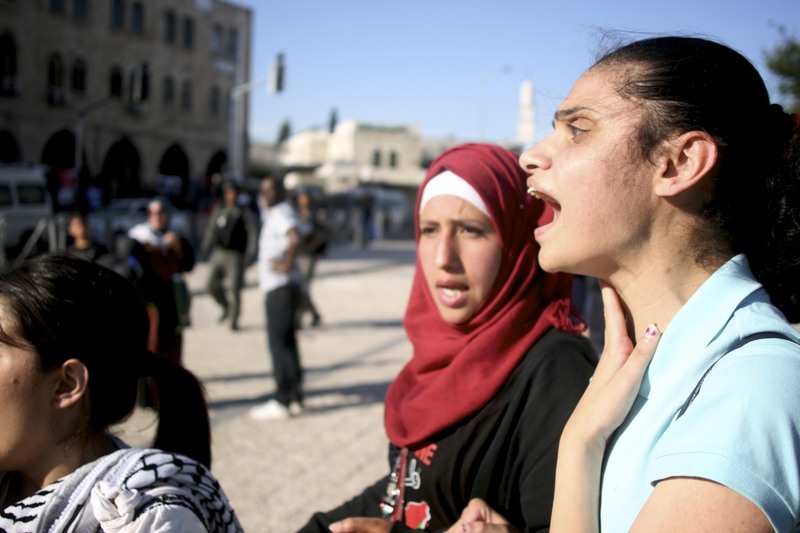 These days have been a painful time for Jews and for Palestinians. Today, a Muslim-American friend (she wears a headscarf) asked if I wanted to meet up for dinner in a place that feels mutually safe. I laughed to myself. I responded via text message, Hahaha yes! And then, Sorry, not funny… just feeling confused about where that place is supposed to be. I am embarrassed to admit this: when I walk the streets of Jerusalem my heart remembers driving around Birmingham. It remembers being conflicted, torn and confused about where I’m supposed to be. It remembers the dialogue groups I participated in in high school – Anytown Alabama, Heritage Panel and PEACE Birmingham – that positioned me to see individuals beyond their homophobia or evangelical conviction that I was eternally dammed. In Birmingham, I learned that trying to bridge gaps can curb violence and fear; I learned how to speak and think in I instead of we and they; I learned that no one has exclusive ownership of the truth. Is it naive to think that teaching our children to communicate – to think – could make the world more livable? Thank you for sending your prayers – please, continue to do so. But more importantly, let’s talk. Ps. Wow dad has tarragon growing in the garden?! YES. 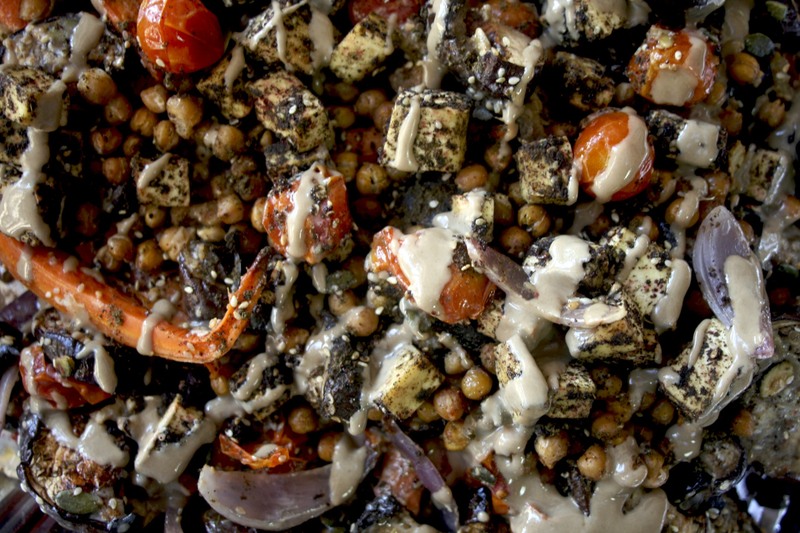 This salad is adapted from Yotam Ottolenghi and Sami Tamimi’s 2012 collaboration : “Jerusalem: A Cookbook.” You know it. 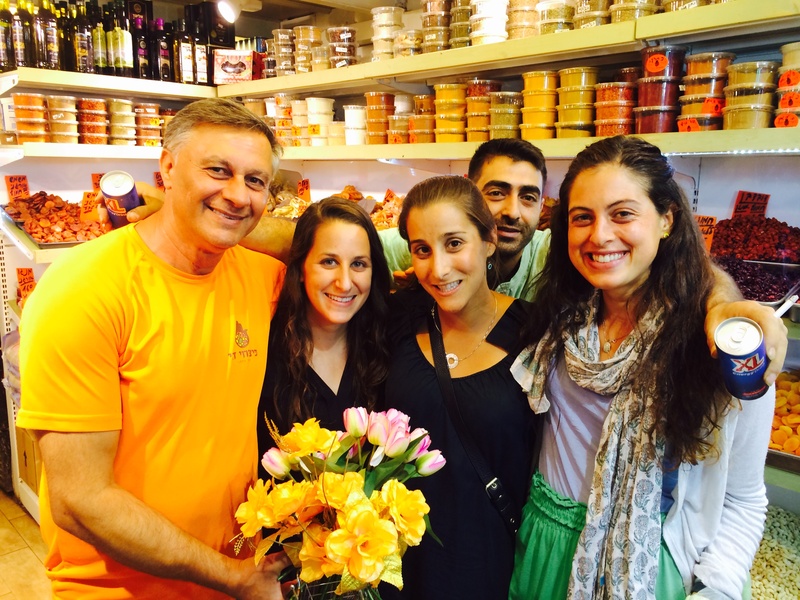 The two are an Israeli Jew and Palestinian who united over a shared appreciation of food among other things. I received their book as a gift from my aunt and immediately fell in love. I will never be able to look at it in the same way I did before living Jerusalem. 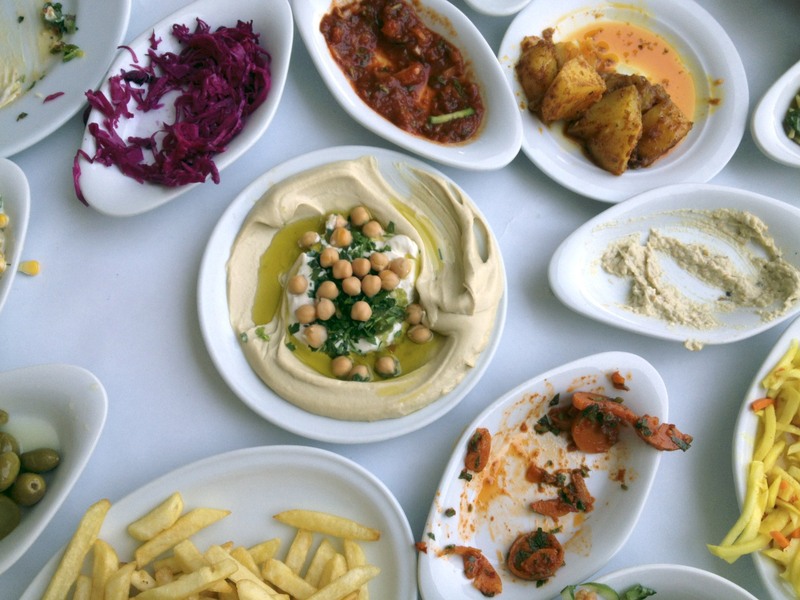 It’s pages, in which Ottolenghi and Tamimi weave together the separate realities of the city, are colored with familiar scenes, characters and flavors. It’s beautiful. 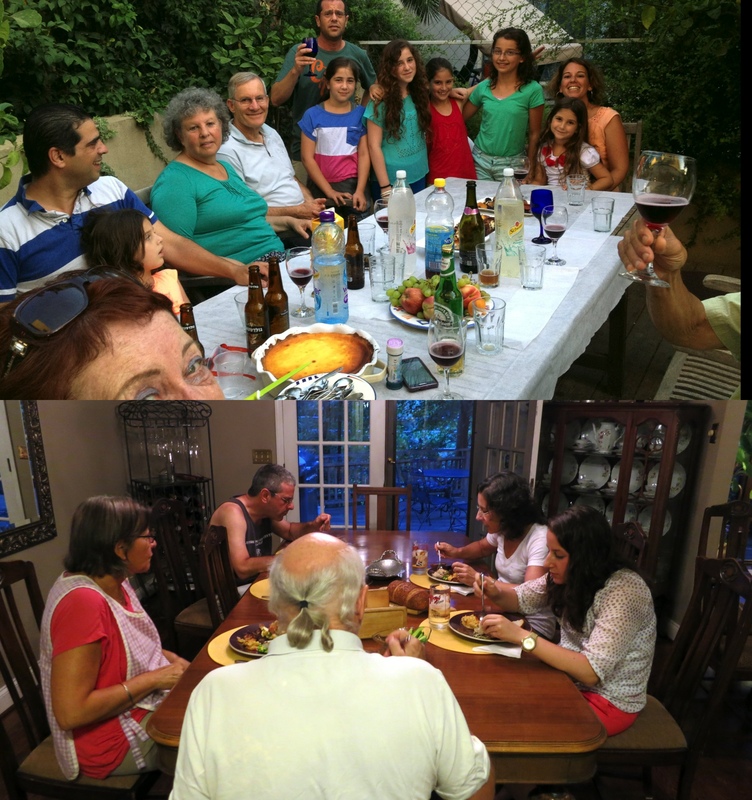 Tamimi and Ottolenghi aren’t the only ones: Jam Session, recipes from women belonging to The Parents Circle, a group of Israeli and Palestinian parents who lost children in the conflict, is another inspiring collaboration. There is hope. Yesterday, my classmates and I had the privilege to hear Raphie Etgar, the founder/director of Museum on the Seam speak about his work to create dialogue and unearth hard topics through art. Etgar told us that “creating art is one of the ways people can something and expect other to listen … Discussion is a starting point for considering other options.” Word. Put vinegar, onion, salt and dates in a small bowl. Leave to marinate for 20 minutes and drain any residual vinegar. Discard vinegar. Heat butter in pan over medium heat. Add pita and fry until golden. Add poppy seeds, almonds and whatever other nuts use choose, continuously stirring until pita is crunchy and nuts are toasted and fragrant. Remove from heat and mix in sumac, chile flakes and a pinch of salt. Let cool. When ready to serve, toss spinach leaves, pita mix, dates and red onion and feta with olive oil, lemon juice and pinch of salt. Serve immediately. 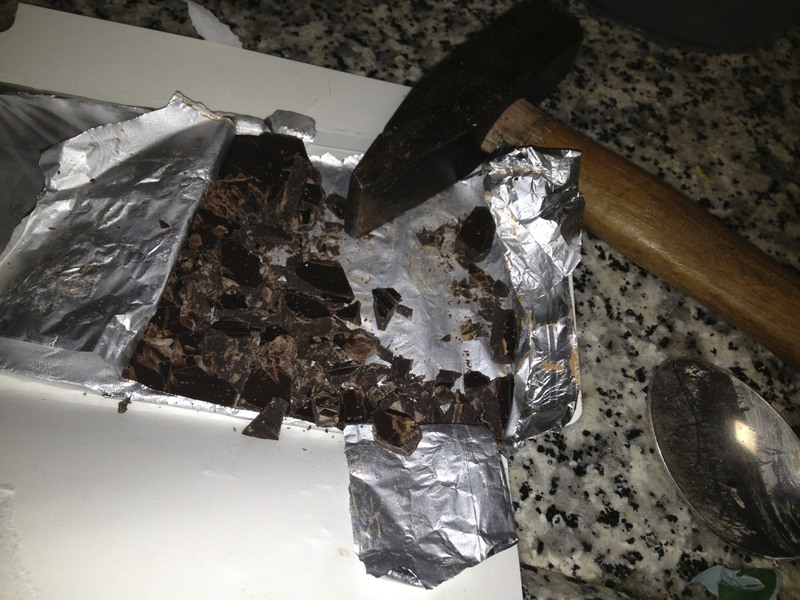 The recipe below is one I made up in a last-minute effort to clean out my kitchen space. It also reeks Jerusalem. 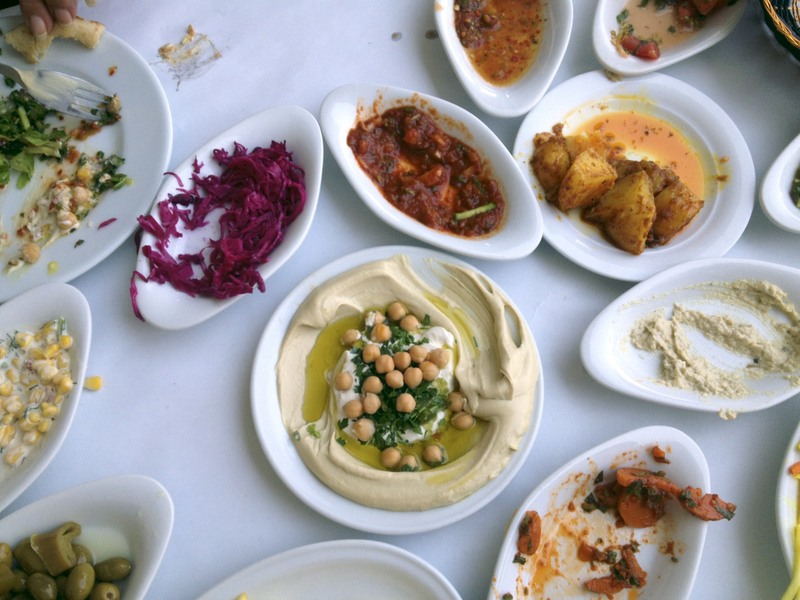 The dominant flavors – rich tahini, spiky zatar, surprisingly warm- spiced chickpeas – are familiar to all Jerusalemites (the tofu part… not so much). Don’t be scared by the list of ingredients… it’s long, but this dish is worth it. Preheat oven to 250 degrees (use convection setting if you can). Toss carrots, tomatoes and onions in olive oil, salt and pepper and lay flat on baking sheet (preferably lined with parchment paper). Allow to slowly roast in oven for about 35 – 50 minutes until tomatoes are wrinkled, onions are browned, eggplant is soft and carrot edges are crisp. Check frequently – it turns from browned to burnt quickly! When done, mix with lemon juice and zest. Allow to cool. While your veggies are in the oven, mix cinnamon, cumin, cayenne, salt and olive oil. 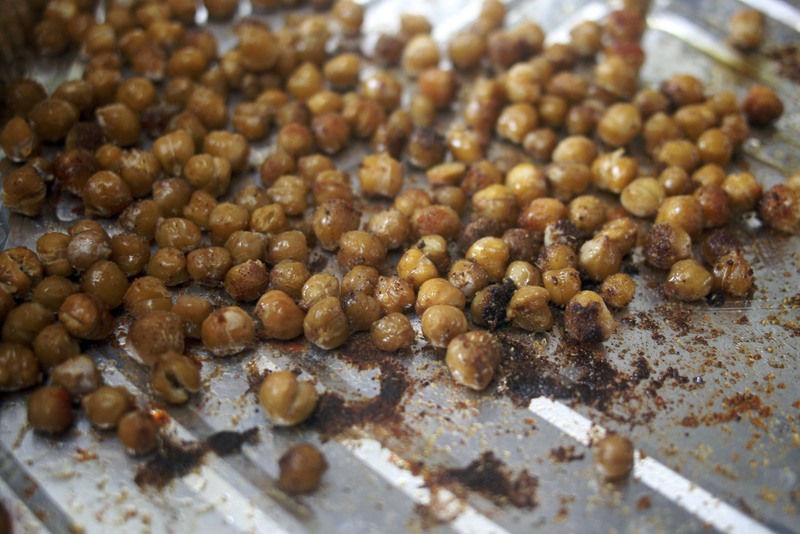 Add chickpeas until coated. 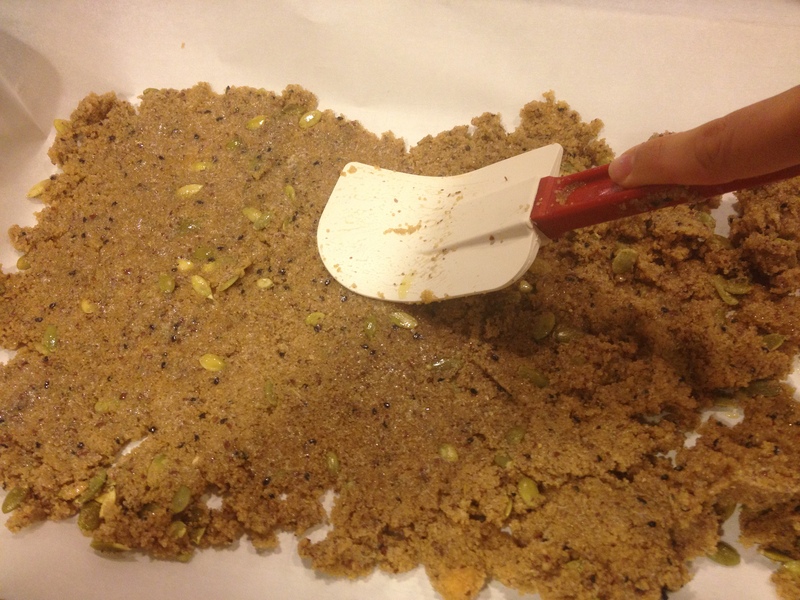 Lay flat on baking sheet covered in parchment paper. Set aside. Up the oven to 350 once veggies are done. Remove the tofu from its packaging and pat dry with paper towels. Cut tofu into cubes and allow excess liquid to drain. While draining, prepare mixture of olive oil, zatar, sumac and salt. 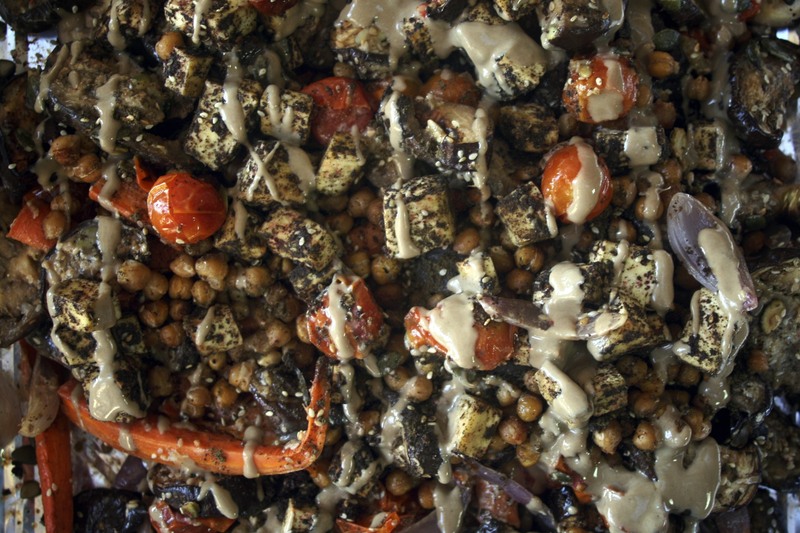 Mix tofu cubes with the zatar mixture so that each cube of tofu is covered with a green powder coating. 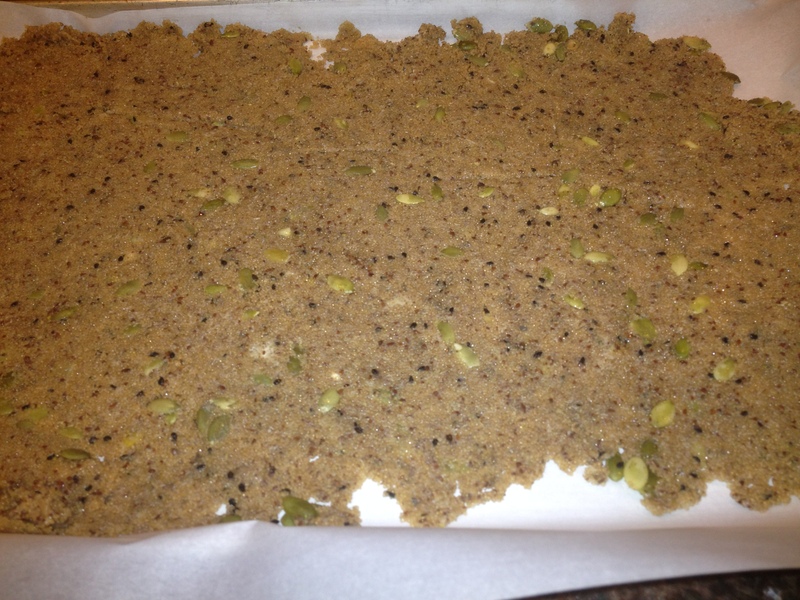 Lay flat on baking sheet covered in parchment paper. Bake tofu and chickpeas (on separate baking sheets) until golden and crispy at 350 – this should take 30 – 50 minutes. 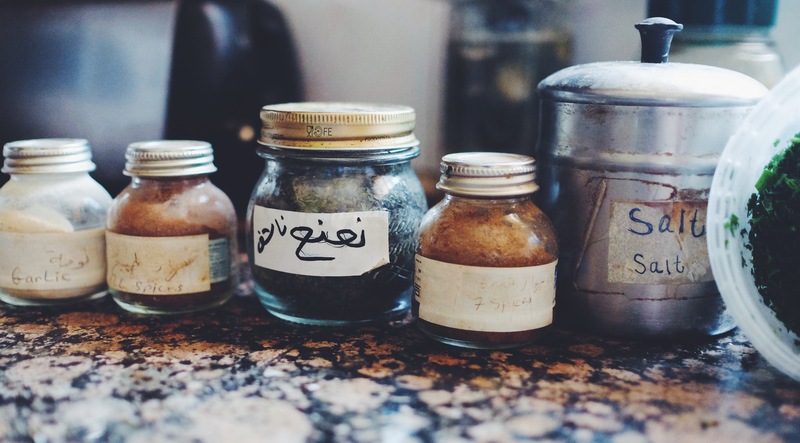 The zatar and cinnamon will make your kitchen smell heavenly. After it’s all out of the oven, toss everything together with 2 tbs tahini and sesame seeds. Drizzle remaining tahini over top. Dust the final product with pinches of sumac and zatar and serve. I know, I know… You and dad are always having more fun than me. 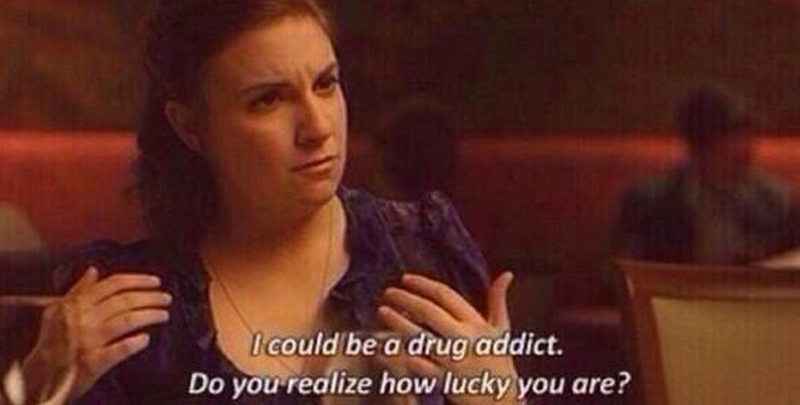 I feel lame when people ask me what my parents are like and I tell them stories about your partying/party-throwing. I can’t keep up. Maybe when I have the resources to buy better alcohol I’ll be better at drinking it. In my last letter, I told you about my self-induced pressure to do a million things. It’s happening. And the exhaustion is catching up with me. 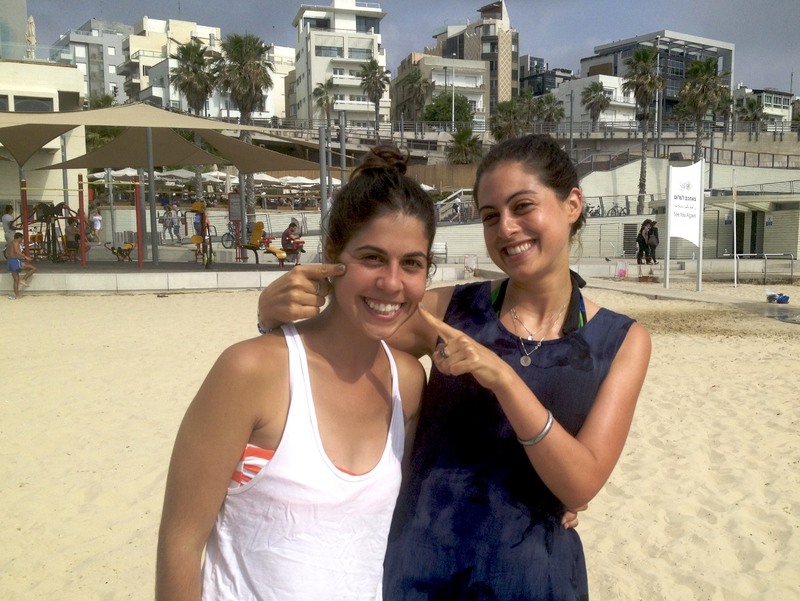 Yesterday, I met Ayla in Tel Aviv and had a nice beach day visiting friends. The day before that was Student Day, which I celebrated at a huge outdoor concert festival until sunrise. 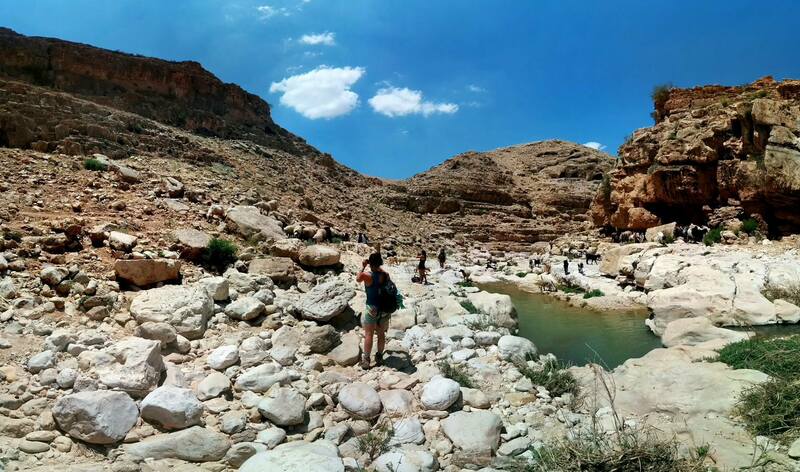 Last weekend, after another beach day in Tel Aviv, Naomi came to Jerusalem and we walked from here to Jericho… over 30 kilometers! 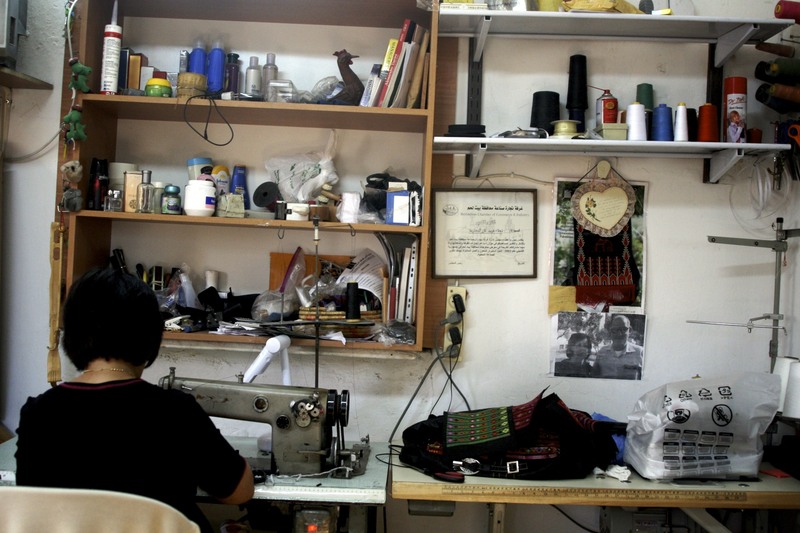 The weekend before that, I went to Hebron to collect embroidery from craftswomen with Najla, a woman from Bethlehem who has been teaching me about Palestinian embroidery. 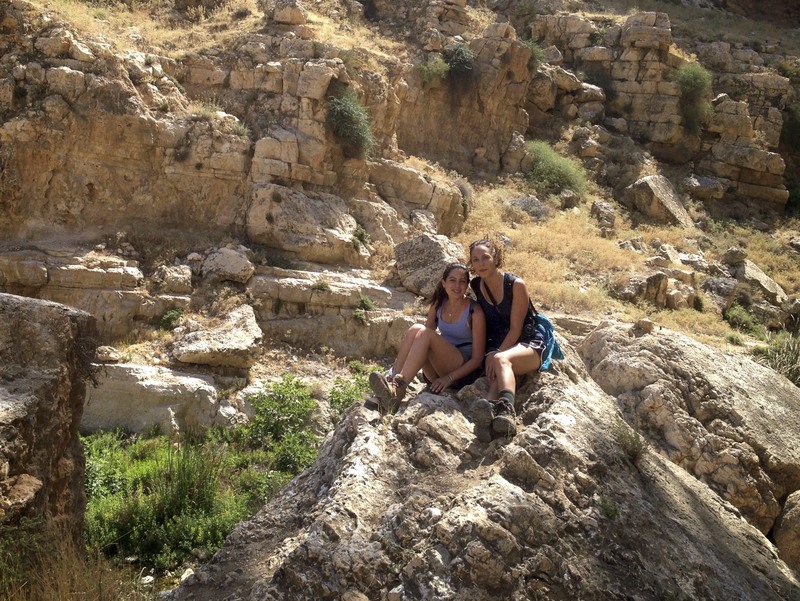 Then, Arielle arrived and we hosted Shabbat dinner and hiked Wadi Qelt. On top of all the adventures, I signed up for two additional intensive courses. So right now I’m taking 9 classes plus 12 hours of Arabic a week. My goal for this weekend is to relax and recover. Shanti. Also, I made the decision that I will never again live somewhere for only one year. Two years is the minimum (unless something/someone convinces me otherwise… it happens sometimes). I haven’t lived in the same place for more than one consecutive year since I was a sophomore in college (2007), and I’m not sure if it counts since I went home during summers. Since high school my life has been Alabama → DC → Uganda/Bolivia/Netherlands → DC → India → DC → India → Alabama → Israel. I’m so familiar with the one-year thing that I’ve traced a predictable pattern. The first three months are uncomfortable: I work hard to learn the ropes, navigate life and develop relationships (I’m slow). I buy things from the market that I don’t recognize (like sumac) and try to figure how to incorporate them into my salads. The 2nd three months are bliss: I’ve established a routine, have friends and am in the thick of exploration and excitement. I buy things from the market that I’ve learned to love like wine soaked olives. The third three months are weird: I realize that goodbyes are approaching, but it’s not time yet. I buy only fresh produce from the market because I know I have a drawer full of weird spices and dried beans that I need to use before departing. 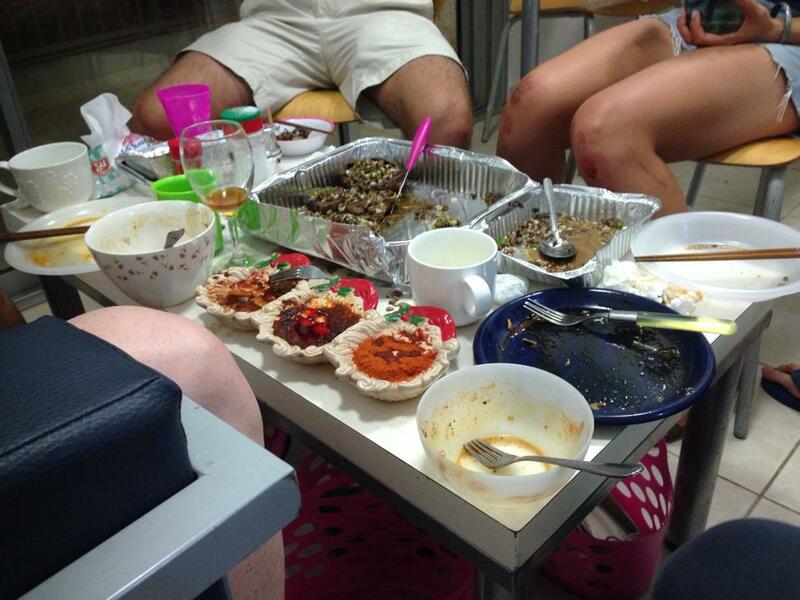 The last weeks are a whirlwind: celebrations, goodbyes and preparations. I only buy easy street food like falafel. Now, in the mid-third-three-months-stage, I prioritize my activities and question their worthiness of my time. Does this Arabic article translation deserve three hours of my Wednesday night? No. By now, I’ve established relationships and identified meaningful projects, but it’s too late to invest new energy in them. I know it’s wrong, but in the back of my head all I can think of is how leaving will disrupt everything. And then I turn into a crazy person trying to fit all of the little pieces in. One year is the worst. 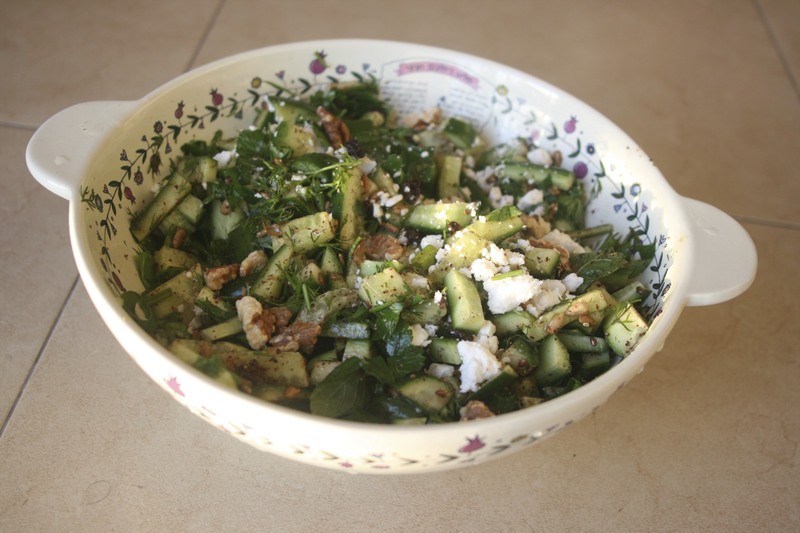 Gently throw sliced cucumbers, herbs, currants/raisins and feta into a bowl. Mix olive oil, lemon juice and zest, soumac, salt and pepper in separate vessel. Pour oil mixture over the salad and gently toss. 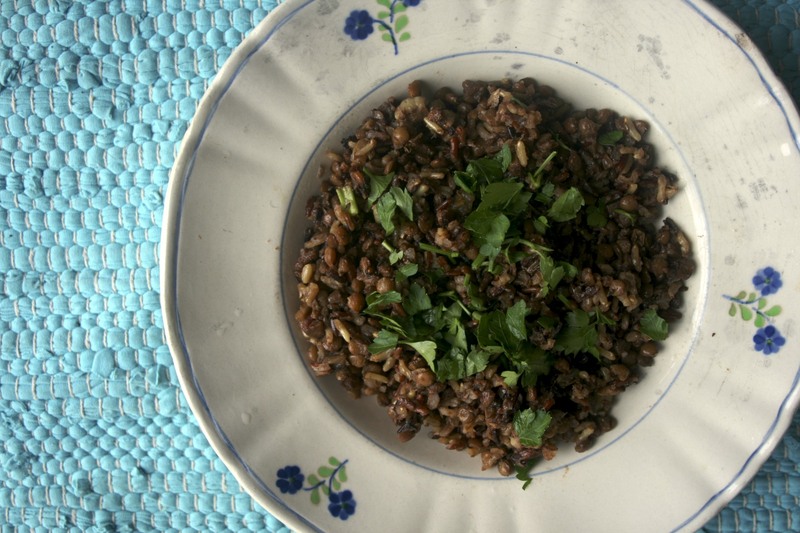 Top with walnuts and serve immediately. Or place in the fridge and serve chilled on a hot summer day. 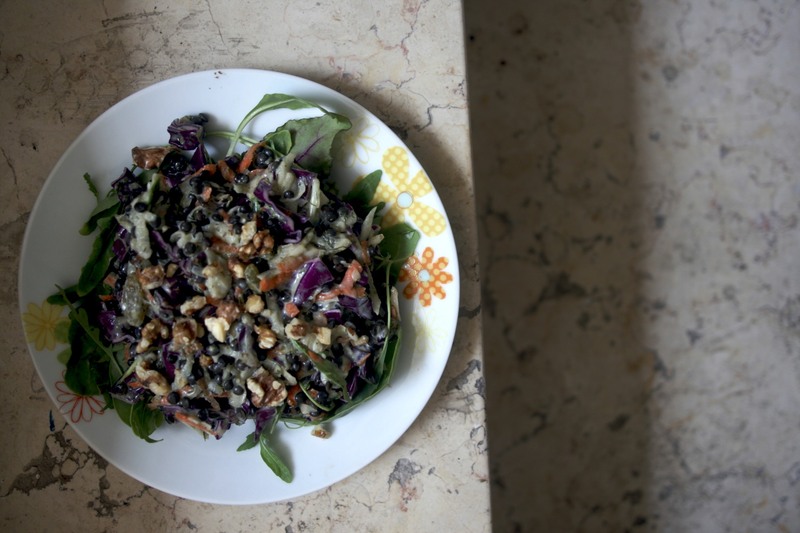 This salad was an attempt to use some of the weird spices sitting in my drawer since the first three months. 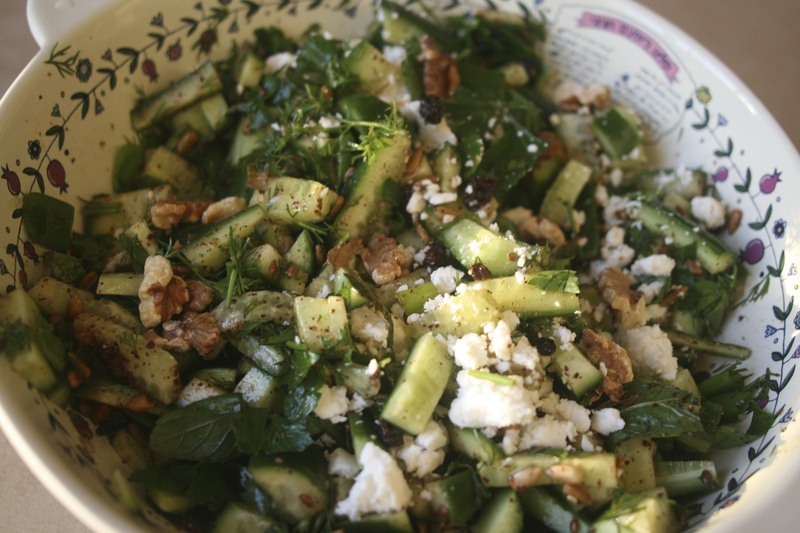 It’s the perfect summer salad – cool and refreshing with lively herbs. Dad’s elbow looks disgusting, the pictures of my wound are disgusting, and some of the shots of your portobellos are almost at that level (hint: if you hold the camera still/shoot in natural light, your pictures won’t be a fuzzy mess… After almost two years of food-photo sharing here, I expect more!). But foreal yuck dad’s elbow. Bodies are so weird. My knee is completely fine now. The wound was fun to watch from the bloody mess on day 1 to feverish oozing on day 4 to itchy crusting on day 7. I can’t get over how quick the transformation from broken to healed happened. I’m amazed at the human body. There is no science behind his effort, but I believe him. I believe that the mind-body connection is mighty, and that trust in the metaphysical can help bridge the gap between the two. But don’t worry, I’ll need another year in Nachlaot to reach his level of mind-body-God enthusiasm and I only have three months left. Only three months is only twelve Shabbats, which is alarming. I’m starting to panic about fitting everything in. There’s still so much family I need to spend time with, so many beaches I need to lay on, so many friends I need to visit…. so many hikes and rooftop parties and walks and papers and recipes and cafes and sites. Thinking about leaving in three months makes me sad and overwhelmed and the initial worry quickly spins into something really crazy: I only have 3 months until I leave Jerusalem and all the fun is over… I only have 4 years until I’m thirty and all the fun is really over. Remember when I went for an endoscopy and colonoscopy because of severe stomach pains with no apparent cause? At the end of it all, the gastroenterologist sat me down in his office to tell me about all of the Jewish women in their 20s that come to him with stomach pain. Our guts feel the conflicting pressures of time and are knotting up under the heaviness. That’s it. The sickness is real. Baruch HaShem I no longer suffer consistent pangs in my intestines, but reconciling my riddle with time is a constant struggle. How can I enjoy anything when I’m totally freaked out about fitting it all in? I feel like I need to hurry, but I know that that’s not the answer … and I’m on the edge of relinquishing it all to the God(s). ps. You found my old journals?! That makes me nervous. 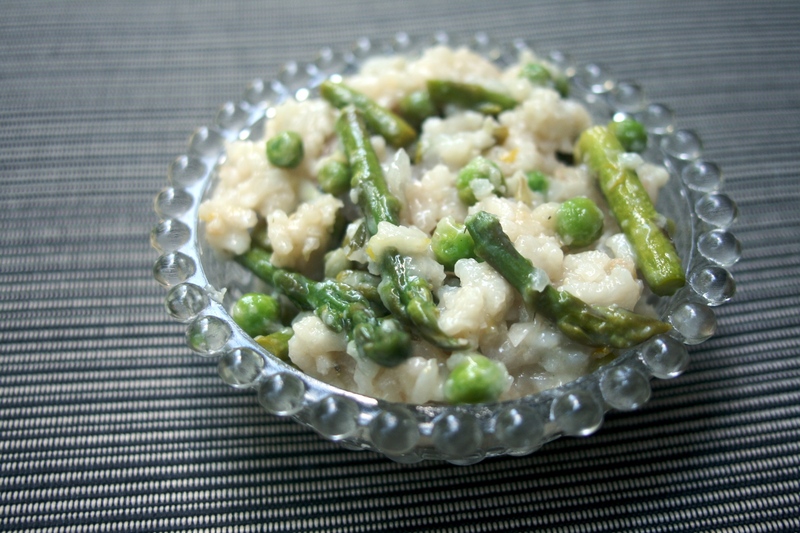 Speaking of time, the Meyer Lemon Risotto with Peas and Asparagus recipe below needs to made right now if you want to take advantage of Spring produce. Don’t waste one second of prime asparagus time! Spring is running away! It’s making me nervous! Go go go! 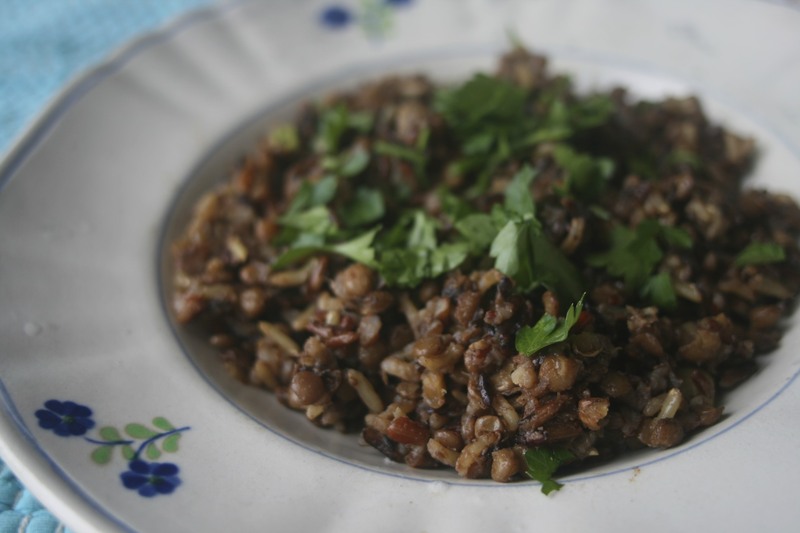 The Herby Pretty Lentil and Yogurt Salad is good for all of summer (phewww). In fact, my to-do list inspired me to brainstorming for Shavuot weeks in advance. I have three days off of school for the holiday and am hoping to do some sort of cooking/eating with family. 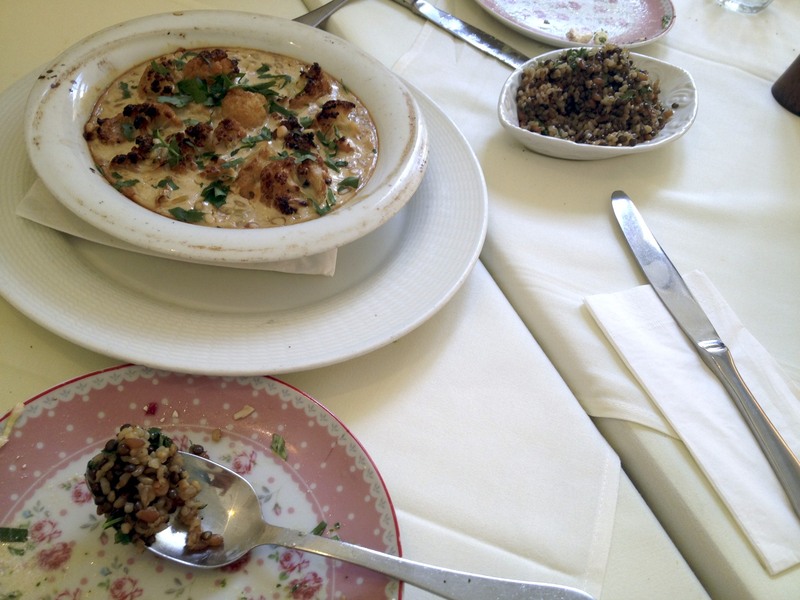 The Shavuot custom is to serve a dairy – I wanted to come with something other than blintzes and cheesecake (mostly because those things are so tricky to make!). 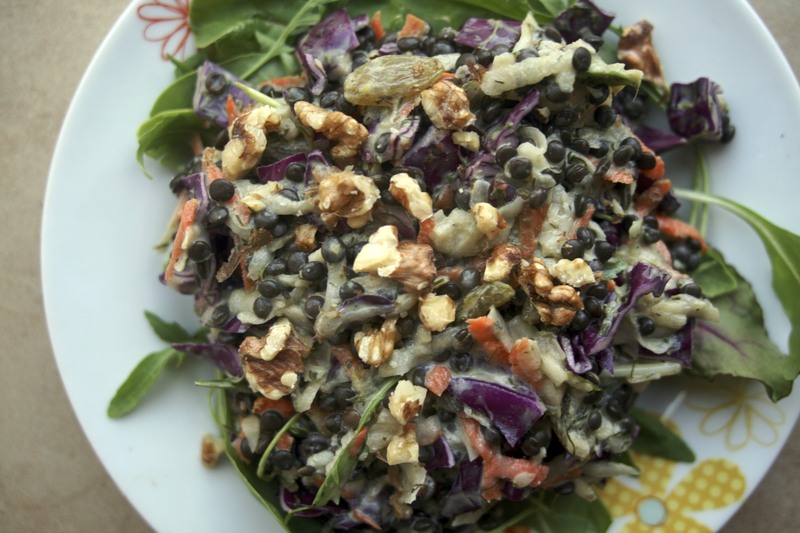 This salad is a great solution – dairy and healthy and summer. But mostly I like it because it’s colorful. I brought it to Tan’s house for a family lunch last Shabbat and it was a hit. 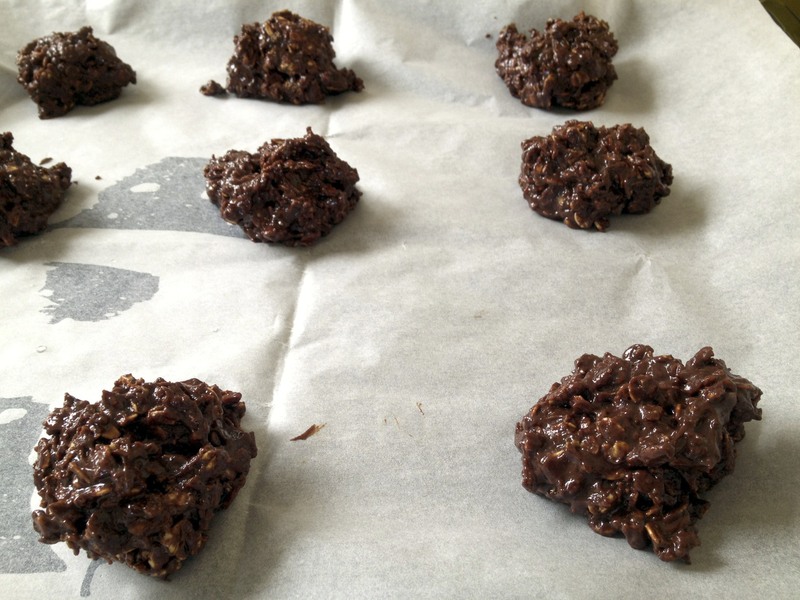 This recipe is proof that good things can come from time-induced anxiety. First, make your pesto. I’m obssesed with fresh dill. 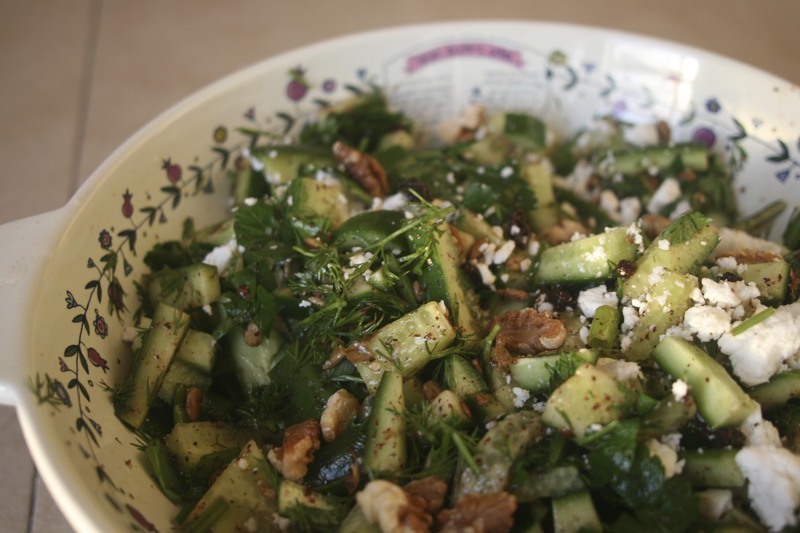 I chop it up in all of my salads and eat it in surprising pairings. My newest breakfast is a rice cake with almond butter, sea salt, and fresh dill. I know, I’m weird. This pesto is great to have on hand for when I want to add some excitment to my daily salad in a hurry. 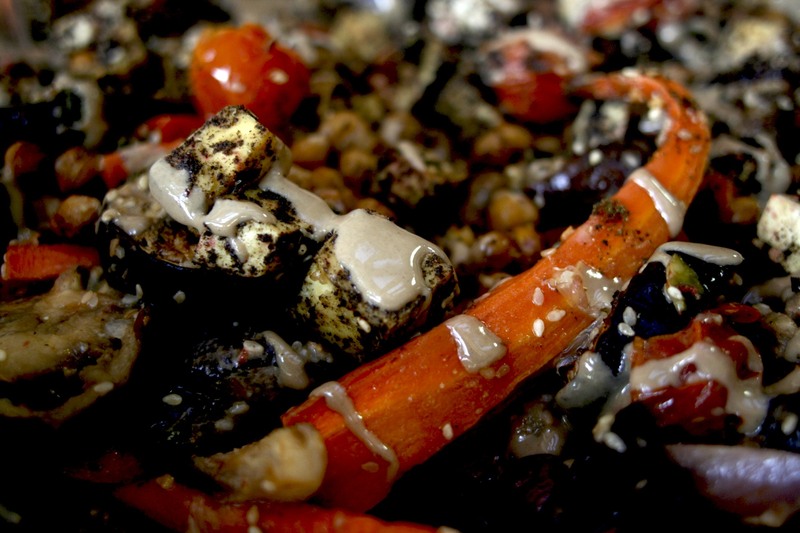 Just one tablespoon in a bowl of chopped veggies, and you have an exciting meal. 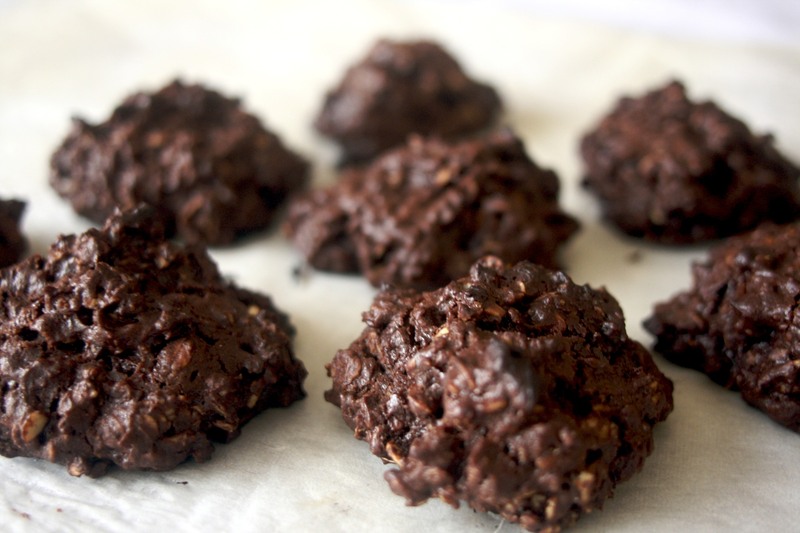 It’s easy to get overwhelmed by all the ingredients, but don’t worry – its easy! 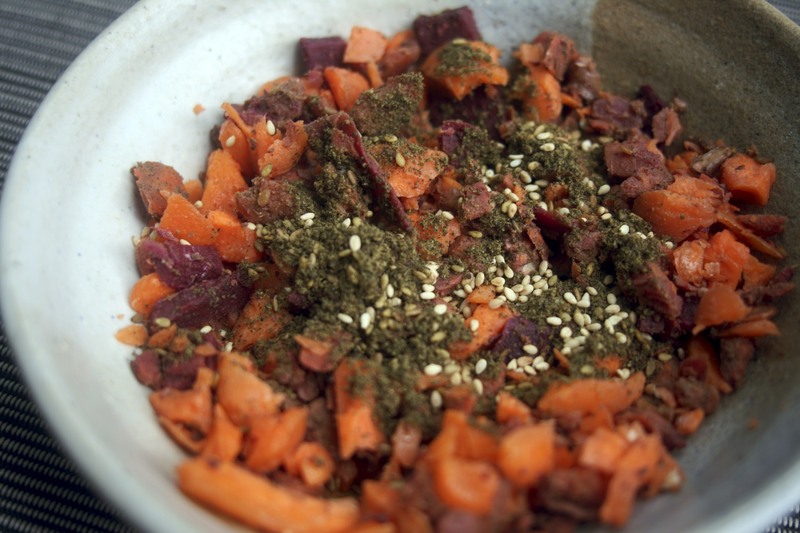 Just take all of the ingredients (make sure you wash herbs thoroughly) and add to a food processor. Blend until you have a nice puree. I like my pestos hardy and thick, but if you wish to thin it out, add an additional tablespoon of olive oil or more. 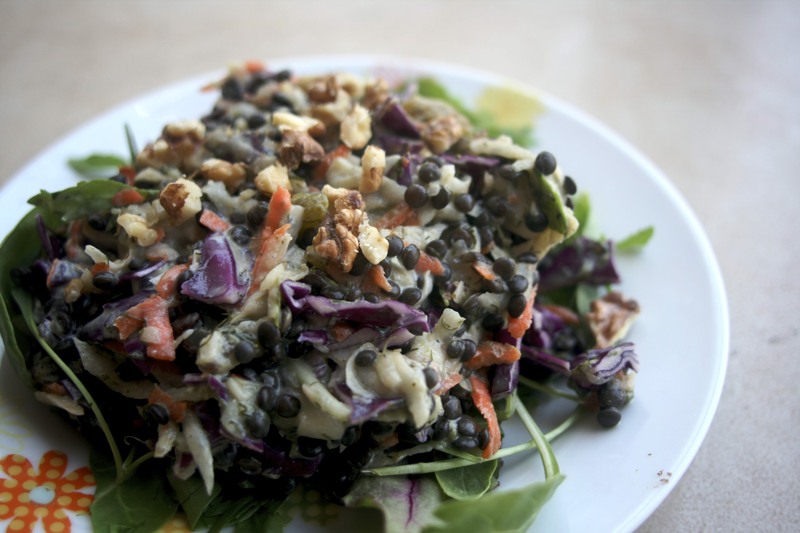 The quantities I’ve suggested will yield plenty more than you will need for this salad. Additional olive oil will help to preserve it longer if you’re not eating it every day (every meal?) like I am. The rest is REALLY easy. 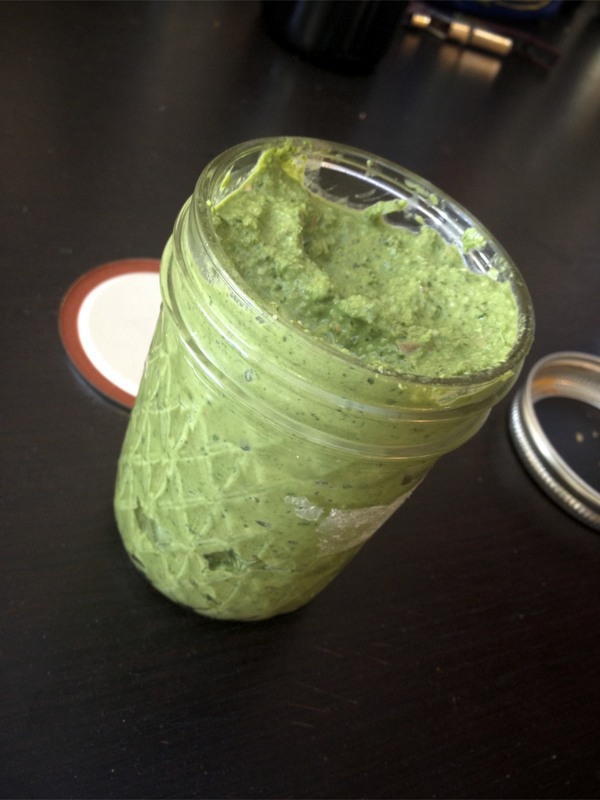 First, mix your dill pesto with yogurt for a green beauty paste. 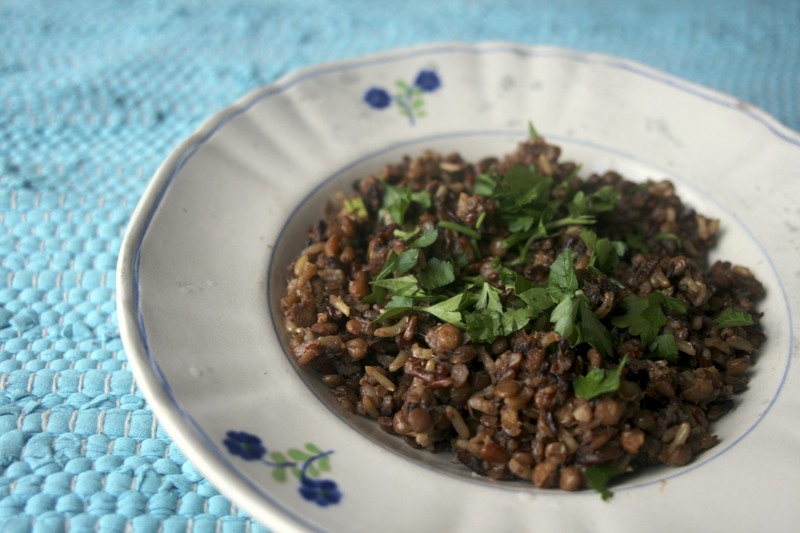 Place the lentils in a bowl and mix with the chopped and shredded veggies, garlic, walnuts, salt and pepper. Then, fold the salad into the yogurt and herb mixture. Throw in a handful of golden raisins if you want a nice tang. 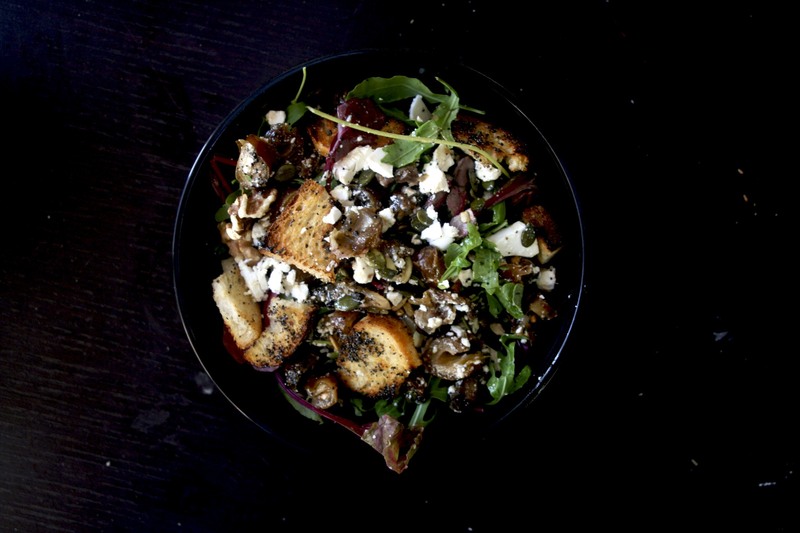 Serve over arugula and drizzle with olive oil. Heat olive oil and add onions, garlic and salt until onions are translucent. Add arborio rice and stir until coated. Add wine and simmer for 4 minutes, until most of the liquid has been absorbed. Adjust heat to a simmer. Slowly, add water or vegetable stock half a cup at a time. Stir frequently. This may take 45 minutes. 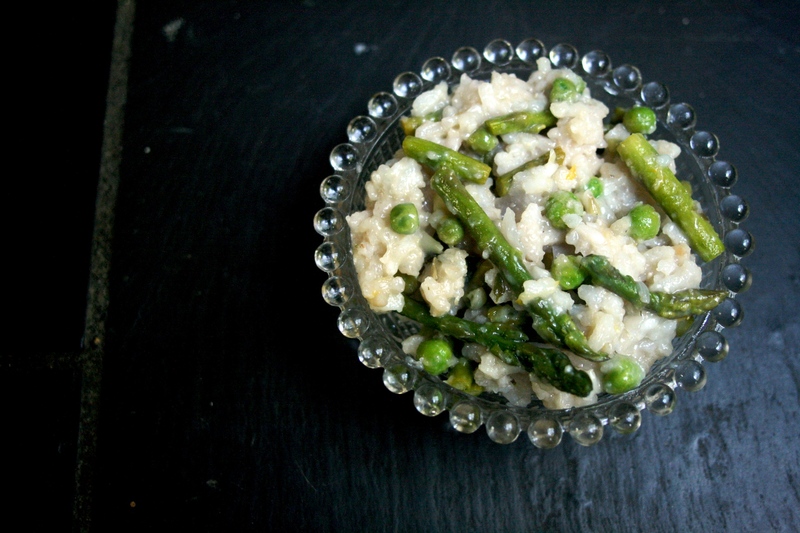 When all liquid is fully absorbed, remove from heat and stir in lemon zest, frozen peas, and steamed asparagus. Garnish with plenty of black pepper, parmesan cheese and pine nuts. 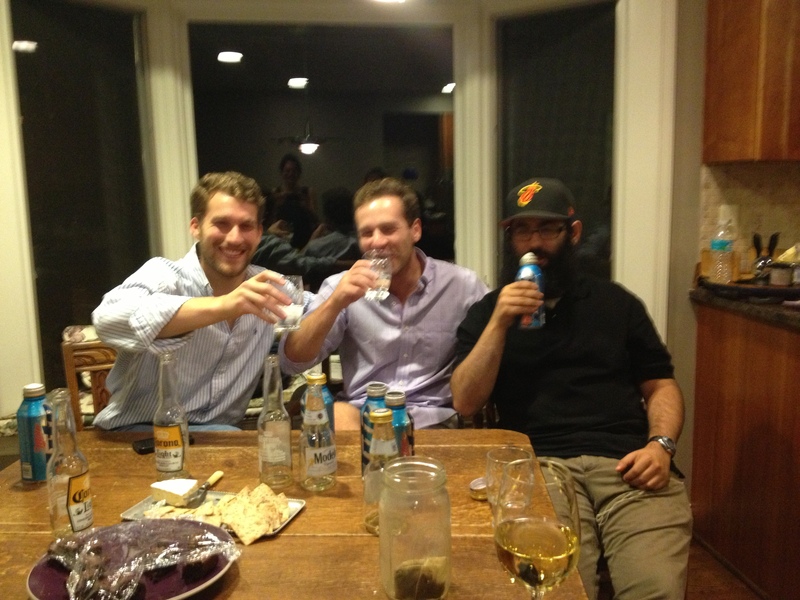 You got your wish: I’ll be home for Rosh Hashana. 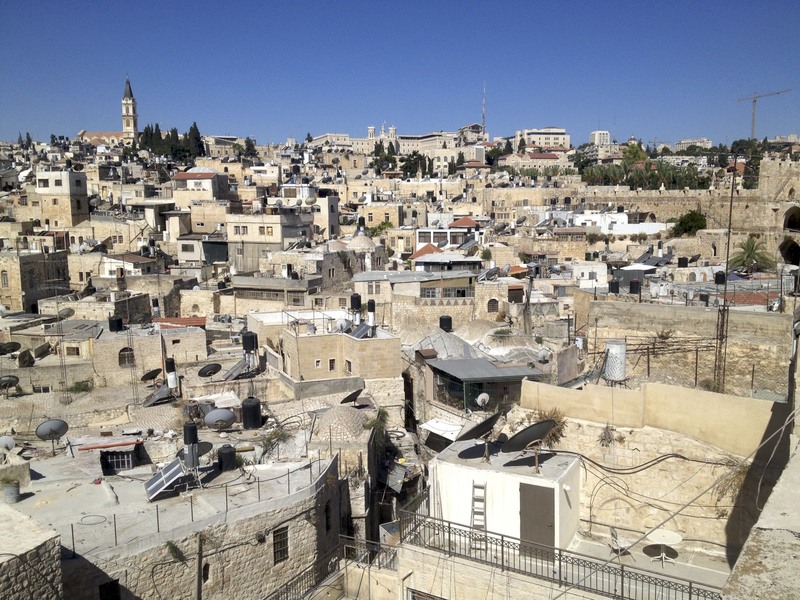 My plans took a swift left turn last week… another plane ticket, another commitment; it’s real… I’m moving to Jerusalem. A year of hummus and salty cheese is reason enough. I’m nervous and I’m laughing about it. My deliberation over the decision was all-consuming as usual. But I learned something important: that my gut is a more informative organ than my brain. It’s smarter than the projections cast by rationale – it told me that right now I need nourishment and connection and new territory. Even though I worry about long-term stability (straight roads put me to sleep, so I seek twists and turns that sometimes just become rocky bumps what is wrong with me?! ), I’m okay with stepping onto a wayward path right now. I don’t care about the weirdness. 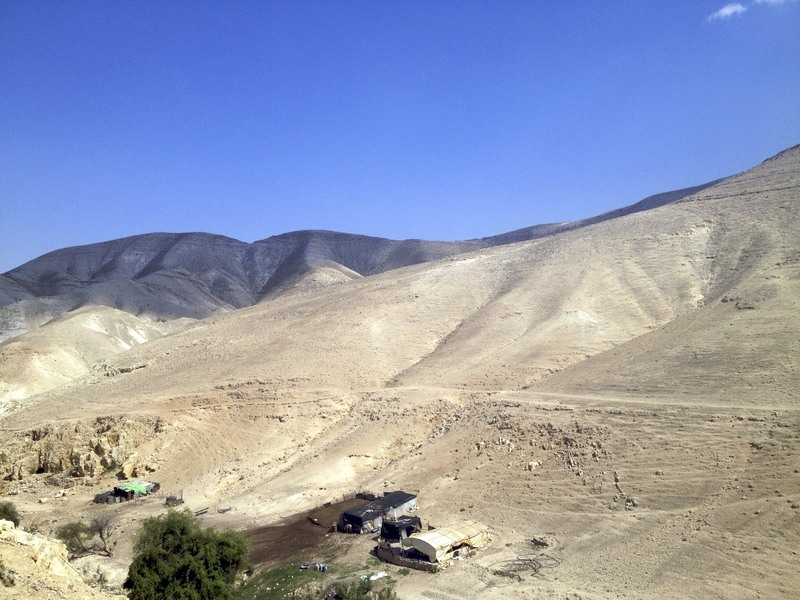 I’ll be home through the holidays and am excited for the Esrei Yamim Cleanse. 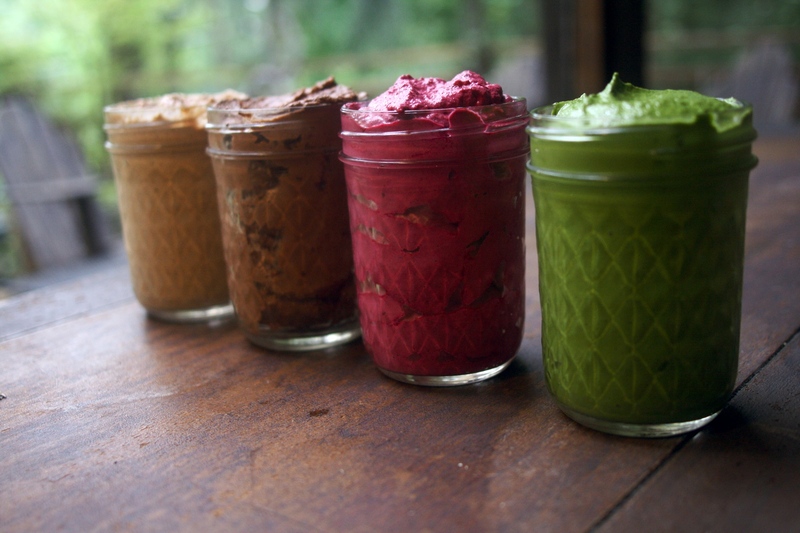 I hope that more people join this year since we now have a whole Cleanse category in our recipe index. 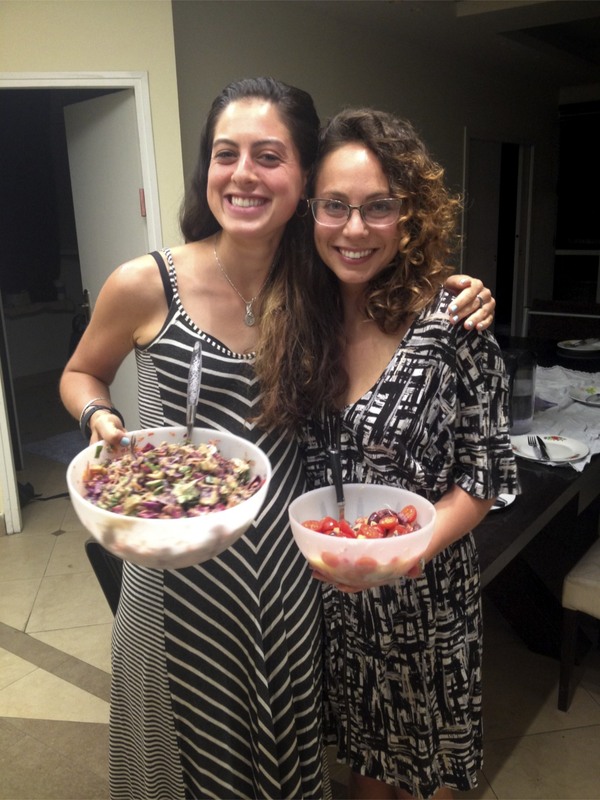 Can we make our Rosh Hashana menu as cleanse-friendly as possible? 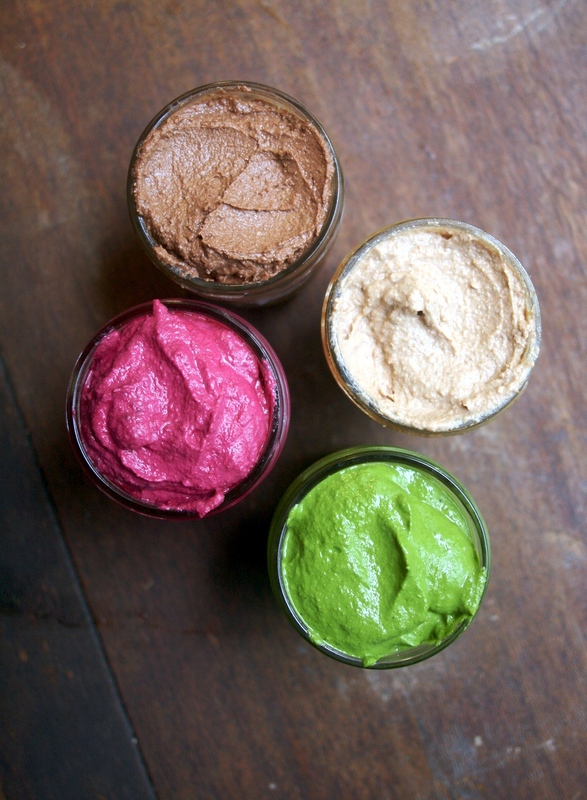 I’ve been practicing with the vitamix (since our reunion we’ve been inseparable – it’s pathetic) and last week, I made beautiful purees that will be perfect for Rosh Hashana appetizers and Esrei Yamim snacks. No offense – I think my beets are prettier than yours. 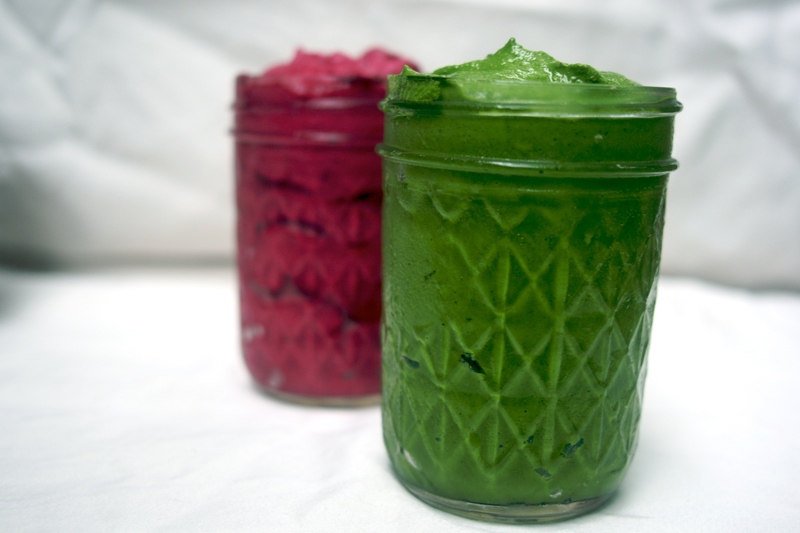 This puree is creamy, earthy, deep and freaking rad. 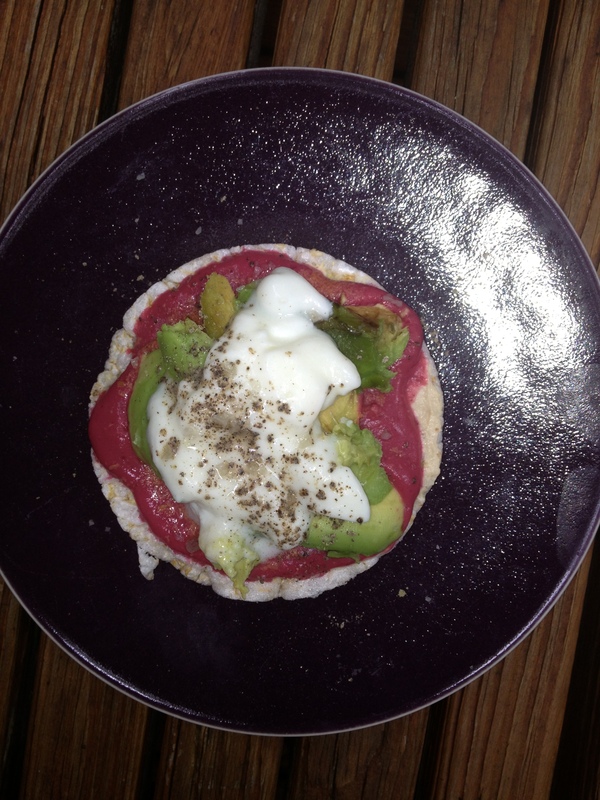 My favorite breakfast lately is a rice cake with beet puree, yogurt, avocado and salt and pepper. It’s also great with apples, sandwiches and vinegary salad dressings… it will be a fabulous accompaniment to honey during the rounds of Rosh Hashana apples n’ honey. And it’s so pretty! Wrap unpeeled, whole beets in foil and roast for 40 – 50 minutes. Allow to cool and peel (the peel should slip right off). 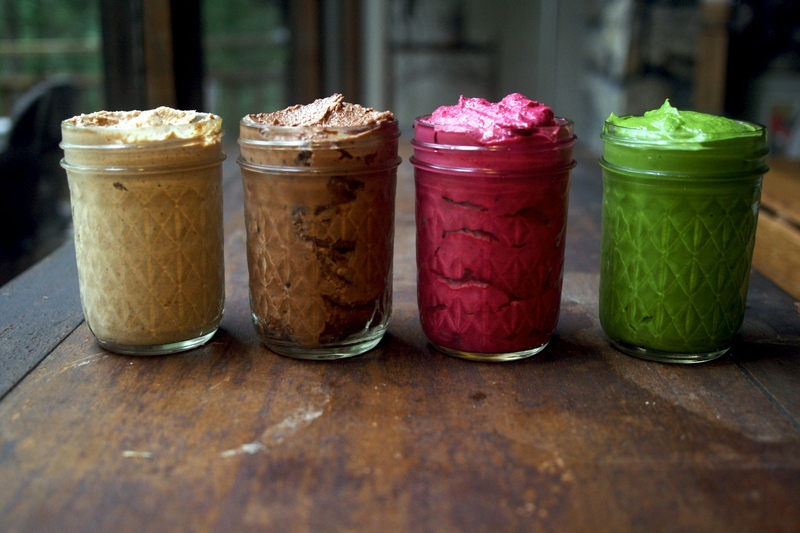 Blend with remaining ingredients in food processor until a thick, psychedelic paste is formed. So simple! 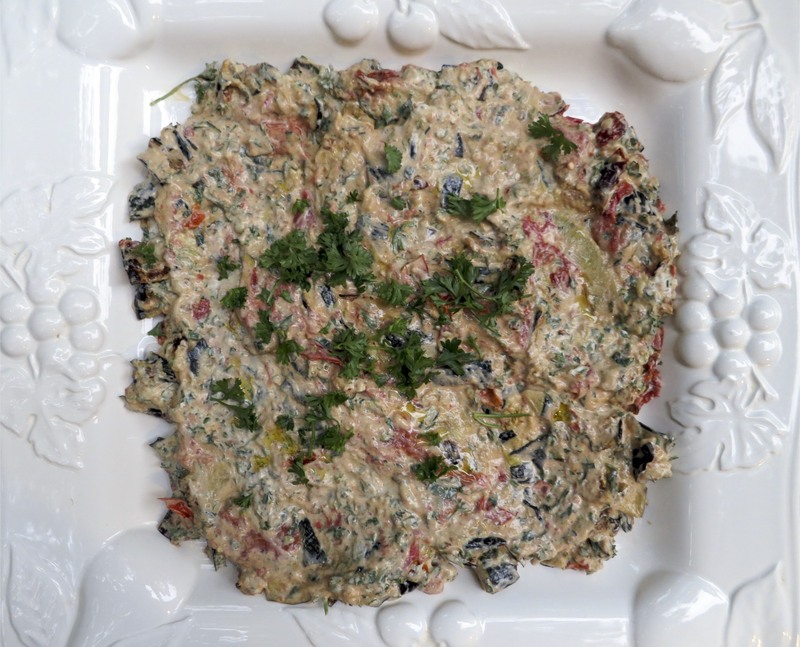 Perfect as a cracker dip or over roasted veggies. 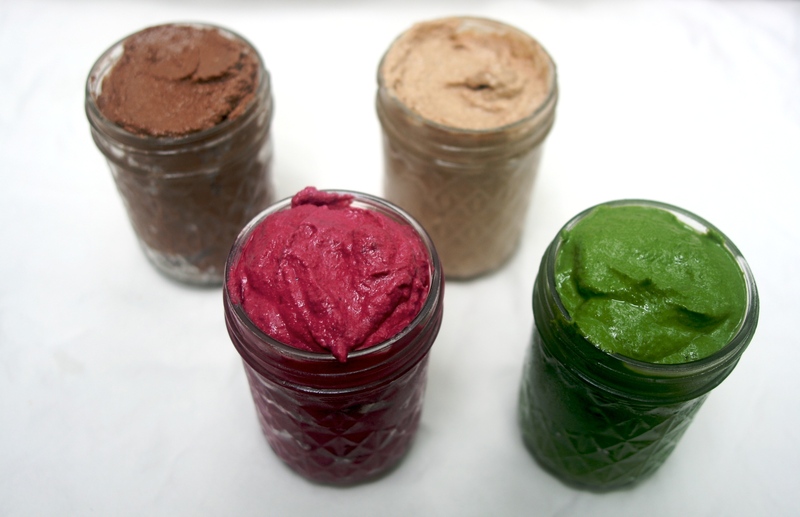 Add all ingredients to food process and puree until desired consistency. 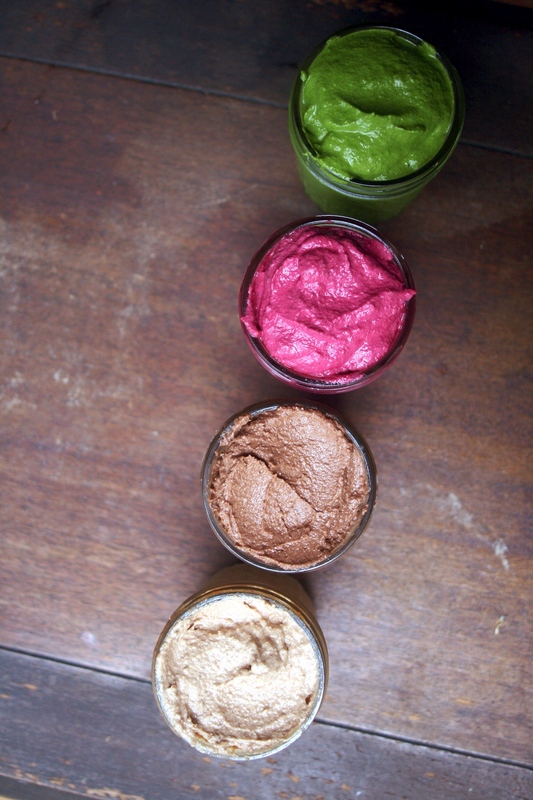 I’ve been experimenting with a cleanse-friendly pudding recipe for almost two years now – I’ve tried it with avocado, chia, flax, cashews, almonds, dates, apples…. the variations are countless. I finally got it down to the perfect result. And the recipe requires just a few basic ingredients. I have two versions to share with you: vanilla and chocolate. Add all ingredients to food processor and pulse until blended. Add more warm water if needed. Consistency should be like creamy peanut butter. Delicious warm or cold, this “pudding” is so healthy that you can eat it for breakfast… it’s just like a bowl of oatmeal with dried fruits and nuts! It’s also satisfying as a dessert. Try it with fresh berries or peaches and a dollop of greek yogurt for a filling sweet treat. Layer onto a rice cake with peanut or almond butter for a healthier take on the Reese’s Cup! Or stir into greek yogurt and berries for a special treat. Cook amaranth (bring one part amaranth to two parts water to boil and then reduce to simmer… it takes about 20 minutes). 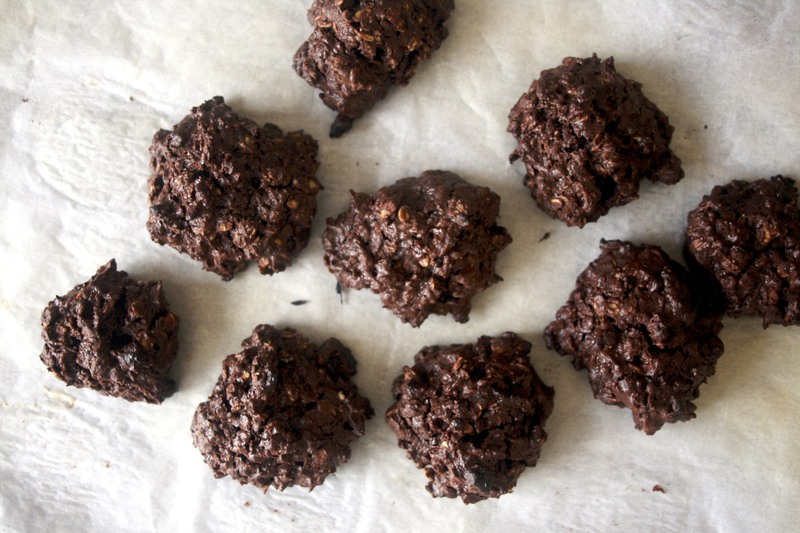 It should be a sticky, gooey consistency… like thick oatmeal. 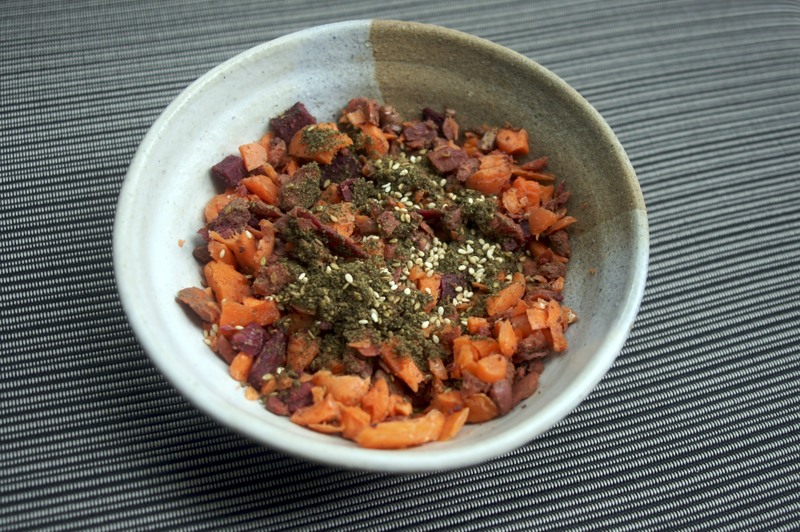 Mix cooked amaranth with remaining ingredients. Line two cookie sheets with parchment paper and spread amaranth mixture into thin layers, using the back of a spatula to even it out (I covered the back of my spatula with olive oil so it wouldn’t stick to the amaranth mixture). Place in oven (convection bake setting is preferable) at 170 degrees for 35 – 60 minutes, depending on how thin your layer is. Remove from oven when browned as crisp. 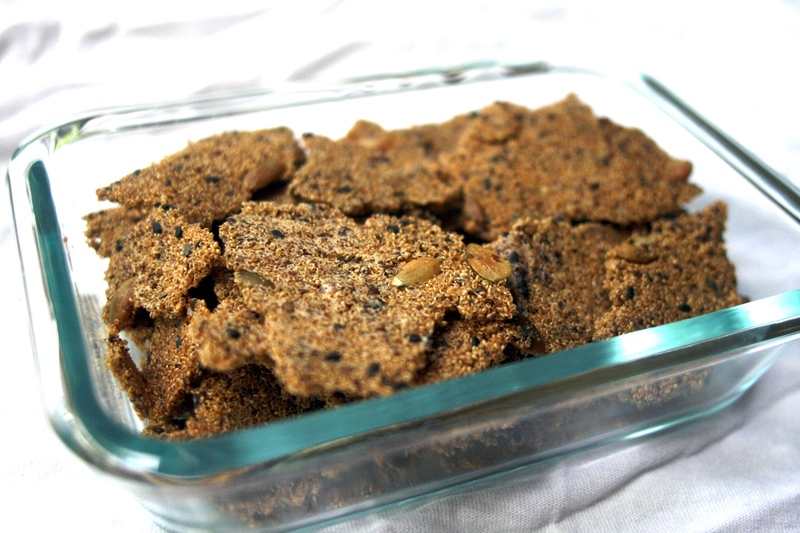 Allow to cool and gently break into cracker-size pieces. They should easily lift from the parchment paper. 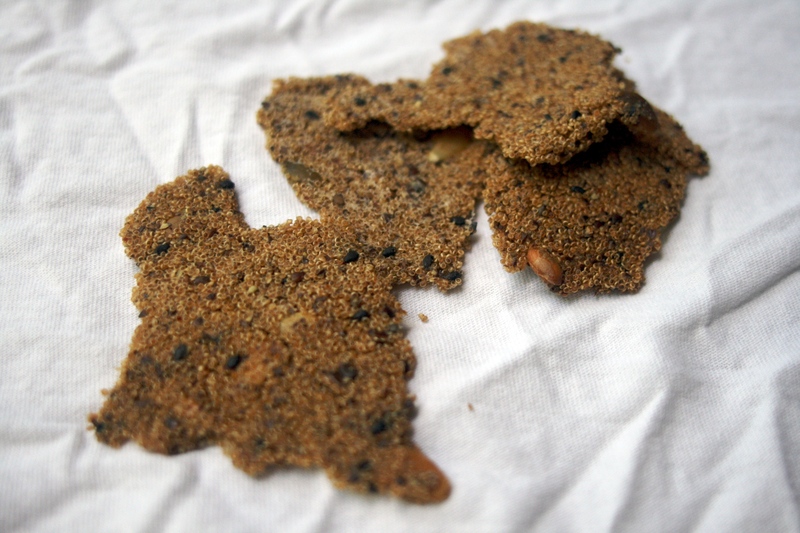 These crackers are super healthy – vegan, gluten free, etc – and great for dipping into purees or crumbling over salad or yogurt bowls. Home after 6 months of wandering… It’s finally time to unload! My closet shelves seem wider and your kitchen appliances shinier and I am SO done with my freakin humongous backpack. I still need to process it all as I recover from the exhaustion that comes with the bag-lady package, and I can’t stop thinking about Israel. My role as birthright staff was a success and I enjoyed the days with our distant but familiar family in Israel after the trip. 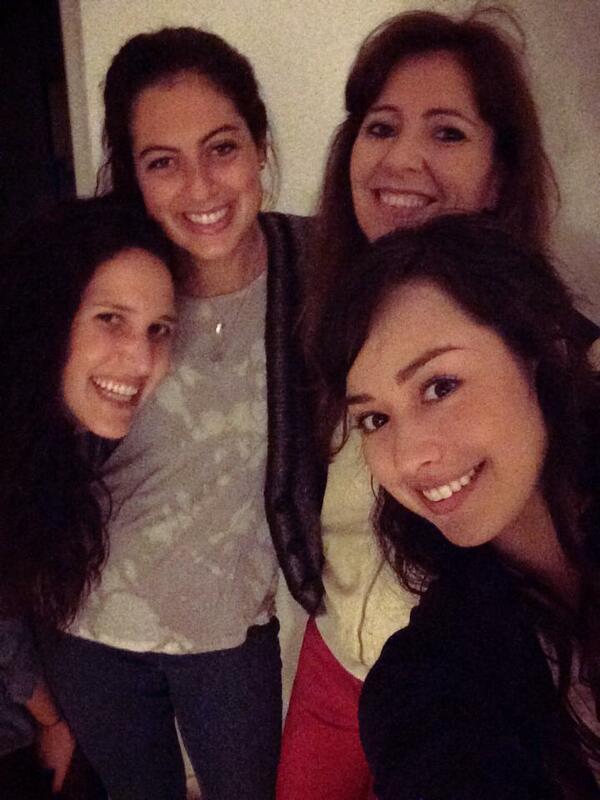 During my first few days in Israel, I laughed a lot in my head. 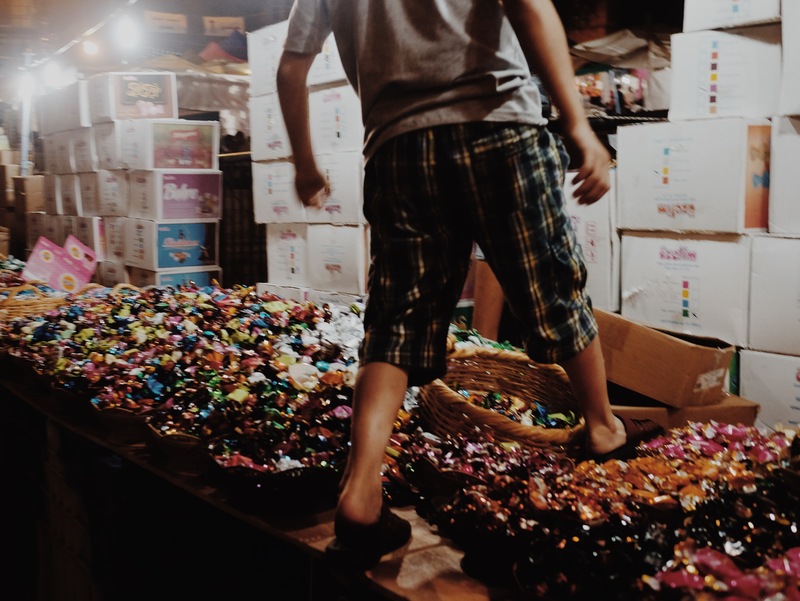 A simple “Shalom” slammed me back to the pit of my childhood… Hebrew words were throwbacks that roped chants from the Jewish Day School back into my brain. 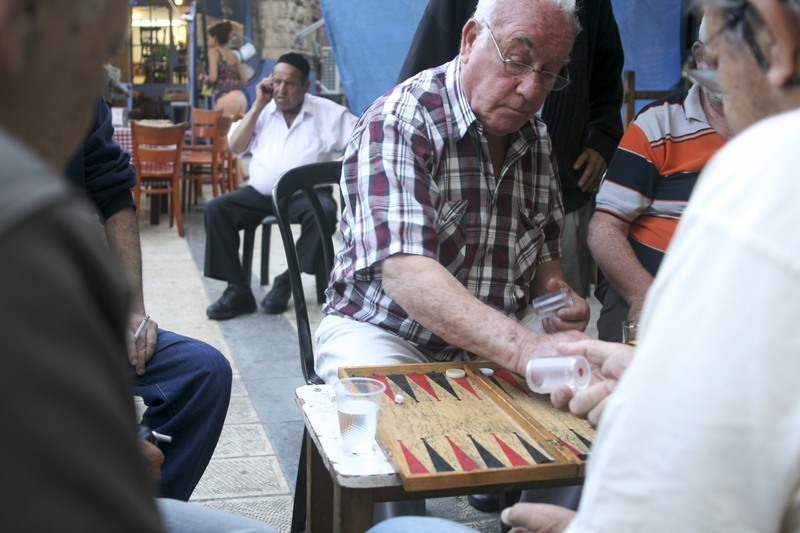 Every Israeli situation was a novelty. 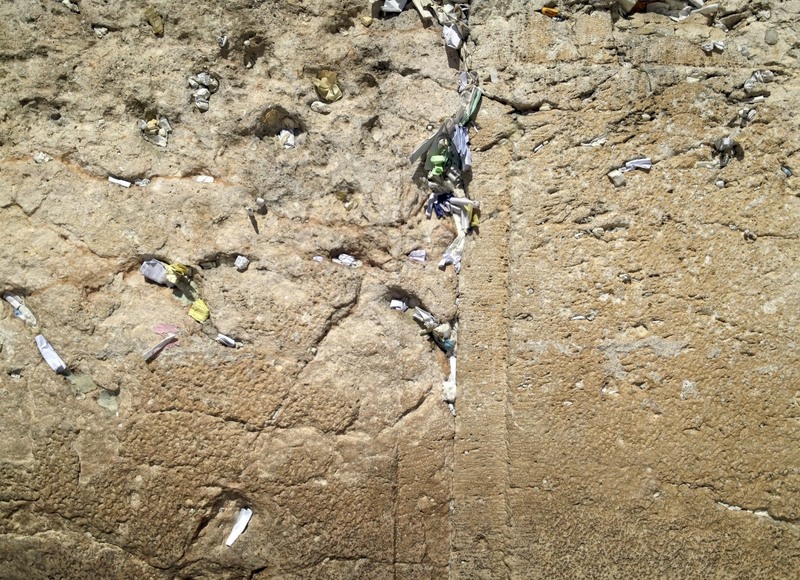 I know that a visit to the Western Wall is supposed to be emotional and that I’m supposed to cry when I touch it and blablabla. But during our visit to the Old City, all I could think of was my 4th grade art project, when my classmates and I each reported on one of the city’s landmarks. I was in charge of Sha’ar Ha’ashpot, the Dung Gate, where Jersulamites chucked their trash. 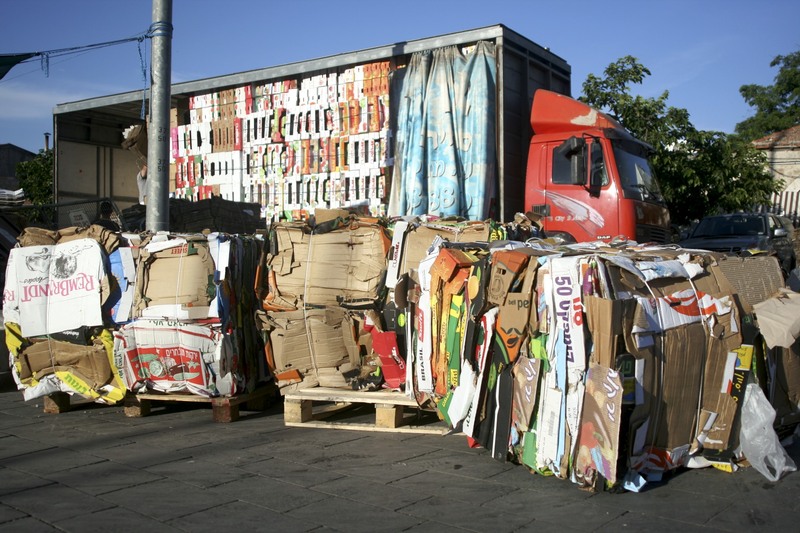 I presented it with an intricate drawing of an old relic surrounded by diapers, banana peels and flies. From that moment on, Sivan made a rule that I couldn’t call her name unless I sang it. 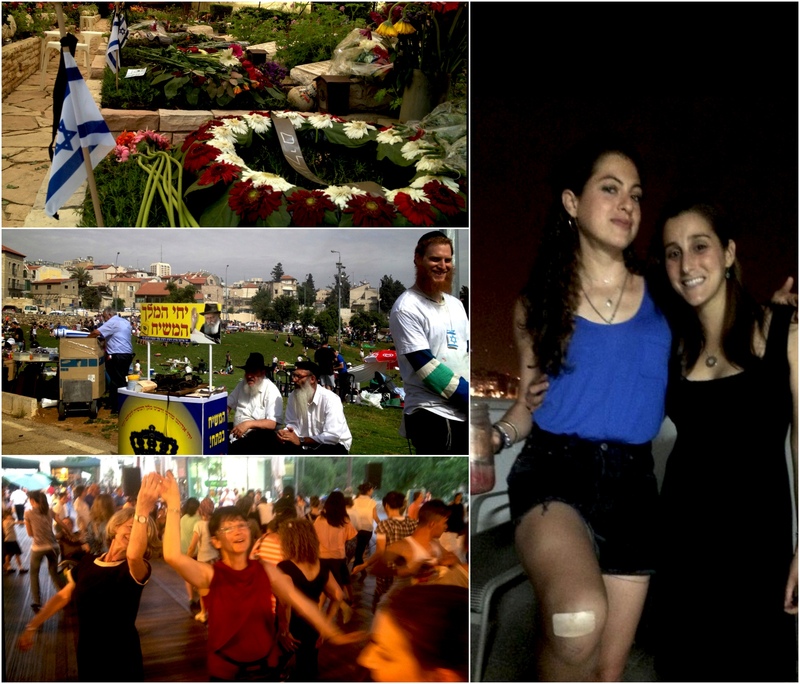 My American Jewish education prepared me for a visit to my homeland with Israeli songs, folk dances and silly games that seemed irrelevant to any real situation. And as I toured ancient sites and tested memories in my head, the nostalgia for Israel that I was trained to feel possessed me… it was creepy. 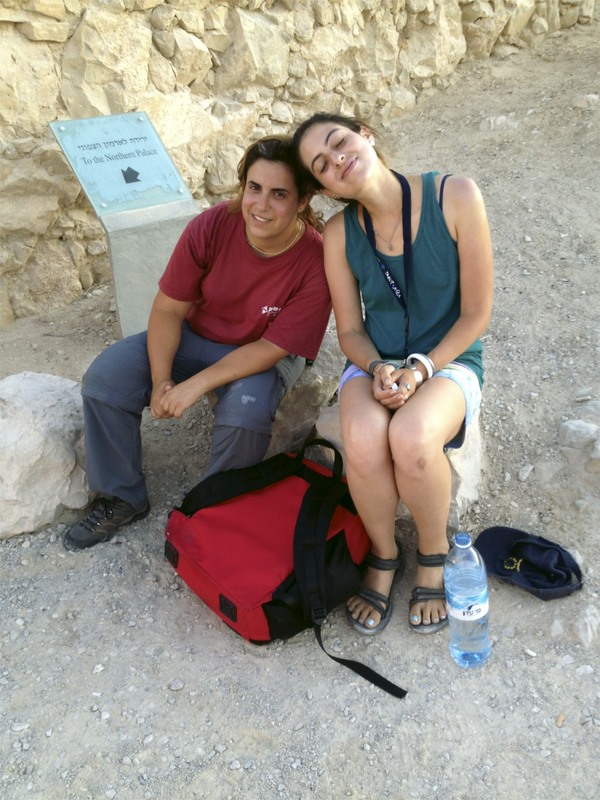 But after ten days of touring ancient sites with other American Jews (Jewish Americans? 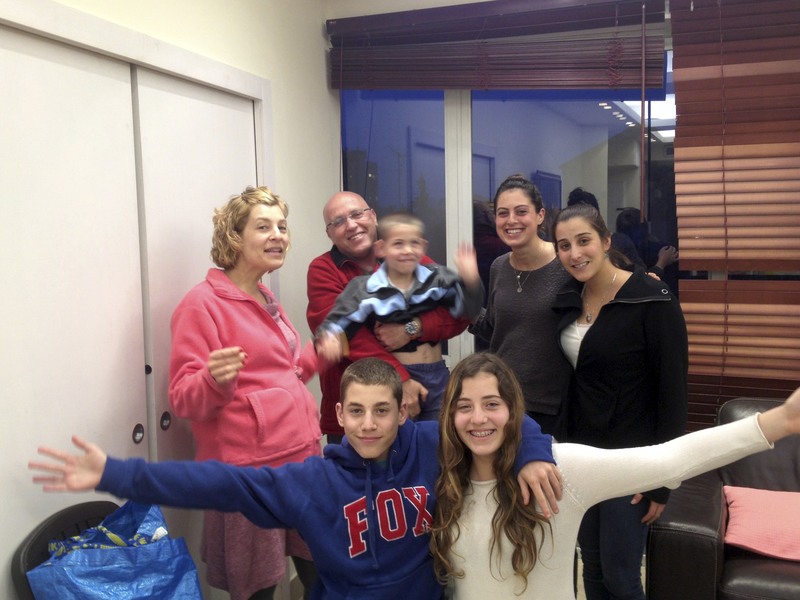 ), I relocated to the homes of our Israeli family members. I met Chana for the first time, your Israeli replica. 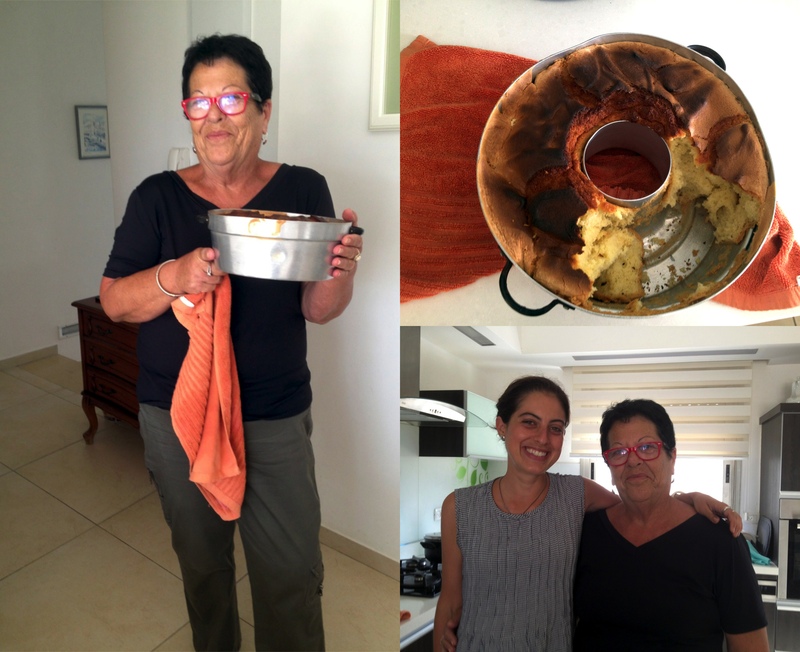 After showing off each room in her home (including a whole room just for kitchen appliances), she force fed me for hours… Israeli salads and hummus and a spongy orange cake that tasted exactly like one Bubbe used to make I couldn’t believe it. I observed personalities so clearly unique to our family’s gene pool… the force feeding, the loud talking all at once… that at times I thought I was back in Birmingham. 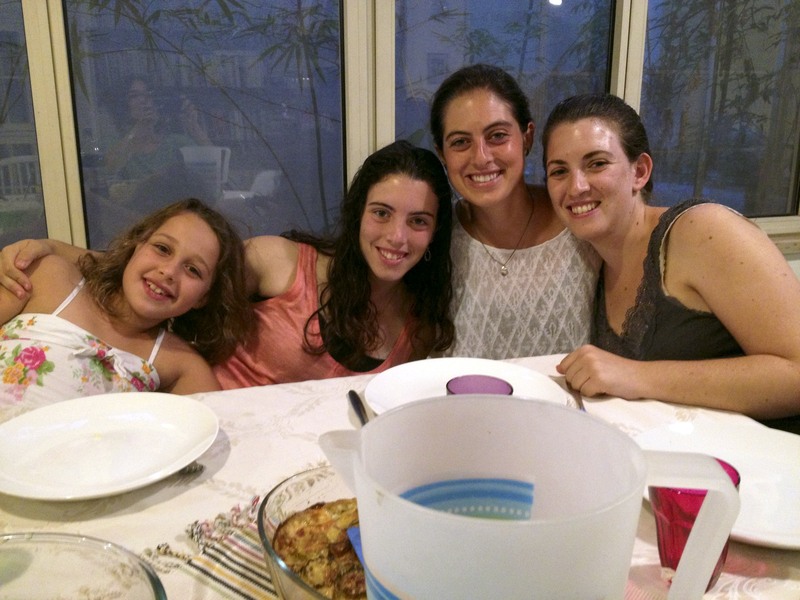 I heard stories of how Zayde’s brothers and sisters landed in Israel, and how we have cousins in Russia who are rediscovering their Jewish heritage right now preparing to make Aliyah. 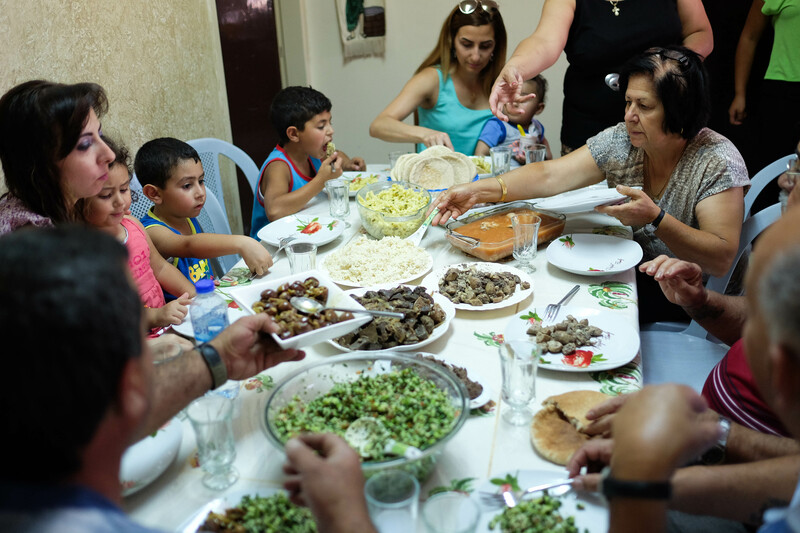 Sitting around a table of aunts and uncles, baby cousins and plates and plates of food, I saw, firsthand, the joyous outcome of a country that prioritizes the provision of a safe haven for Jews seeking refuge. The songs and dances that I learned at summer camp and school provided the initial backdrop of familiarity… but with the family, the sense of belonging that I learned about at summer camp and youth group and Jewish Day School finally unfurled. I know it’s all a cliche and I’m surprised by my reaction to Israel… it wasn’t my first time there but it was the first time I’ve felt this way. 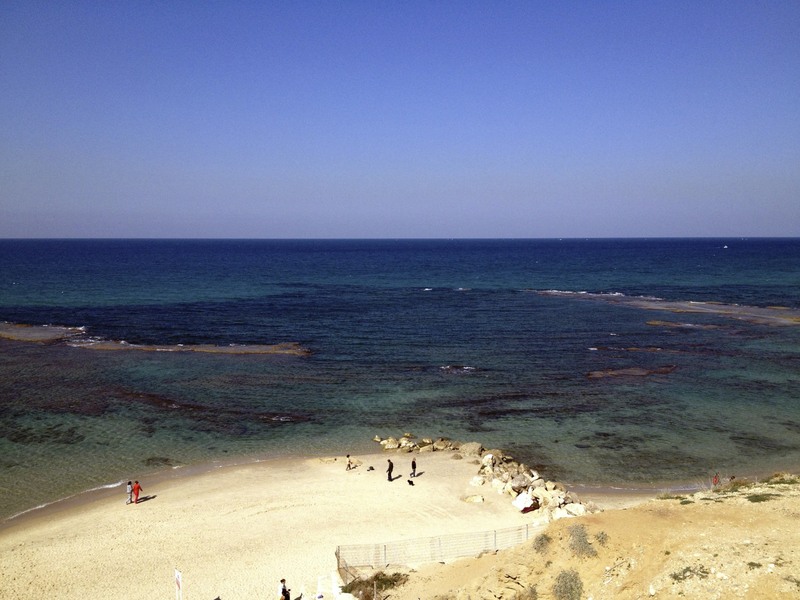 I think my emotional experience was shaped by the juxtaposition of my itinerary: I headed to Israel from India. In India, my outsider perspective was extreme and the “welcome” limited. The religious and societal structures create a barrier that makes integration into Indian culture impossible for a white American like me. The newness, surprise and unfamiliarity of everything around me in India was acutely opposite of the nostalgic comforts in Israel. So of course the “welcome home” from the Israeli customs officer in the airport elicited a heightened reaction. I don’t really know… I have a lot to unload. 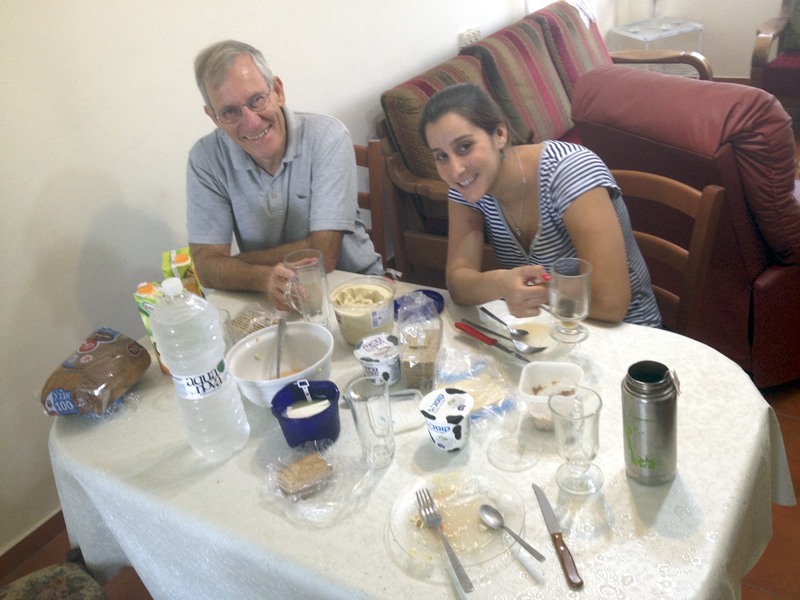 In Israel, the breakfast spread is glorious: dozens of fresh salads, salty cheeses, creamy tahini and thick yogurt. The participants on my trip stared at my plates piled high with crunchy veggies at 7 AM each day, How can you eat vegetables so early in the morning? Post breakfast bliss with Naomi! Wow. I’m not sure I’ve ever had such a positive influence on a young person’s life. Salads in the morning are where it’s at. 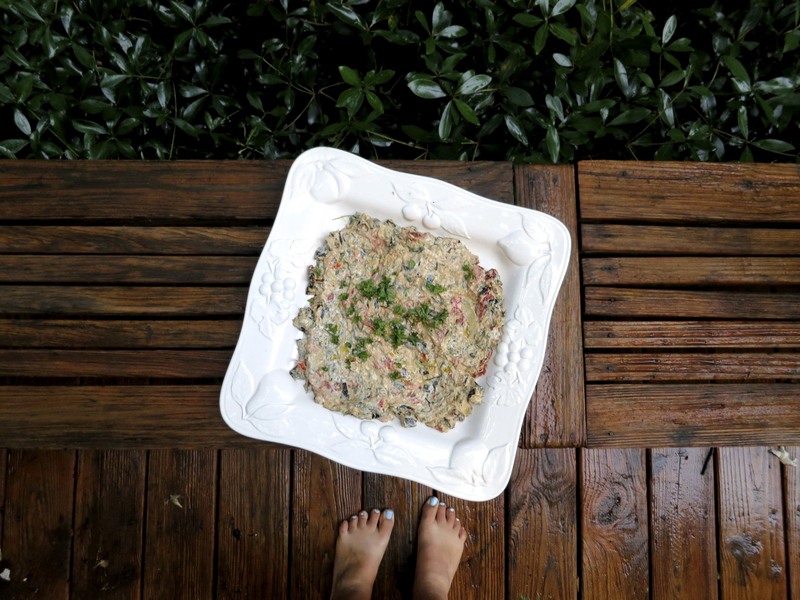 I also included a recipe for hummus because it’s just so basic… I’m shocked that we don’t have it in our recipe index yet! *Note that I modified the original recipe for this dish for American convenience and ease. So if you want the real thing, pick up a copy of Jerusalem. You won’t be disappointed! Preheat the oven to 425 F and cover two cookie sheets with parchment paper. Trim the zucchini and cut lengthwise into thin 3/4 inch pieces. Halve the tomatoes. Brush with olive oil and season with salt and pepper. Place zucchini and tomatoes cut side down on separate pans. Cook for 15 – 20 minutes until browned on the tops and edges. The veggies should be tender in the middle and crisp on the edges. Remove from oven and allow to cool. Meanwhile, mix all remaining ingredients (except for honey/date syrup) together and hold some parsley for garnish. Once cool, chop zucchini and tomatoes coarsely. Gently fold into mixture and spread over large, shallow bowl. Drizzle with olive oil and date syrup/honey, and garnish with parsley. 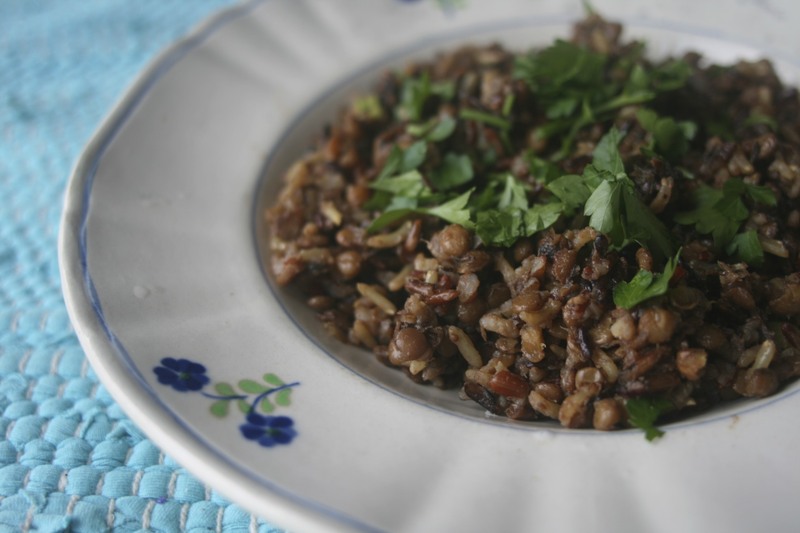 Serve with warm pita, couscous or your favorite bread. To roast beets and walnuts, preheat the oven to 350. Wrap the beets in foil, place them on a pan, and keep them in the oven for 15-25 minutes until soft. Place walnuts on a pan and keep them in the oven for 7-10 minutes until brown and fragrant. Allow to cool. *This can be done the night/day before. 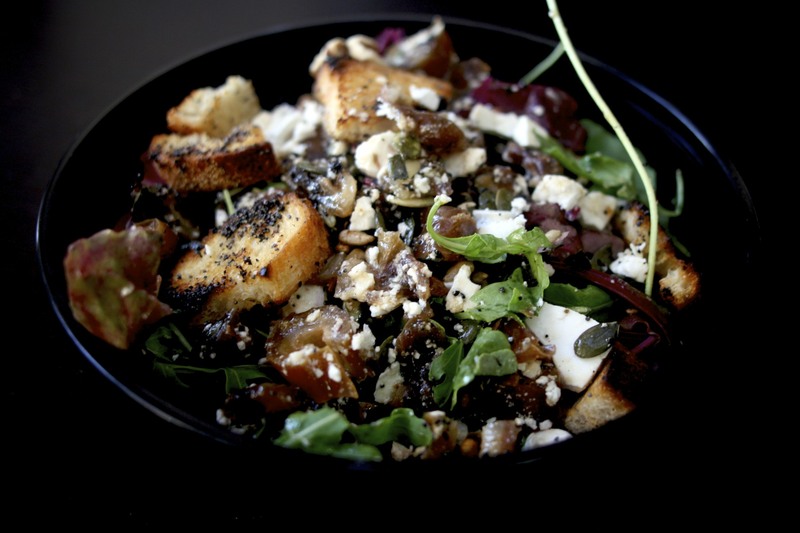 *You can also opt to leave the beets and walnuts raw for a crunchier, earthier dish. 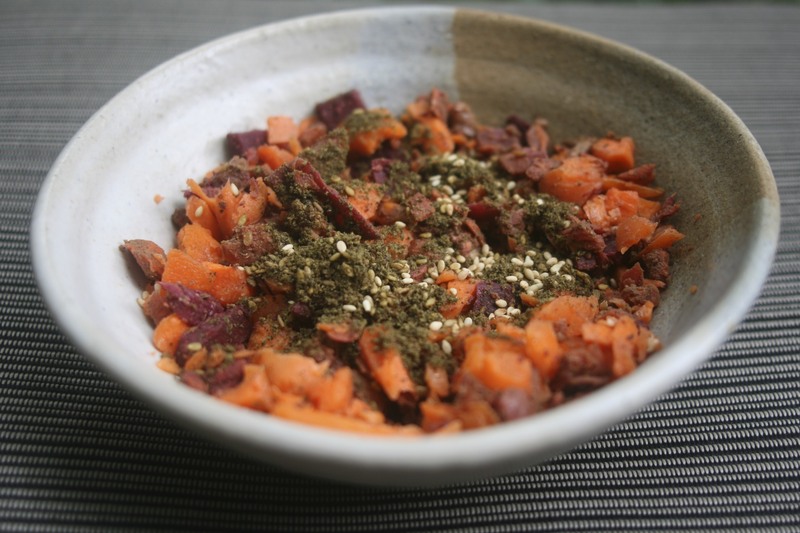 Chop raw carrots, roasted beets, walnuts and dates into small 1/4 inch chunks (you can do this in a food processor for ease, but make sure that you don’t pulverize too much) and mix. 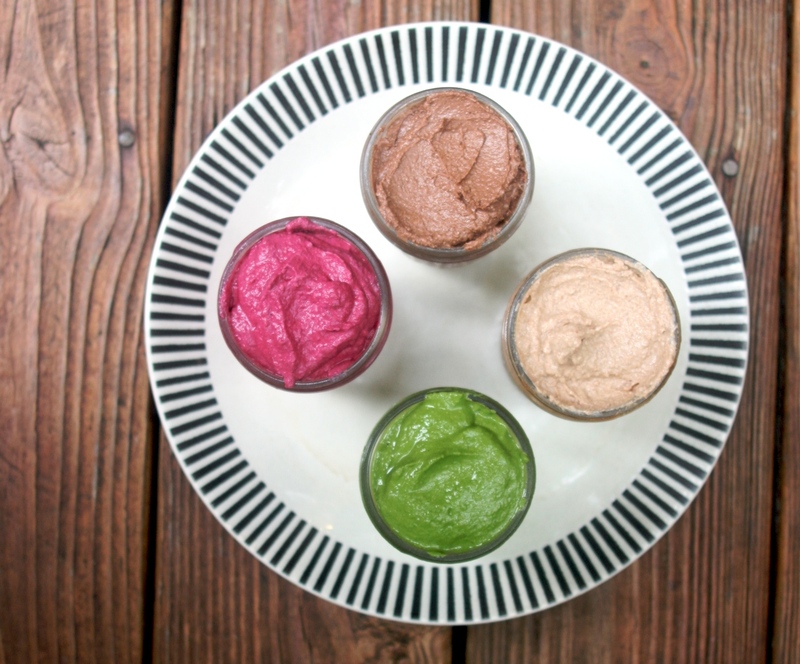 In a separate bowl, mix tahini paste, olive oil, water, lemon zest, lemon juice and sesame seeds into a fluid paste. 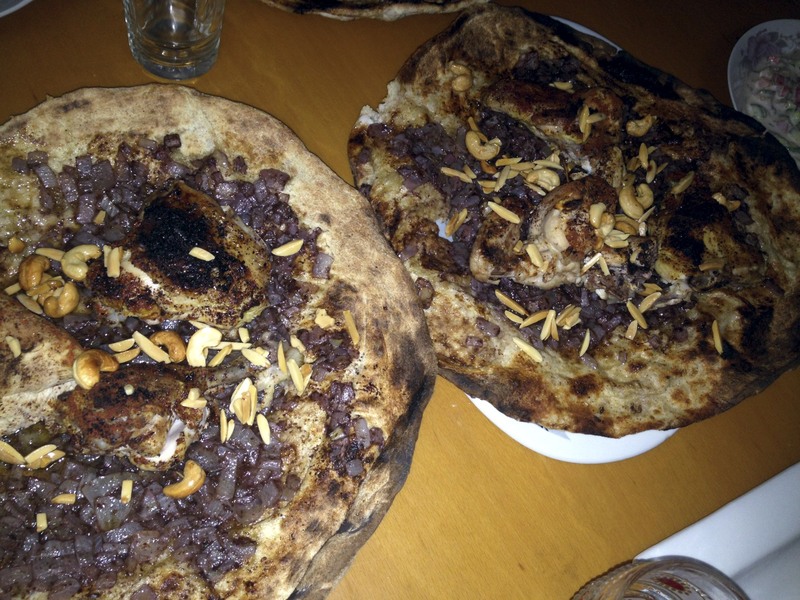 Combine all ingredients and add zatar and salt to taste. Eat as a crunchy, healthy breakfast salad on its own, top with plain yogurt, or use as an accompaniment in sandwiches and pitas. The possibilities are endless. 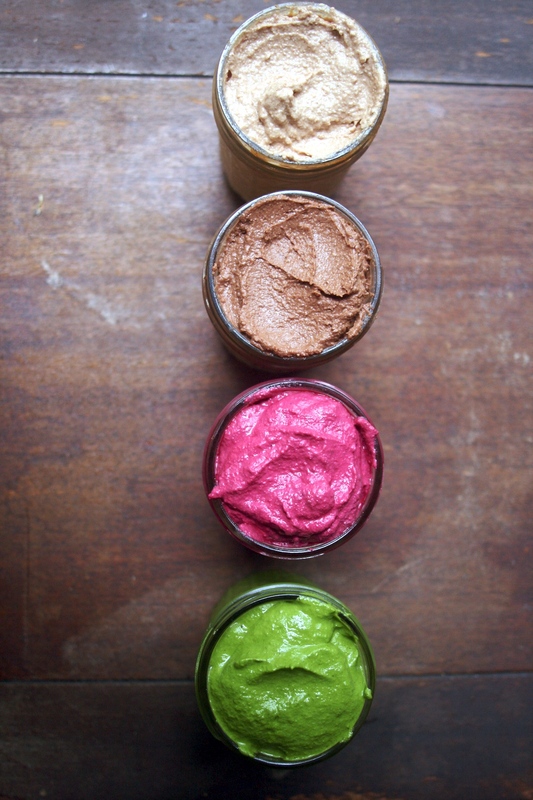 Puree all ingredients in food processor until smooth and creamy. Play around with optional additions and garishes. 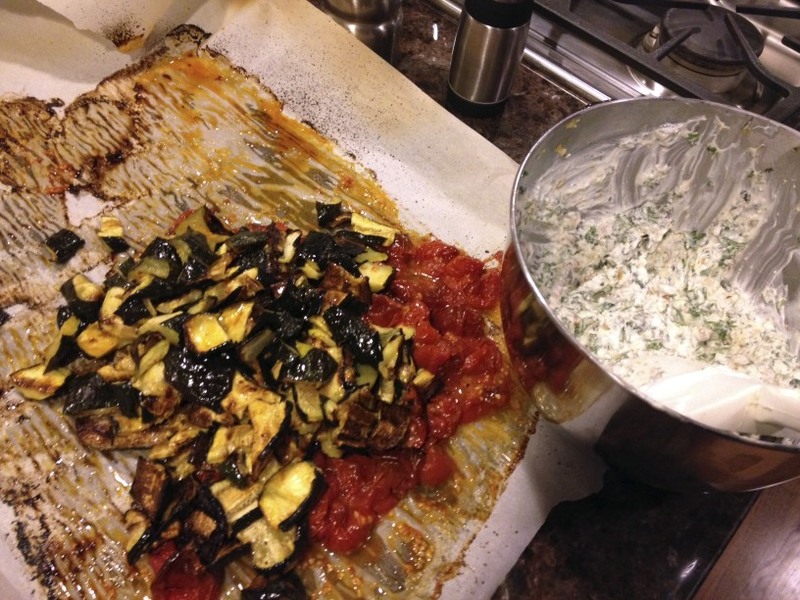 Serve with warm pita, french fries :), roasted veggies, salads, chips… anything! 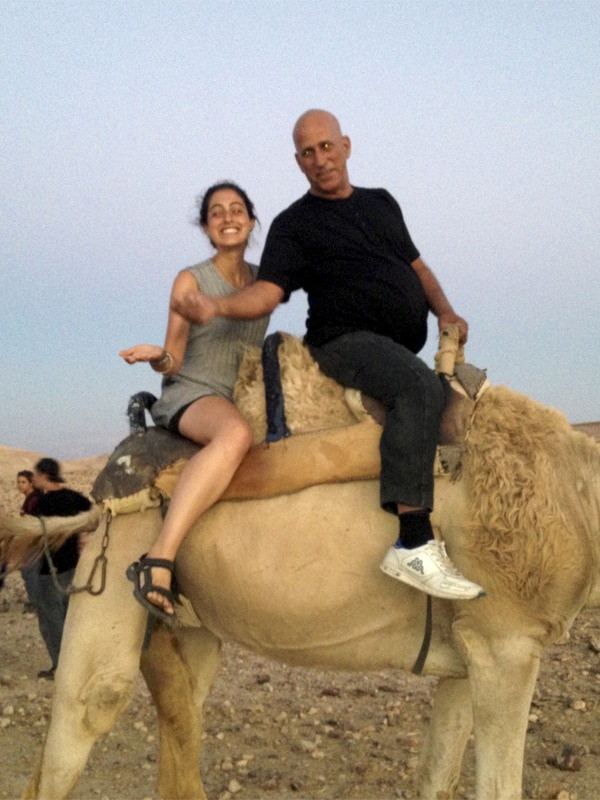 Sivan and I always held up the caboose… I the sheep herder and she the body guard. 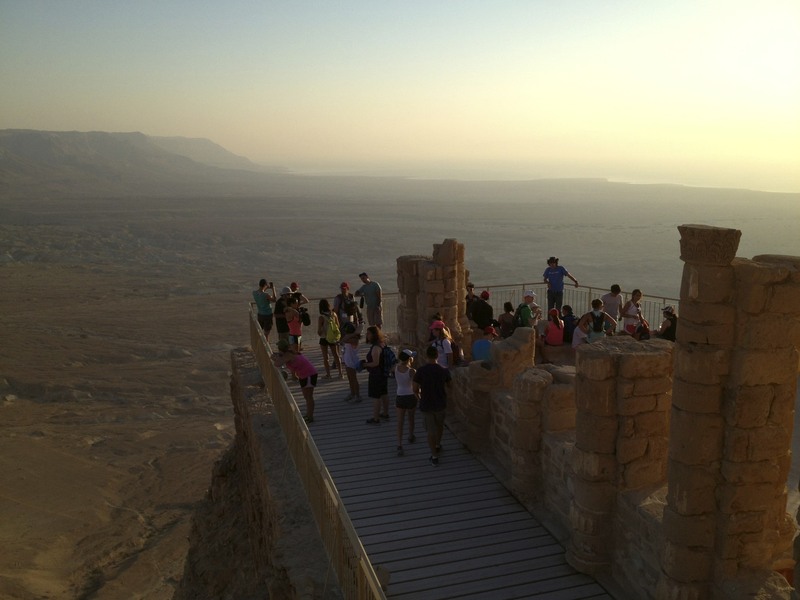 Here, we rest at Masada while waiting for kids in the bathroom. Always in the freakin bathroom. 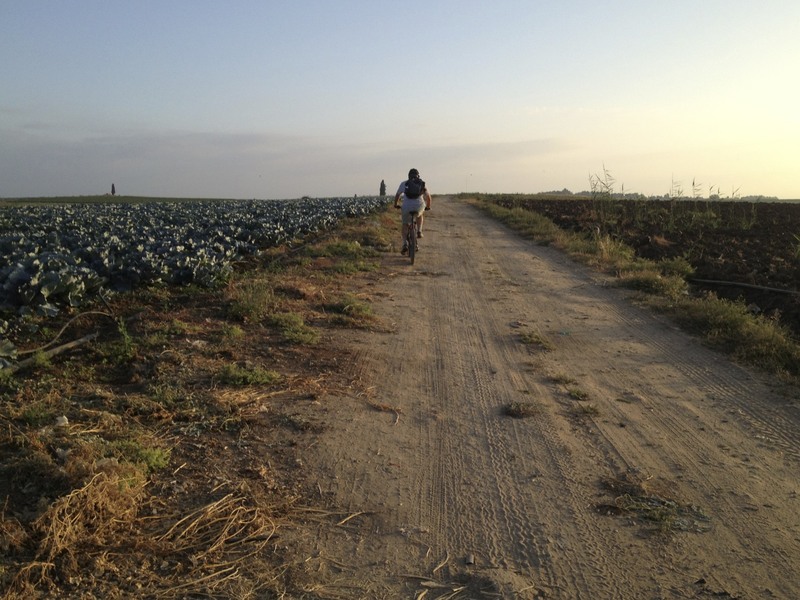 In the mornings Hanoch showed me the agriculture fields near his house. He rode his bike and I jogged after him. 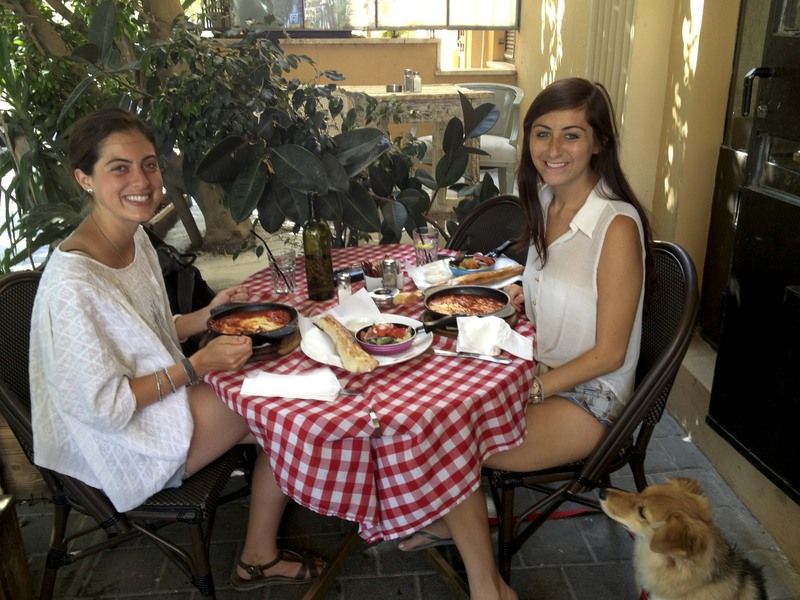 Reunited with a long lost friend in Tel Aviv with shakshuka yum!